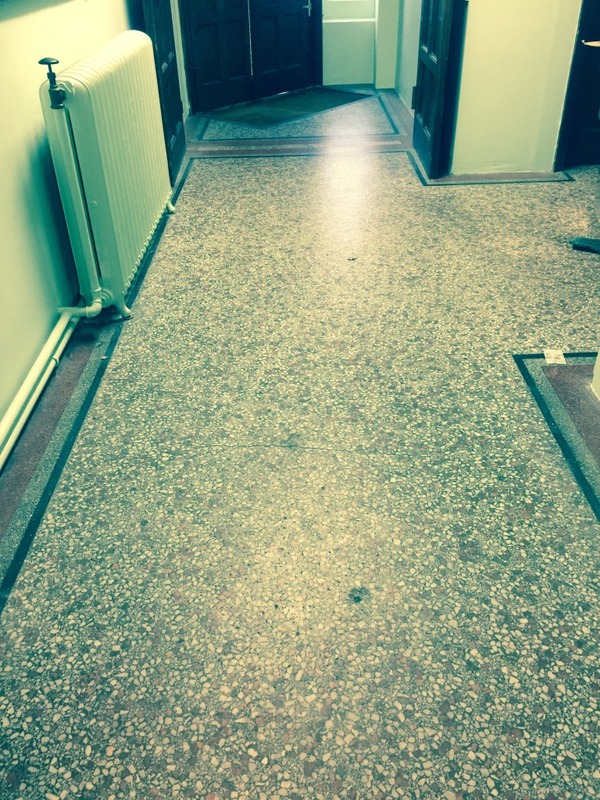 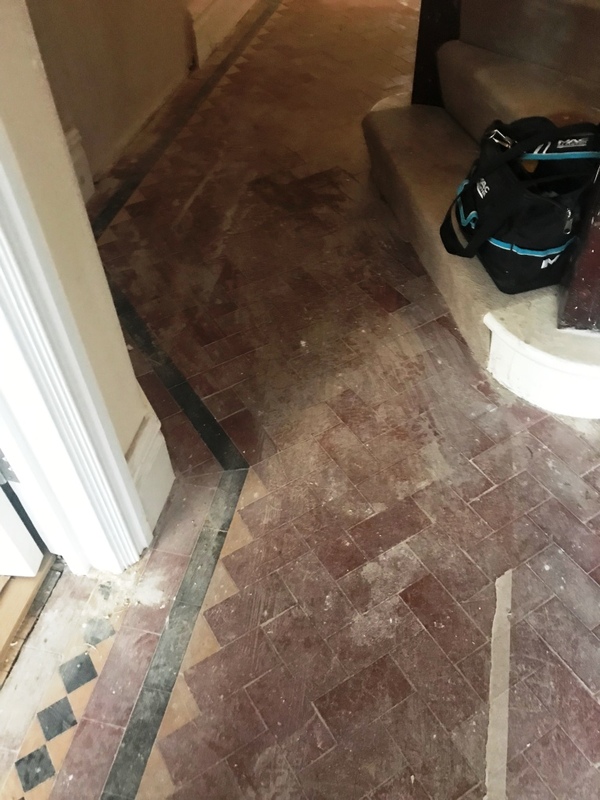 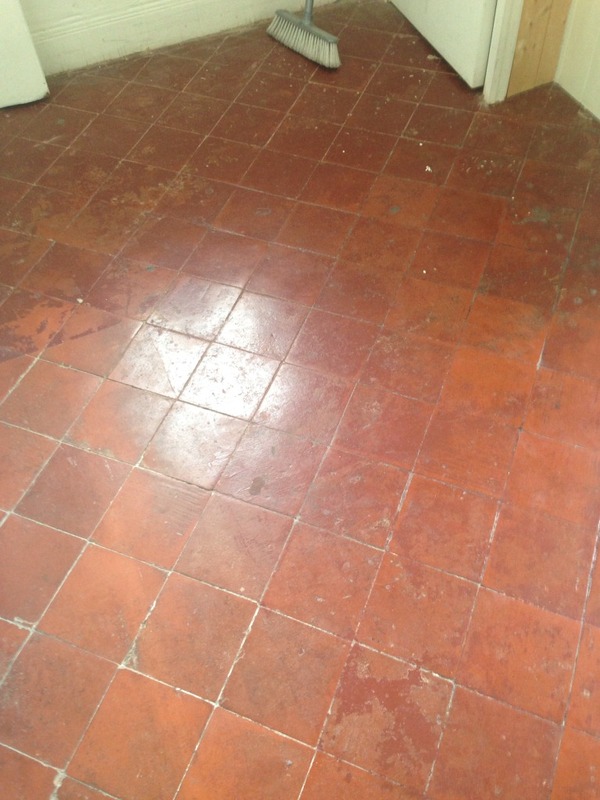 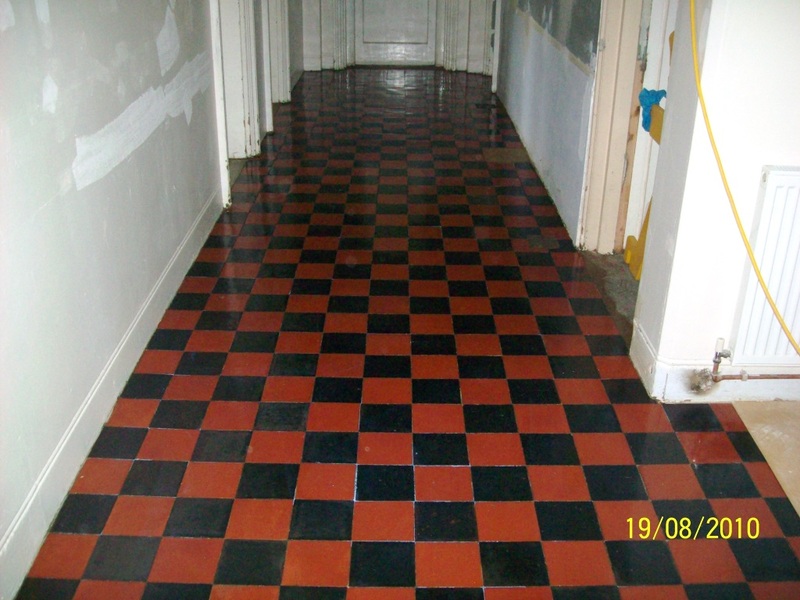 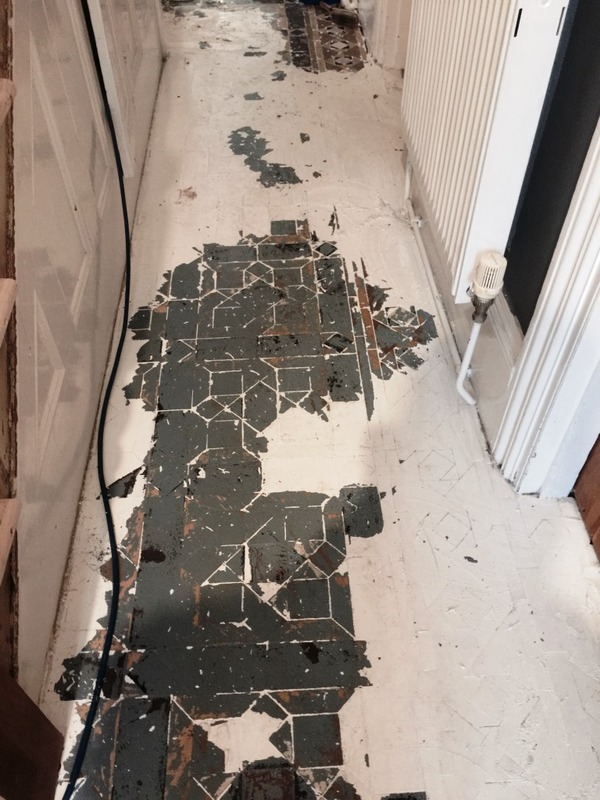 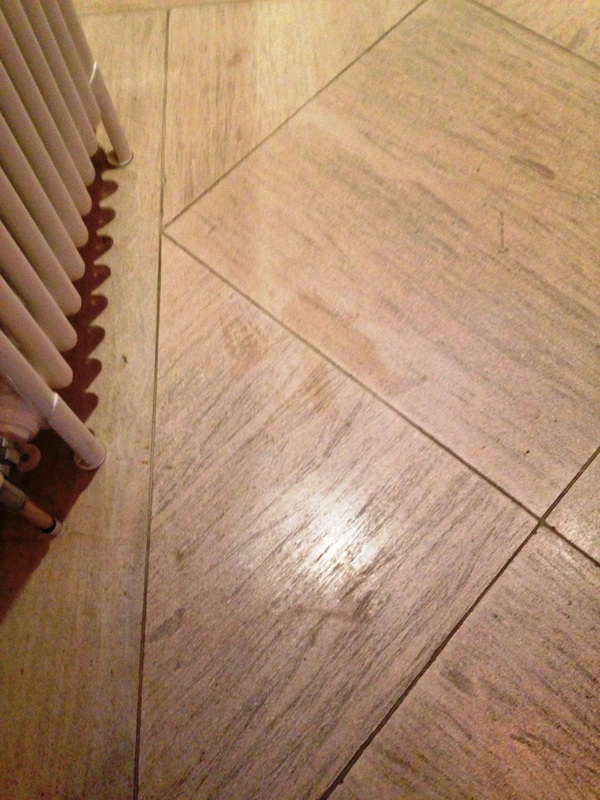 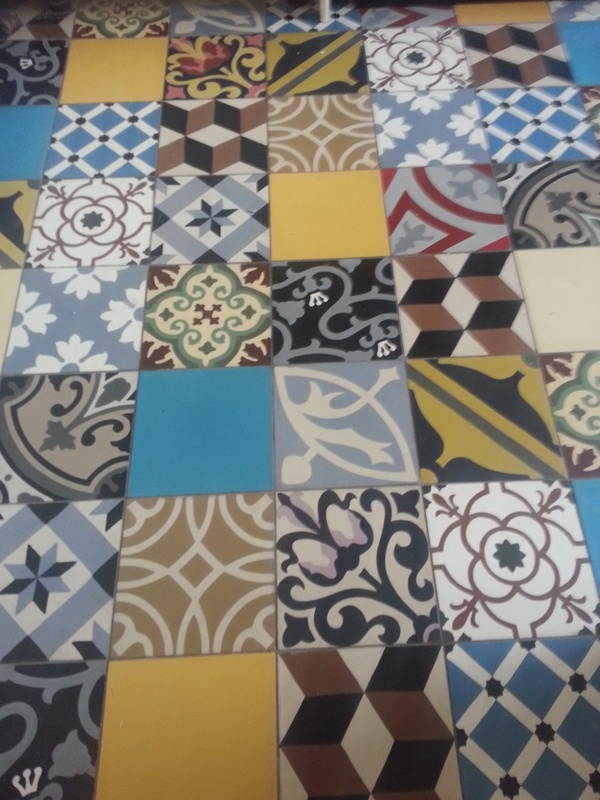 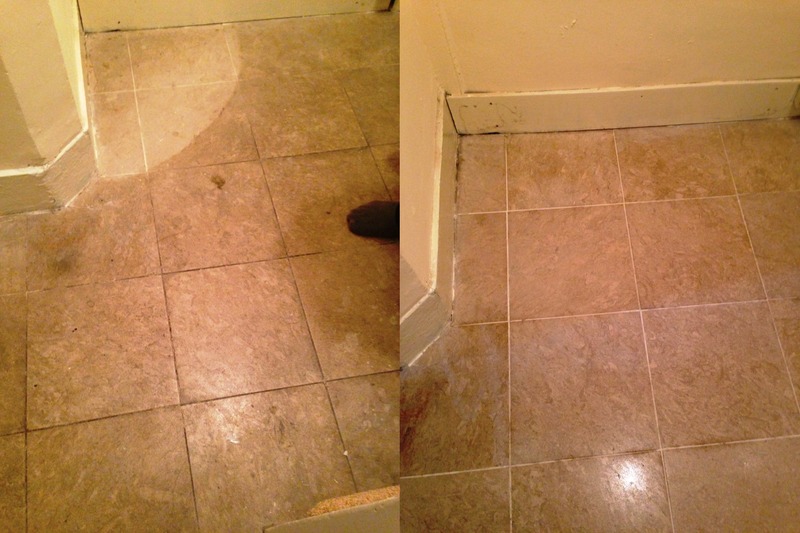 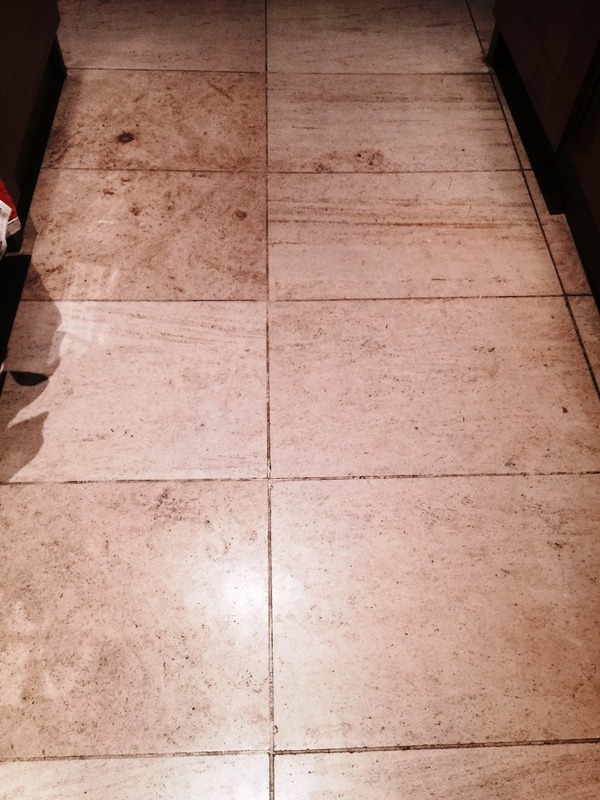 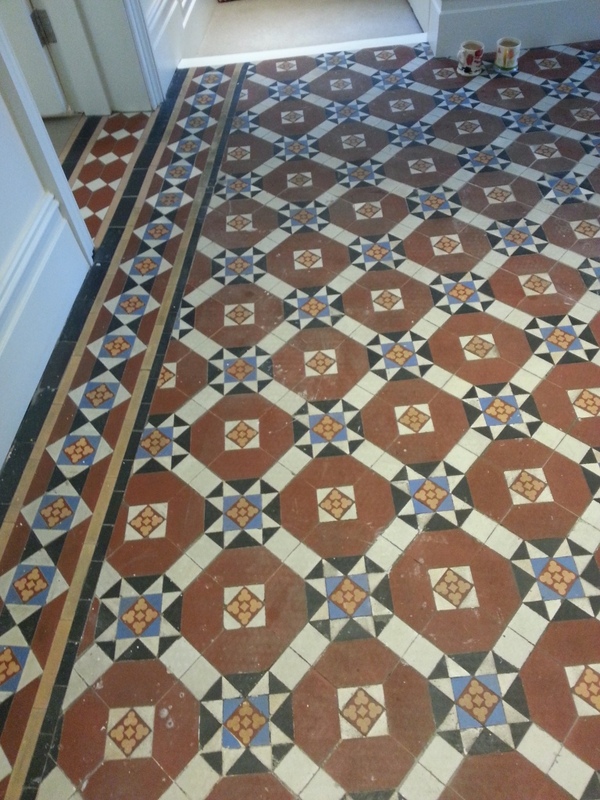 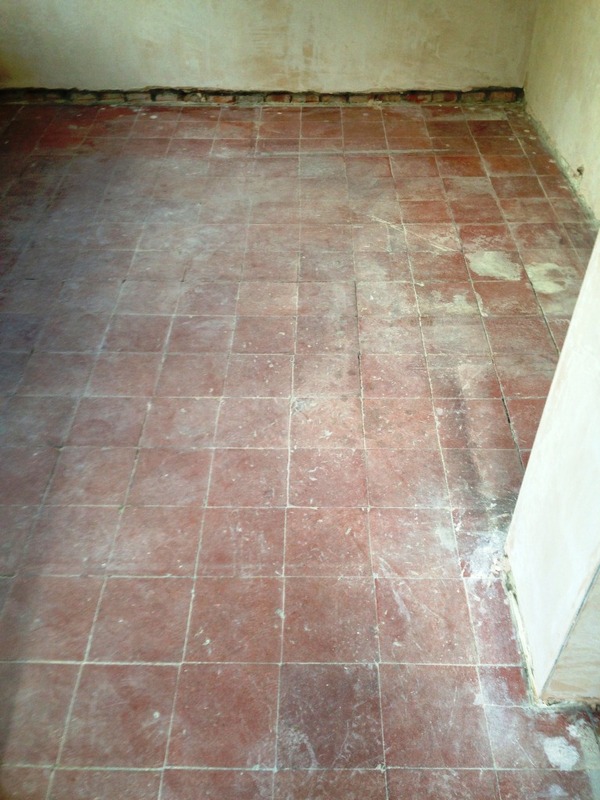 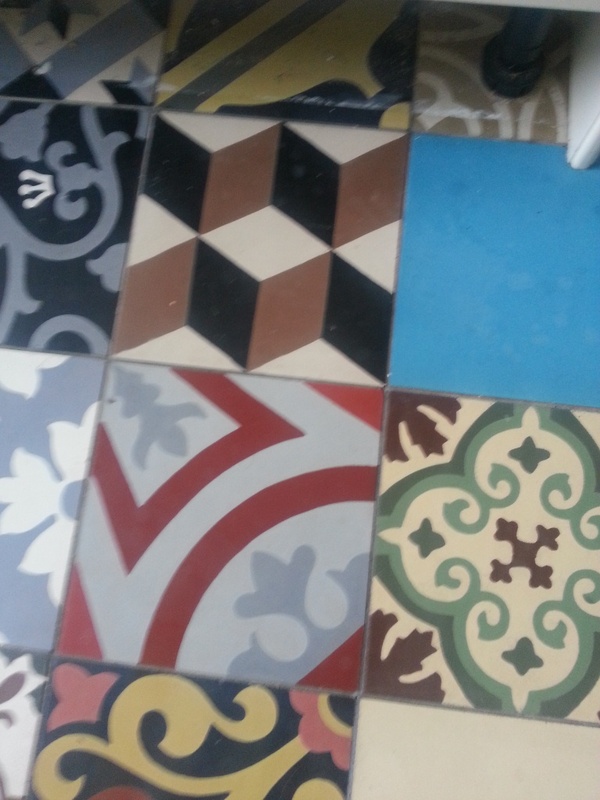 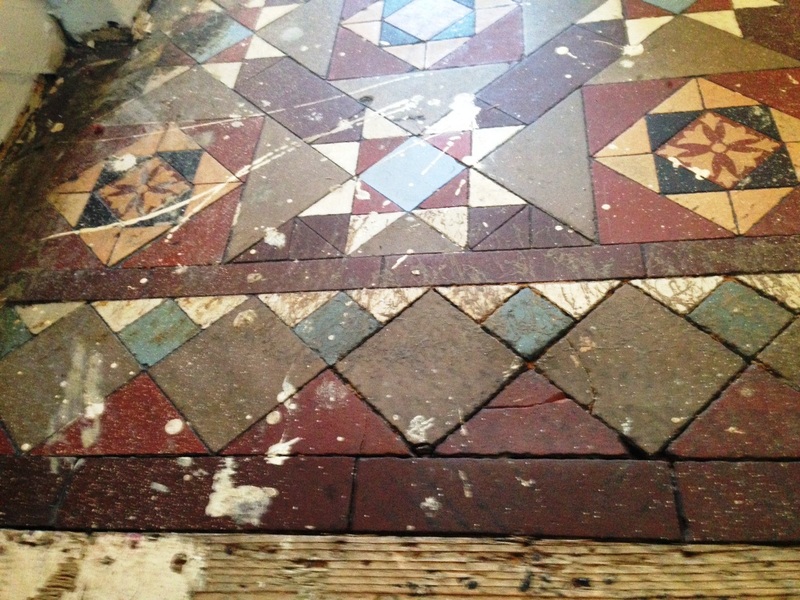 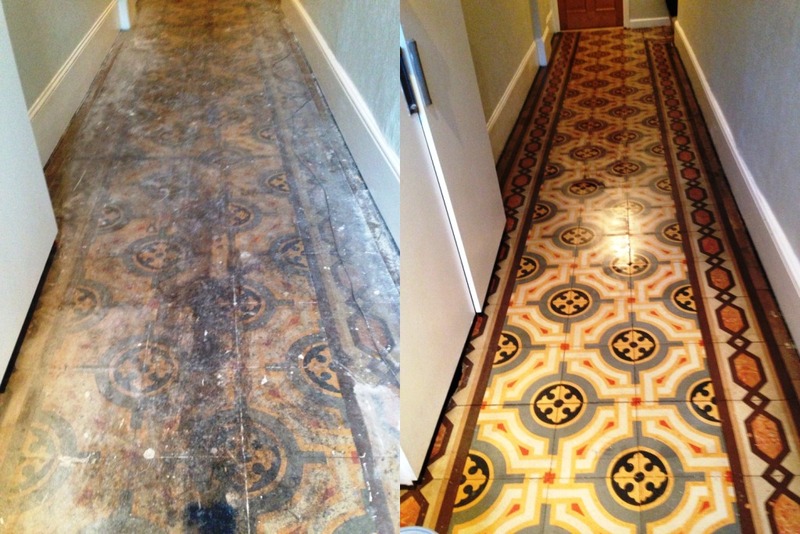 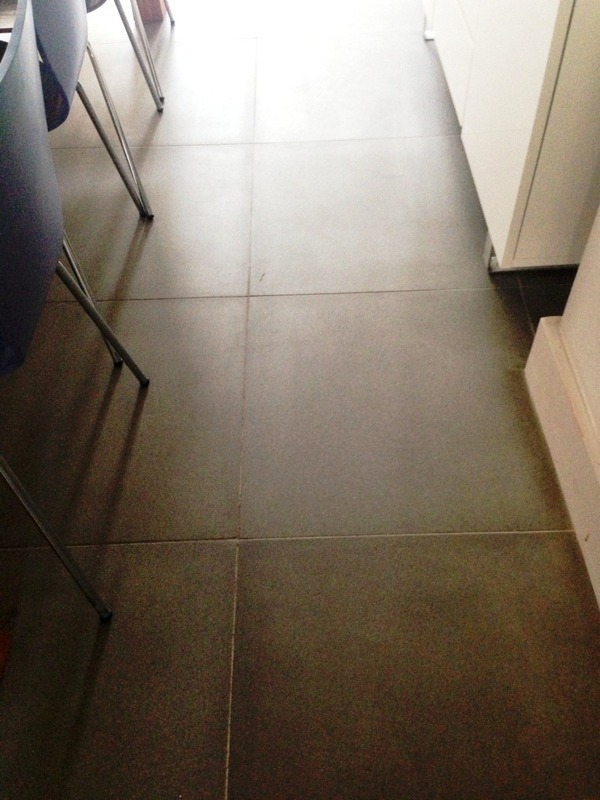 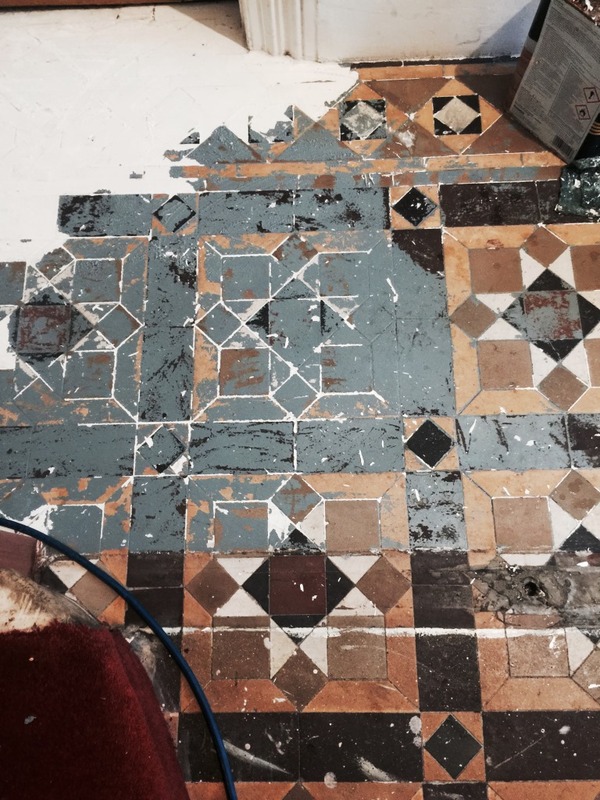 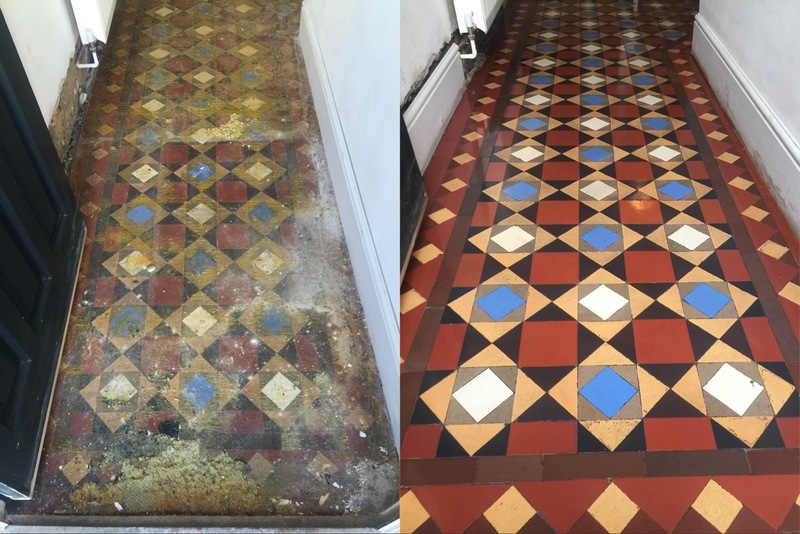 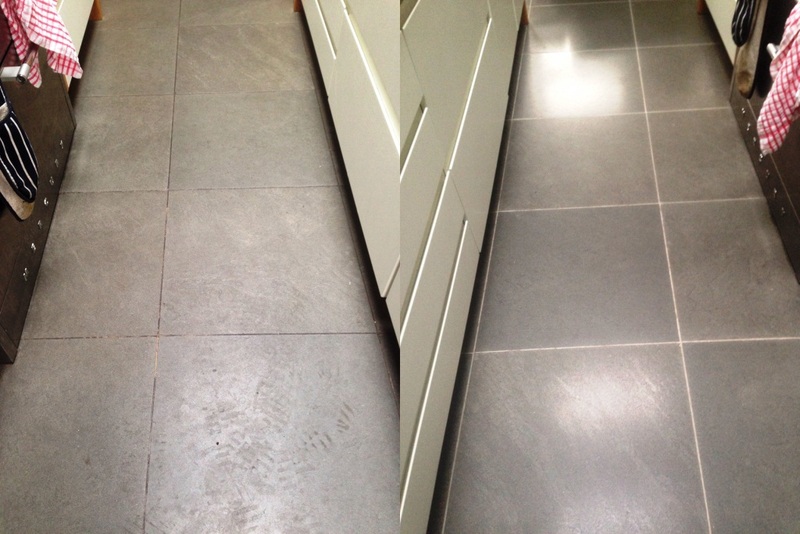 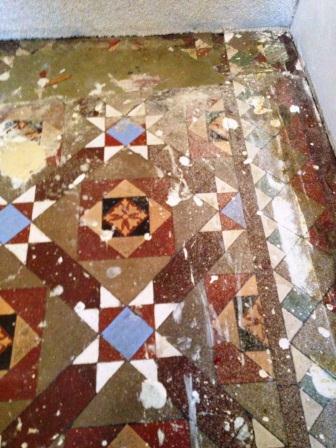 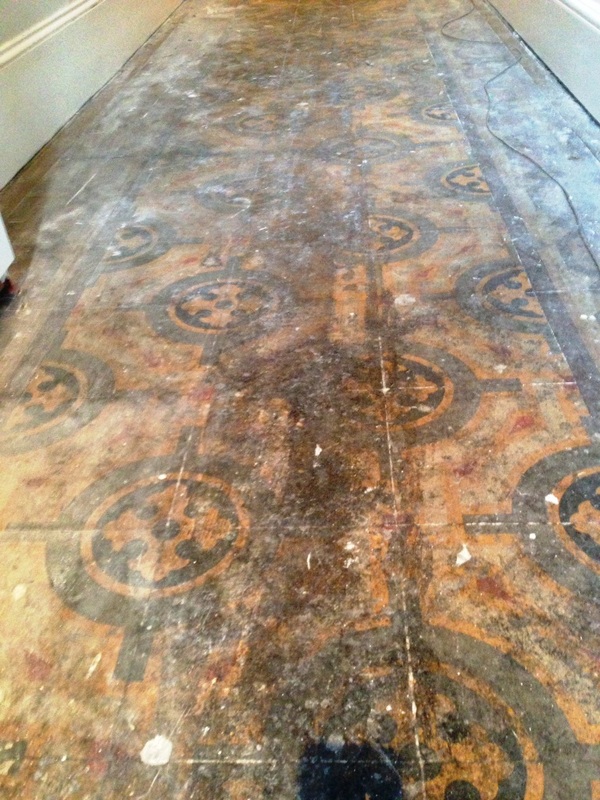 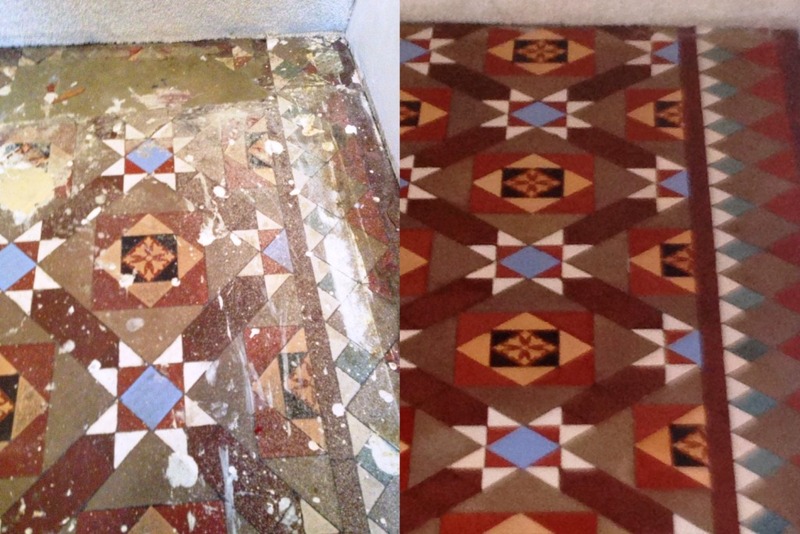 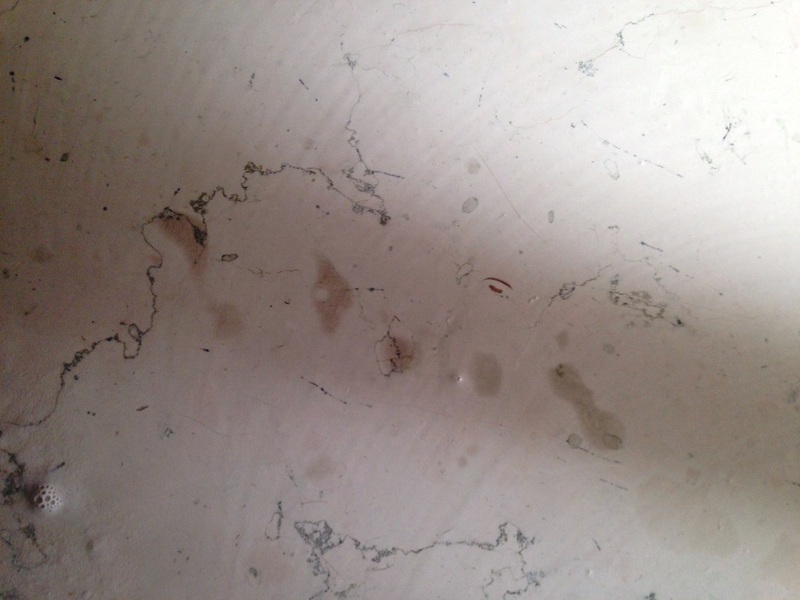 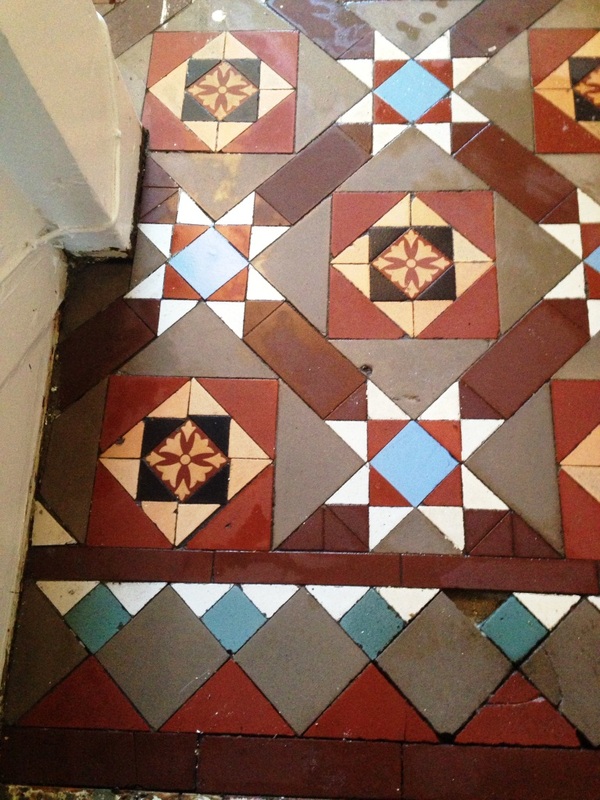 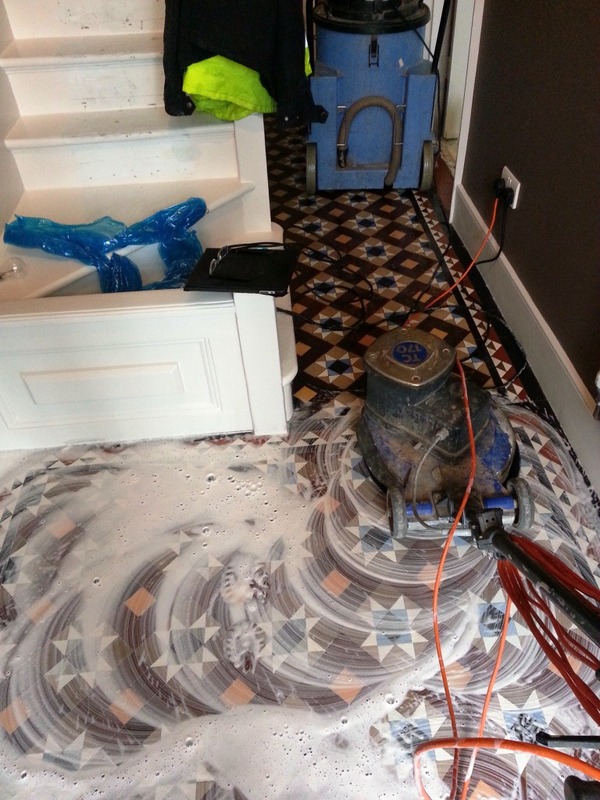 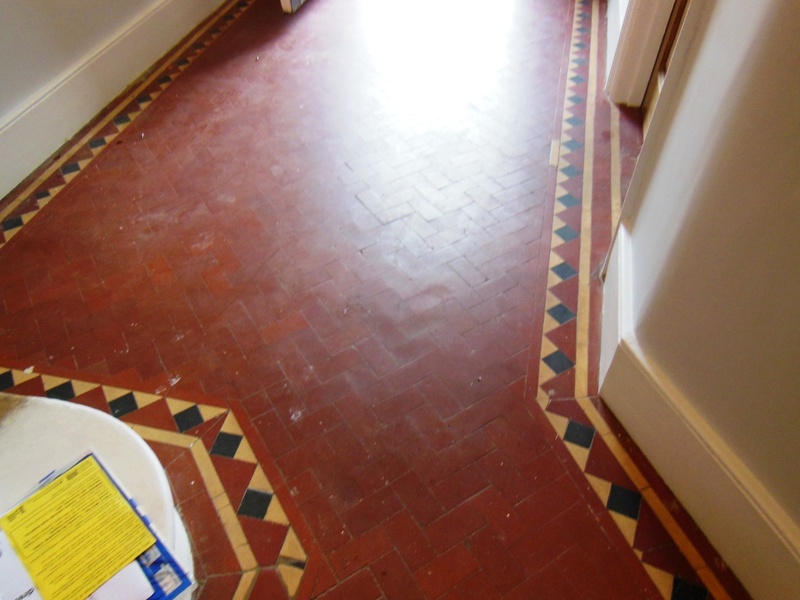 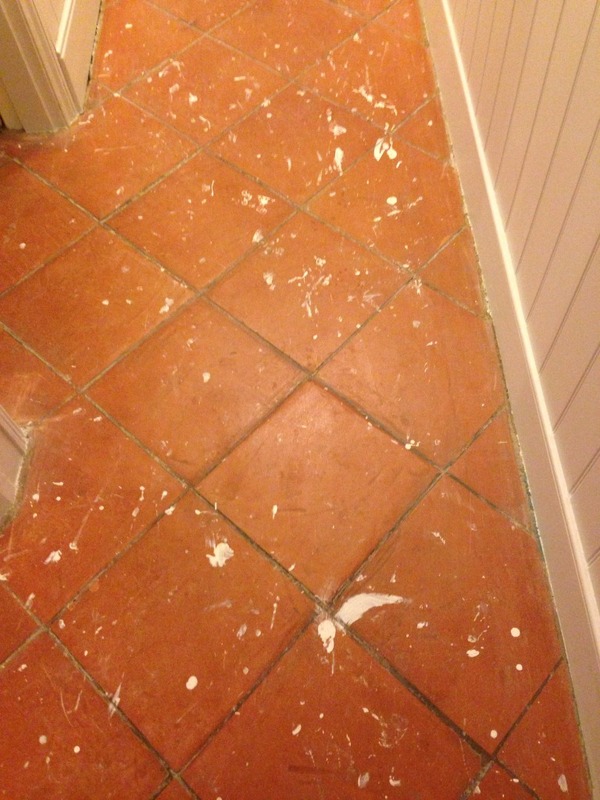 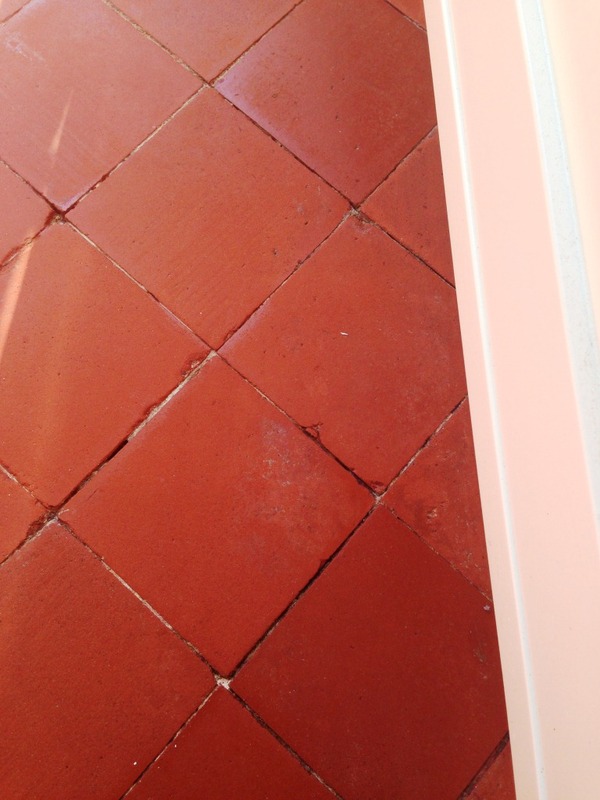 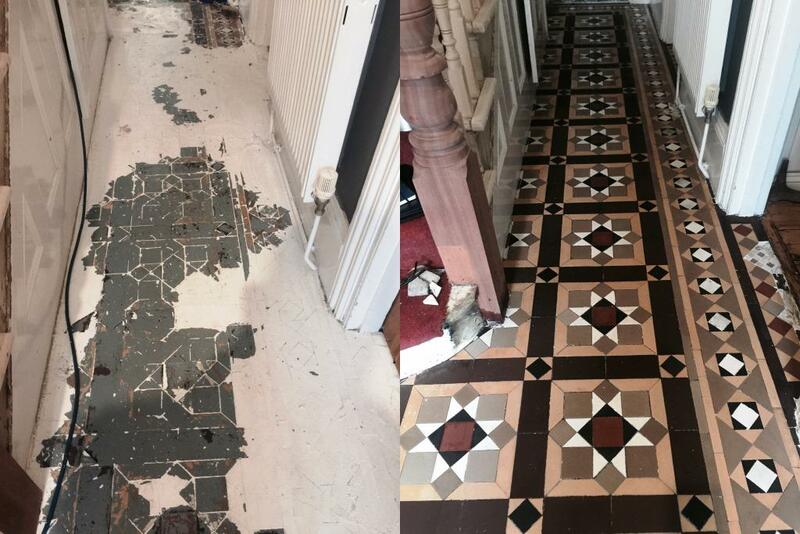 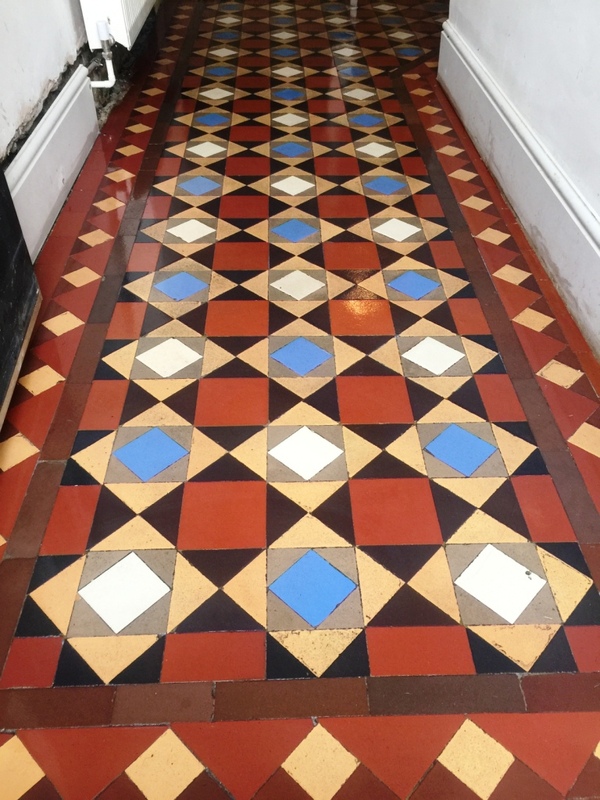 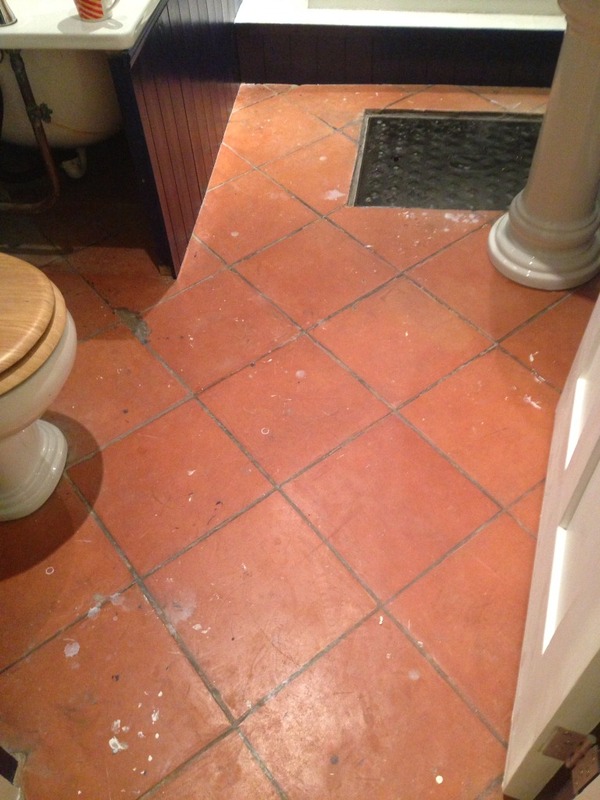 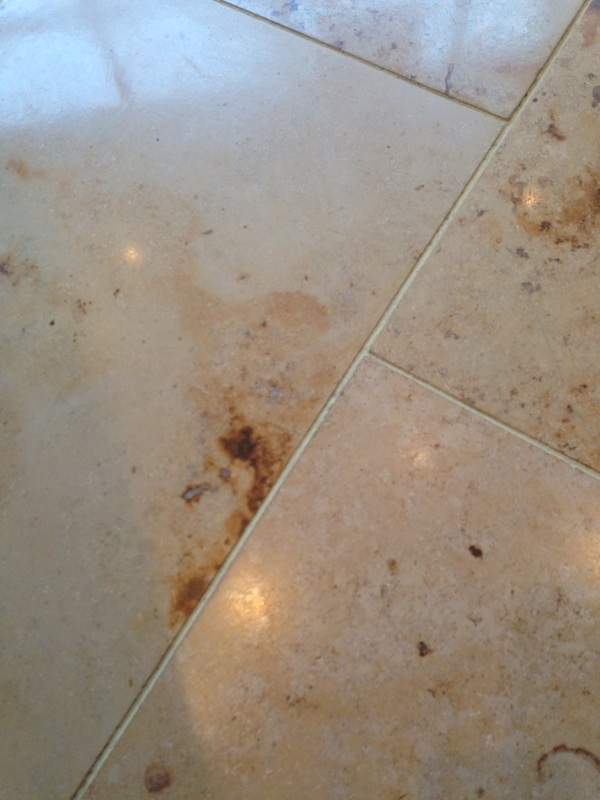 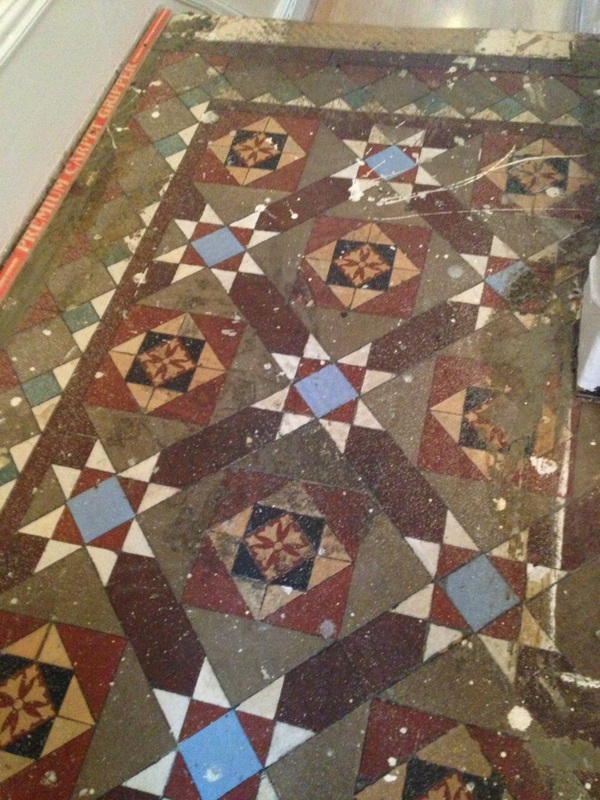 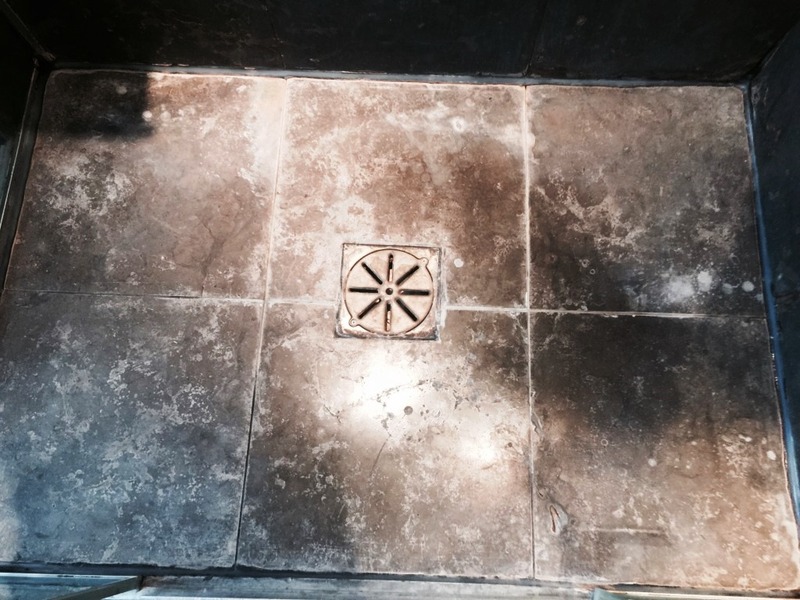 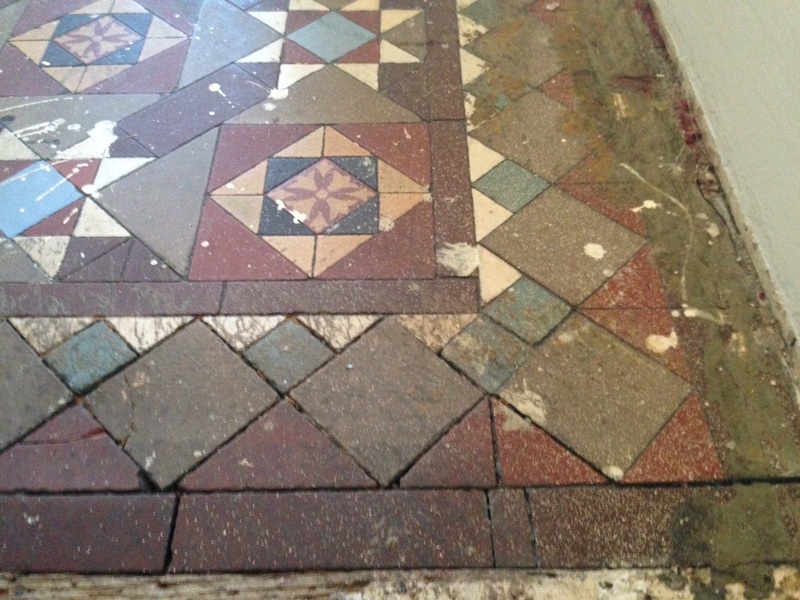 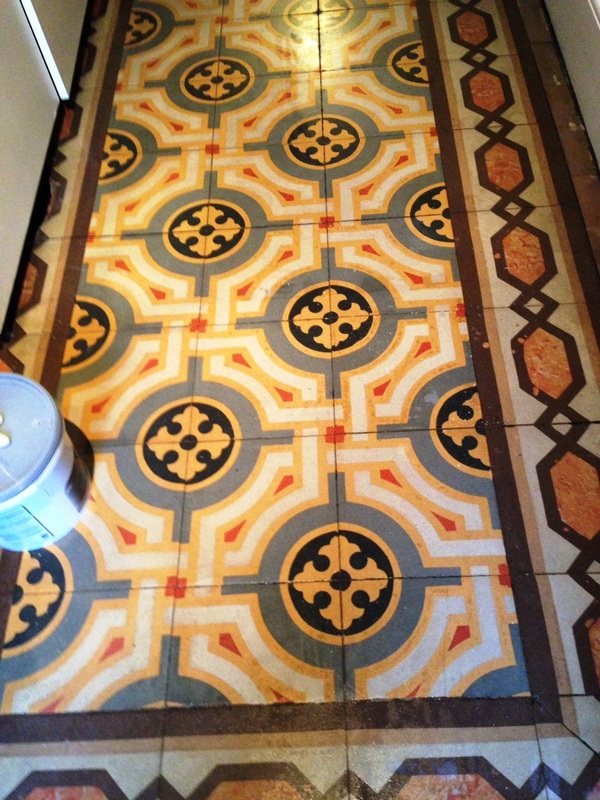 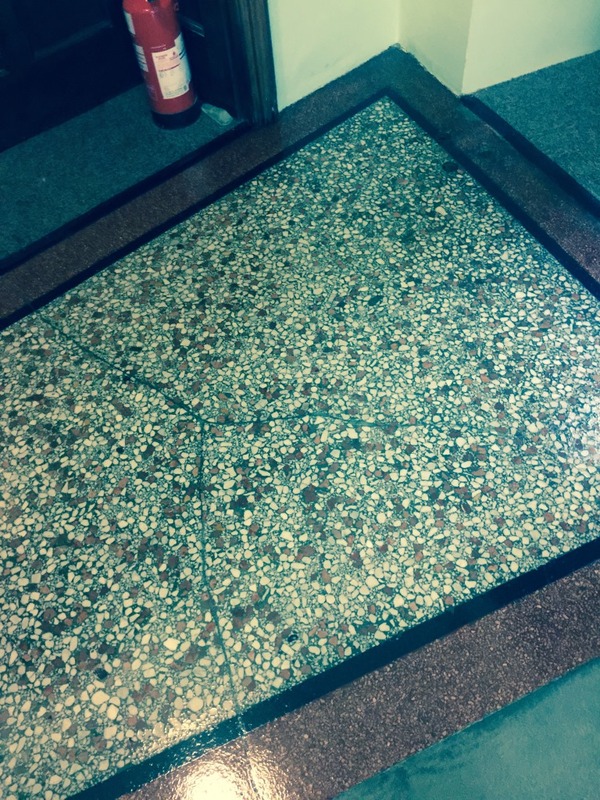 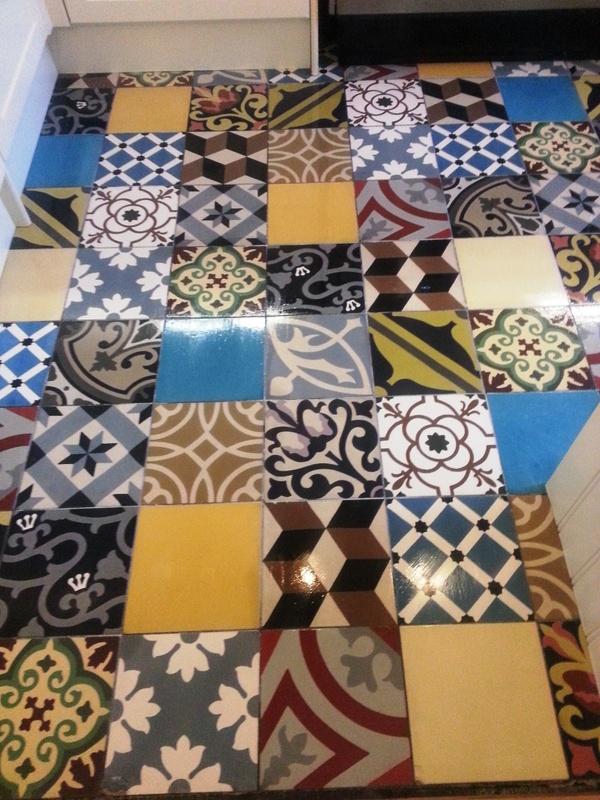 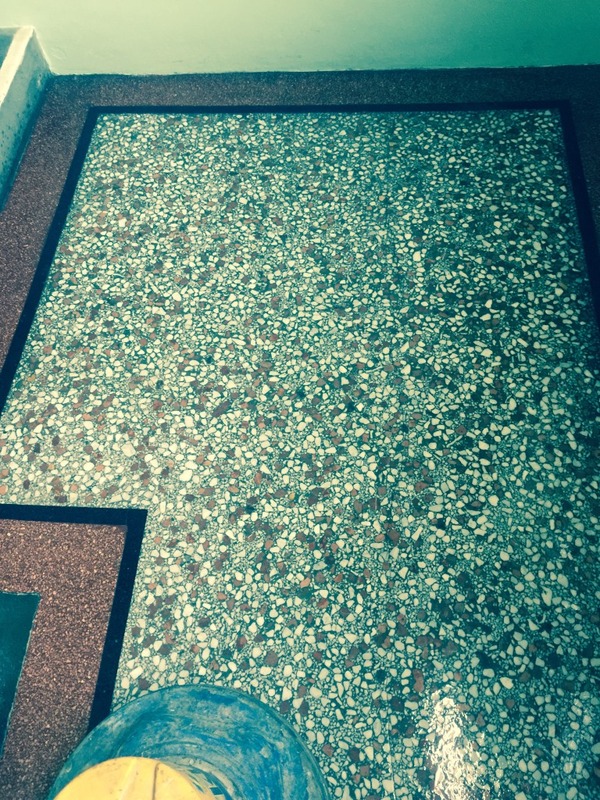 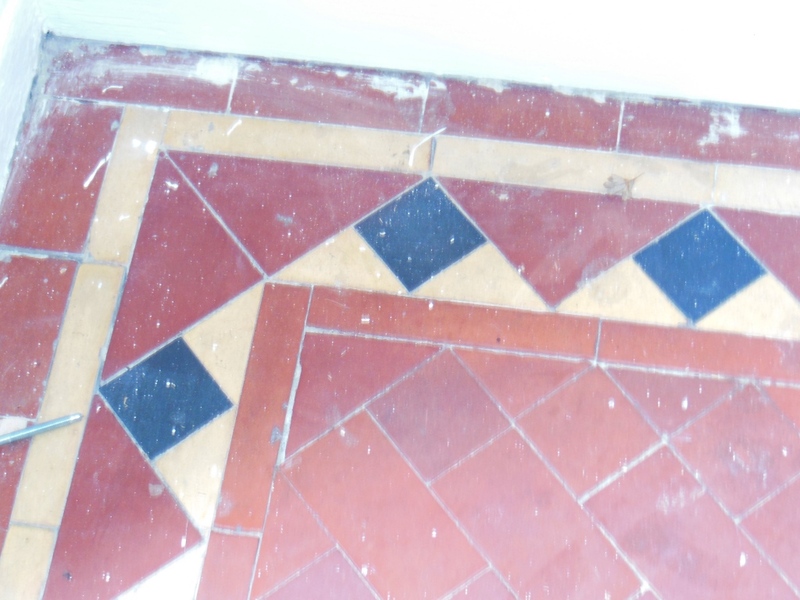 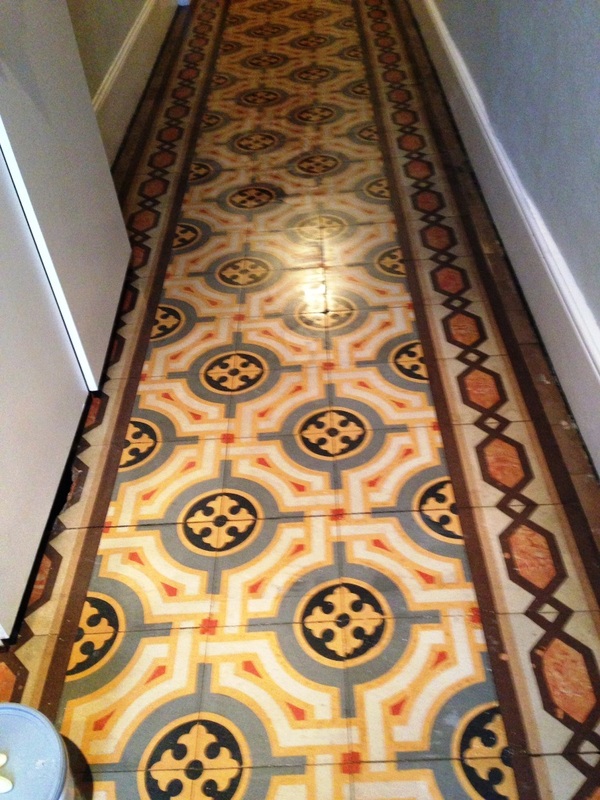 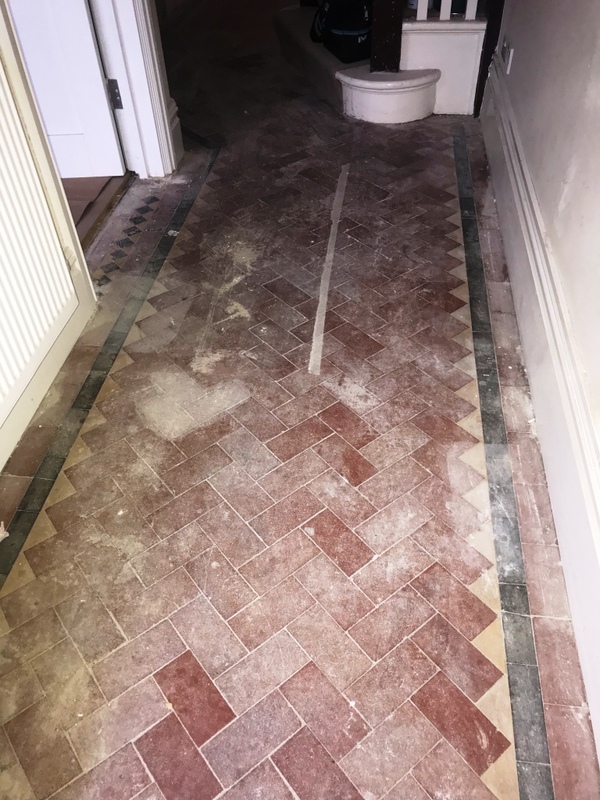 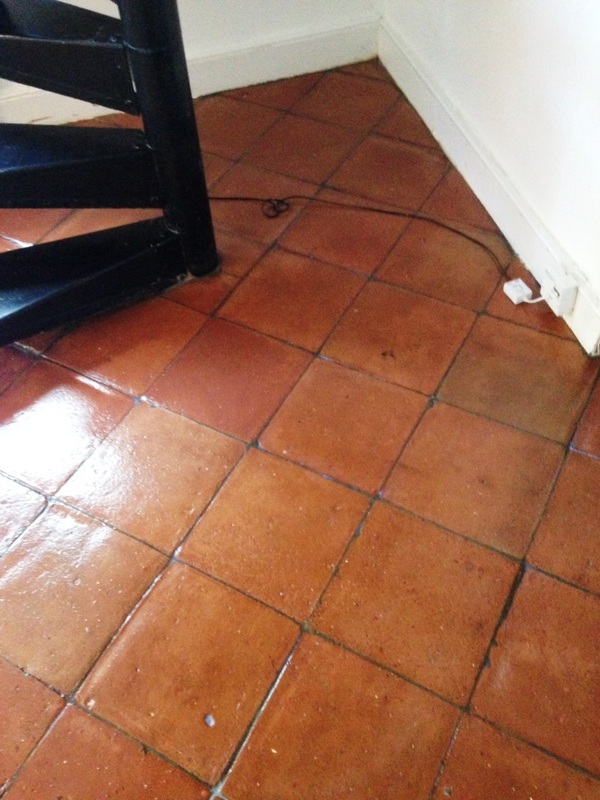 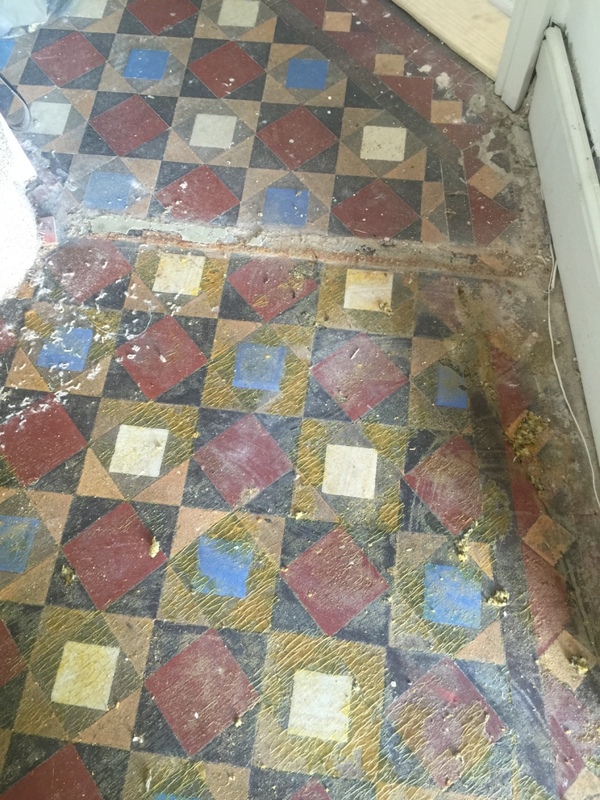 This Victorian tiled floor at a house in Fulham was in an absolutely horrendous state. 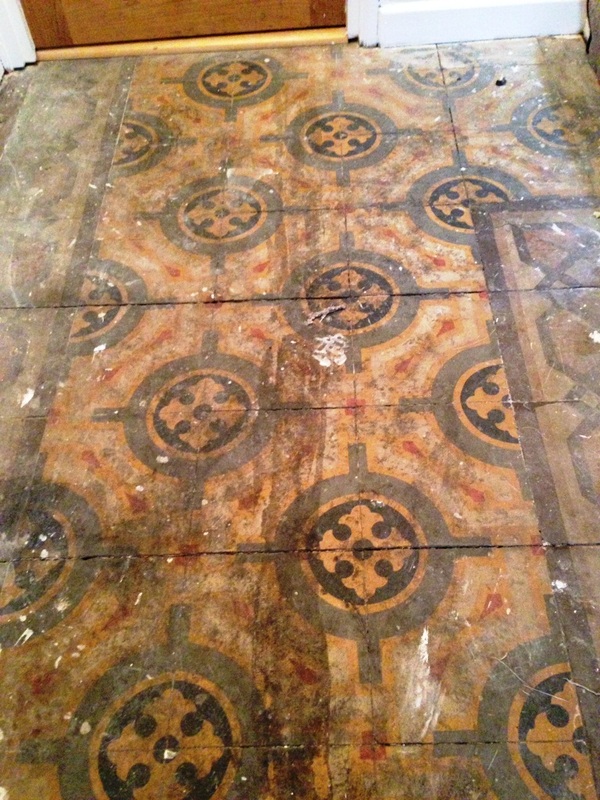 As you can see from the first photograph, the tiles were caked in layer upon layer of muck, including paint and glue stains. 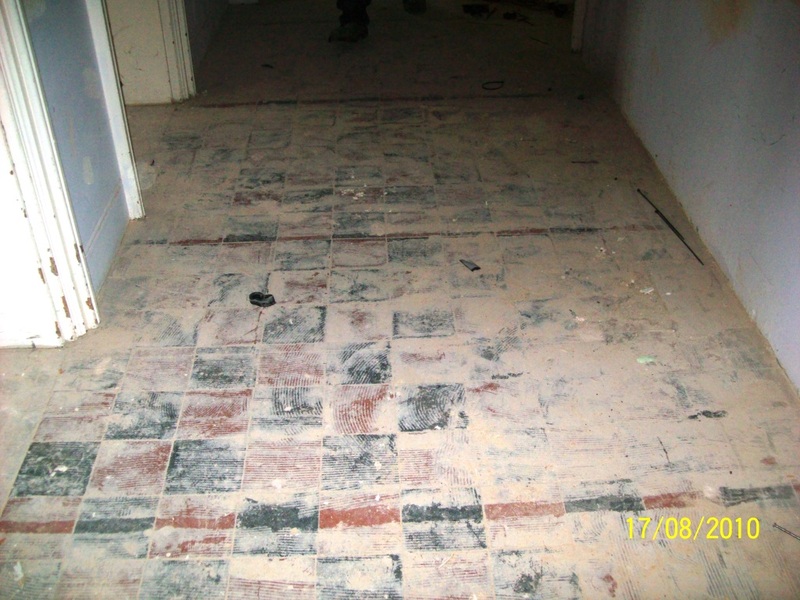 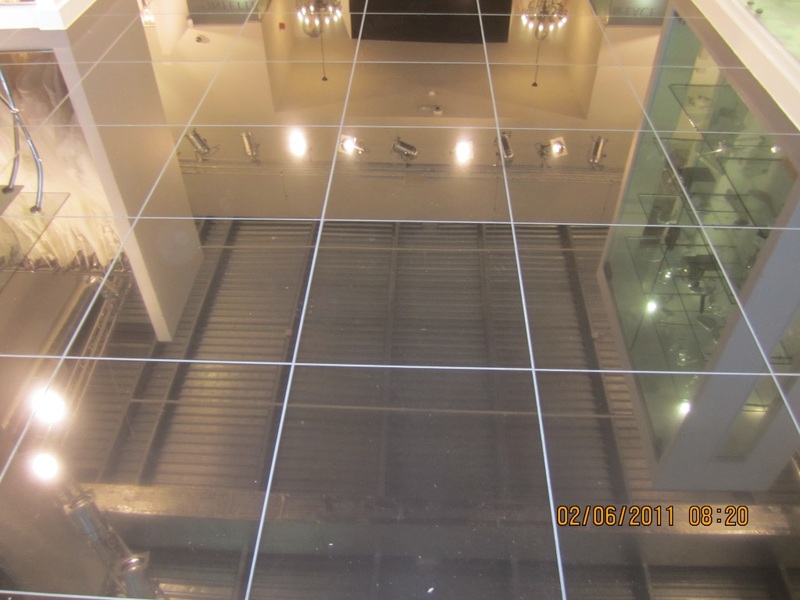 This was due to the floor being unknowingly hidden for many, many years under carpet. 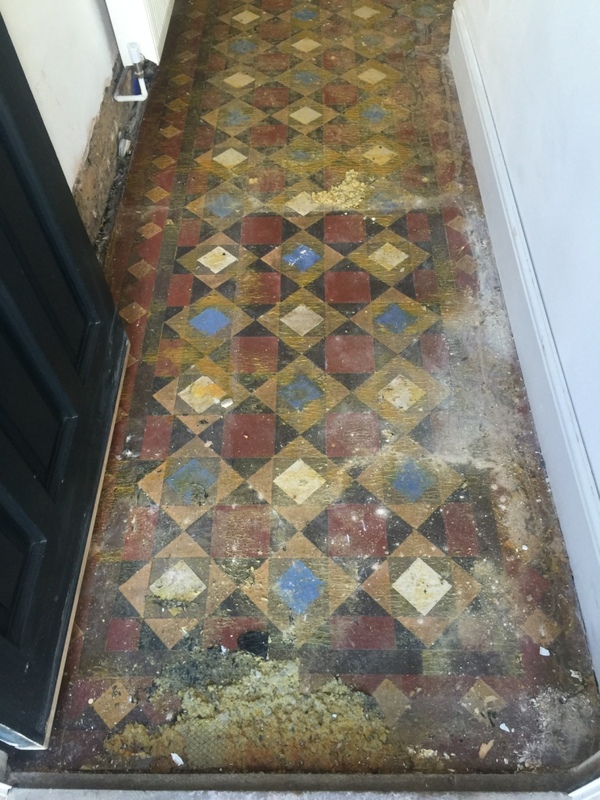 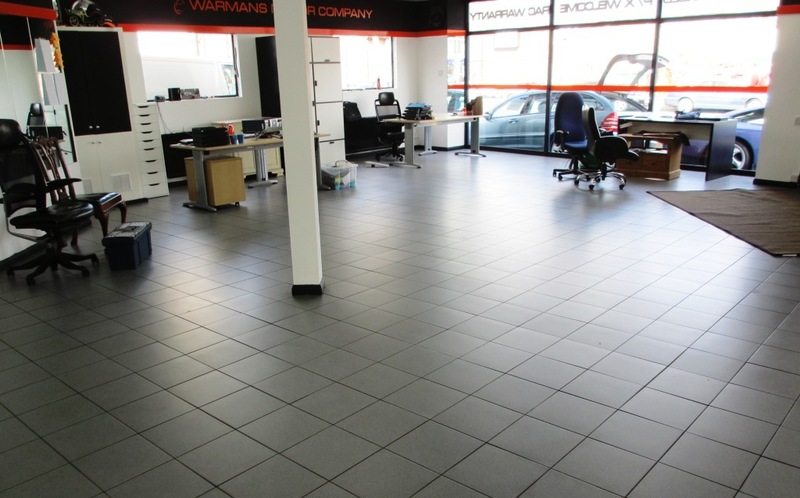 Needless to say, the property owner was desperate to remedy get the fantastic pattern floor back into good nick, and so contacted me for assistance. 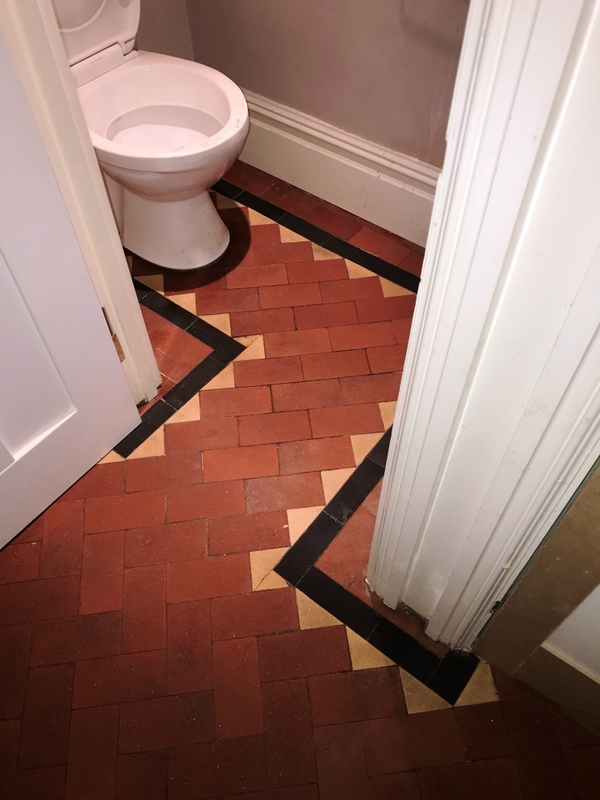 I travelled up to the property in the town of Fulham in South West London, which is famous for its football club, to survey the situation and begin the work. 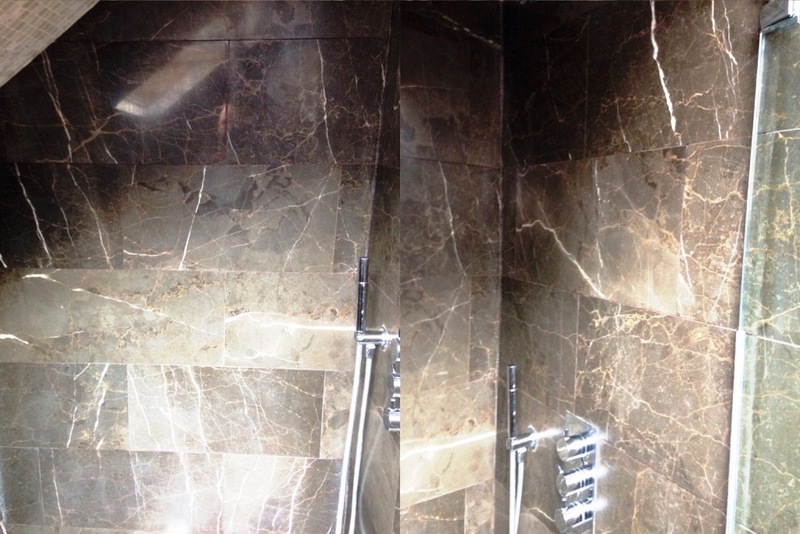 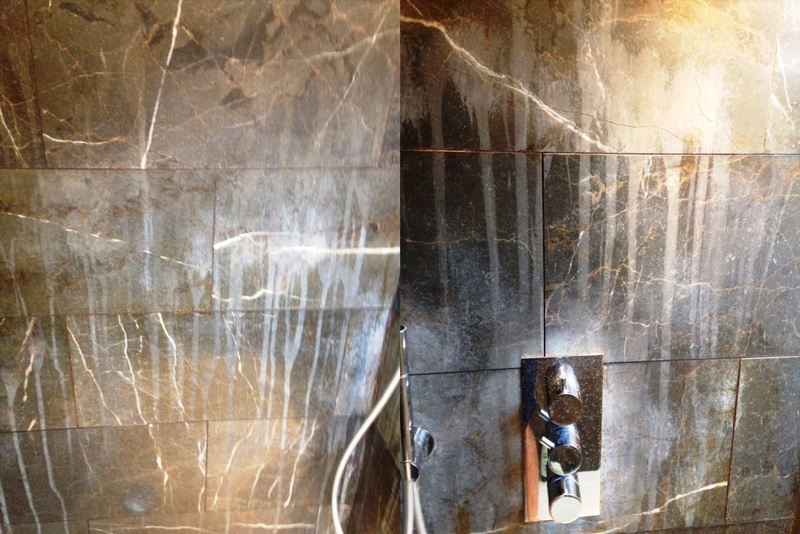 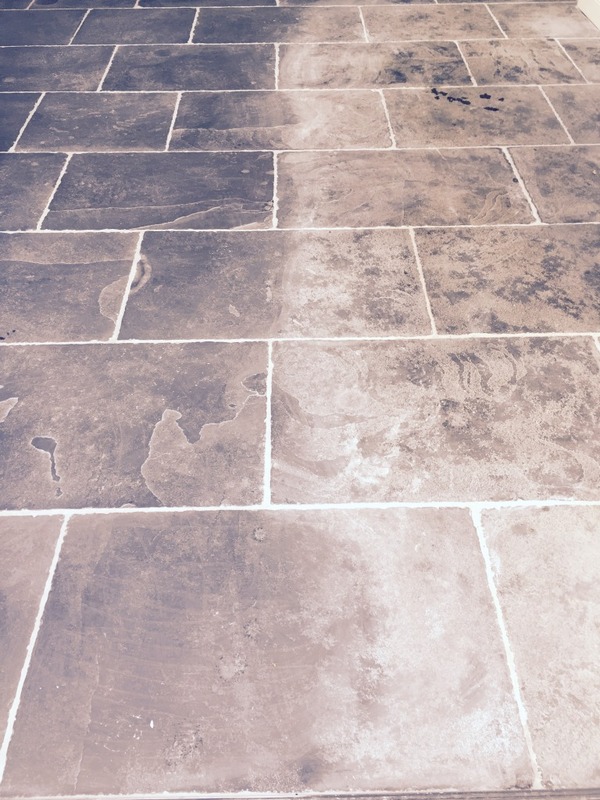 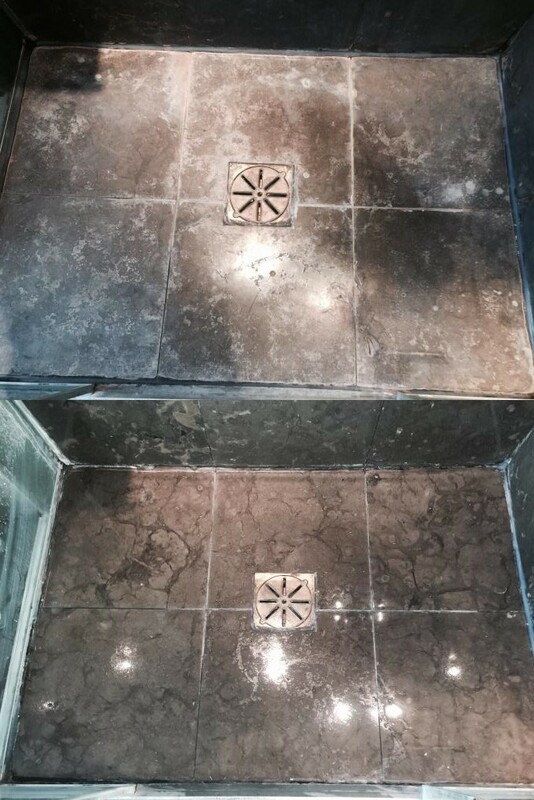 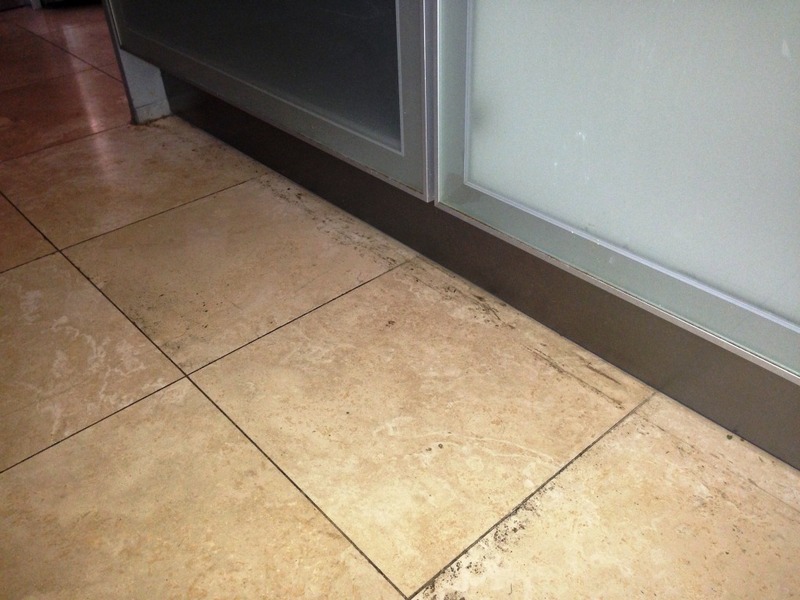 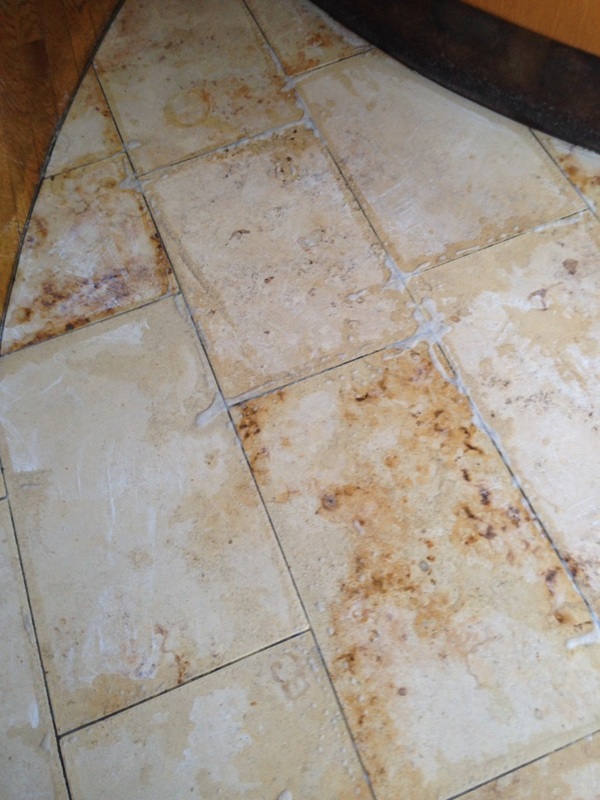 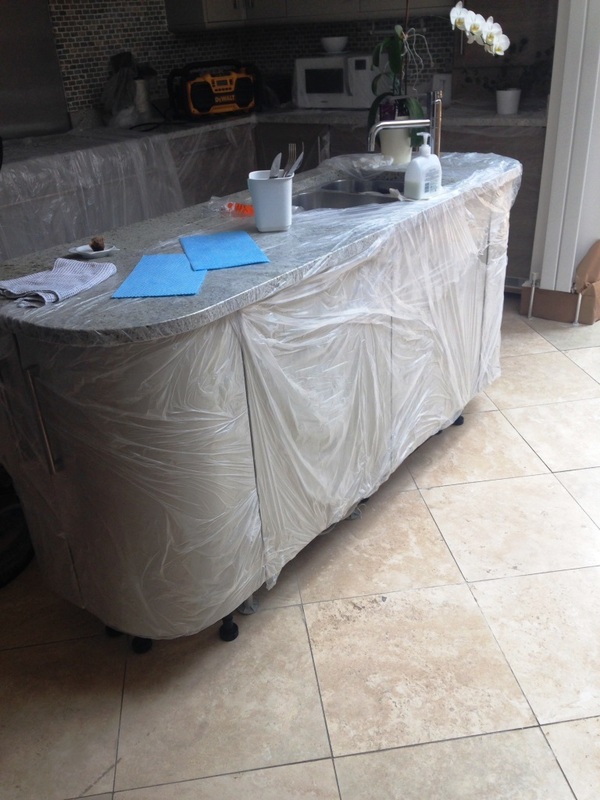 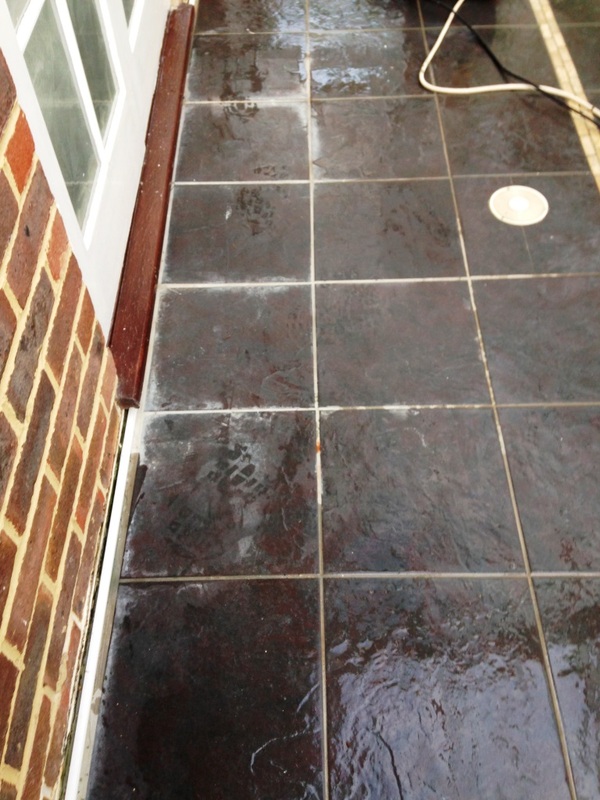 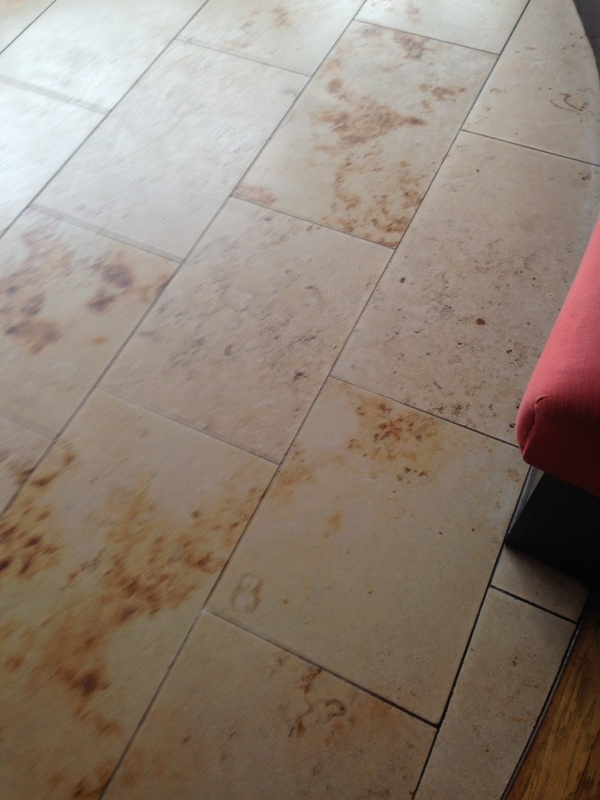 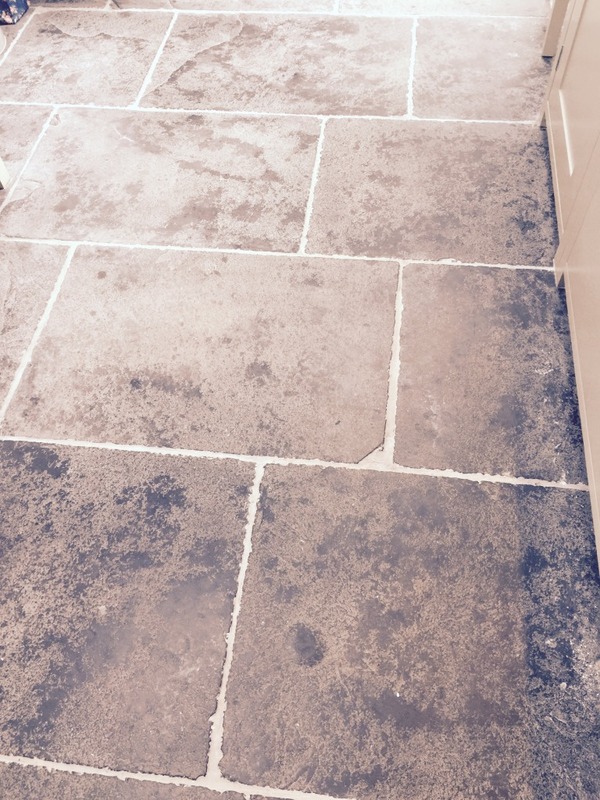 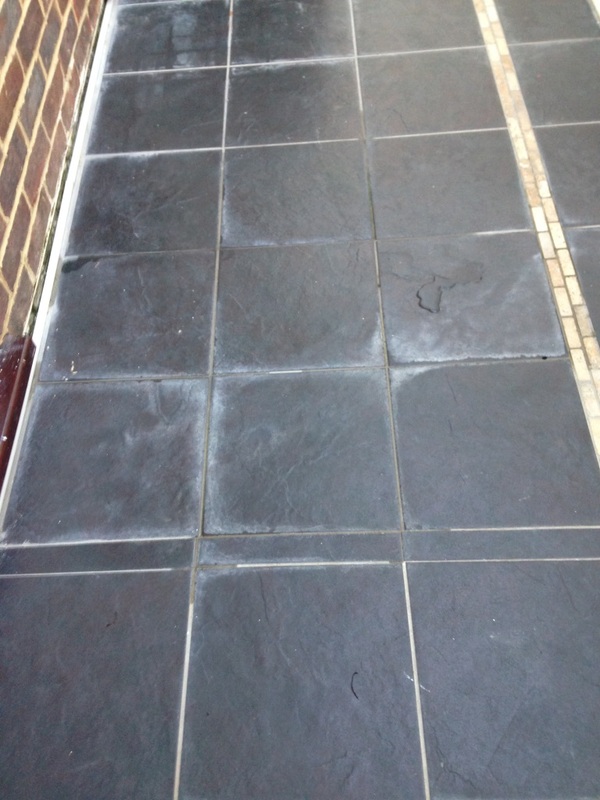 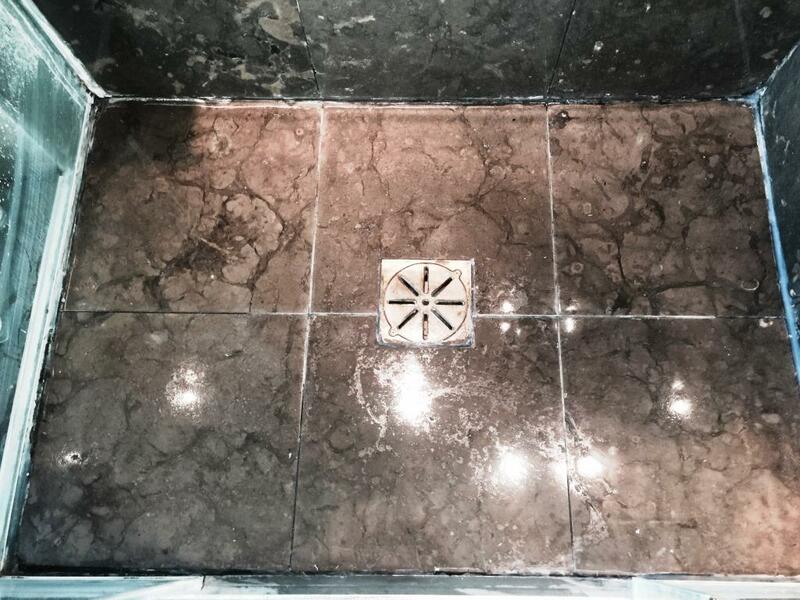 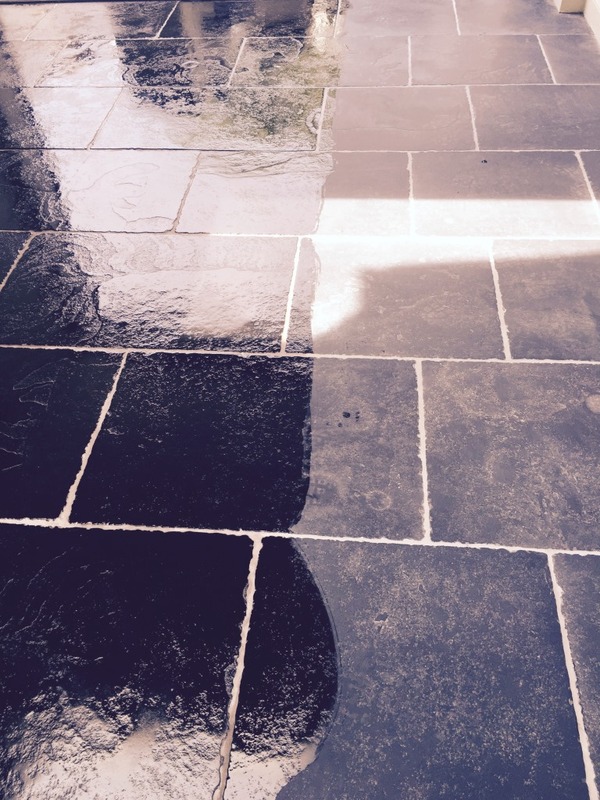 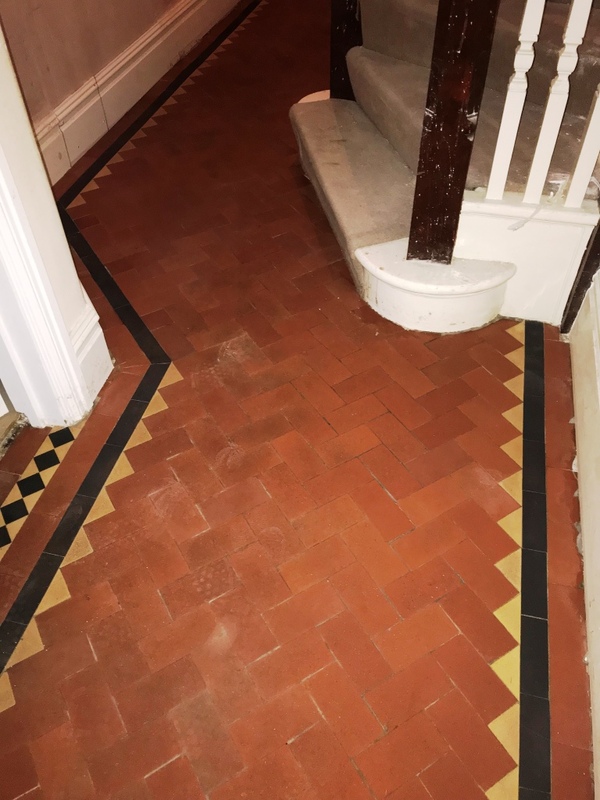 It was immediately clear that the thick layers of dirt and staining would need to be removed, before being treated to a new seal to provide long-lasting protection. 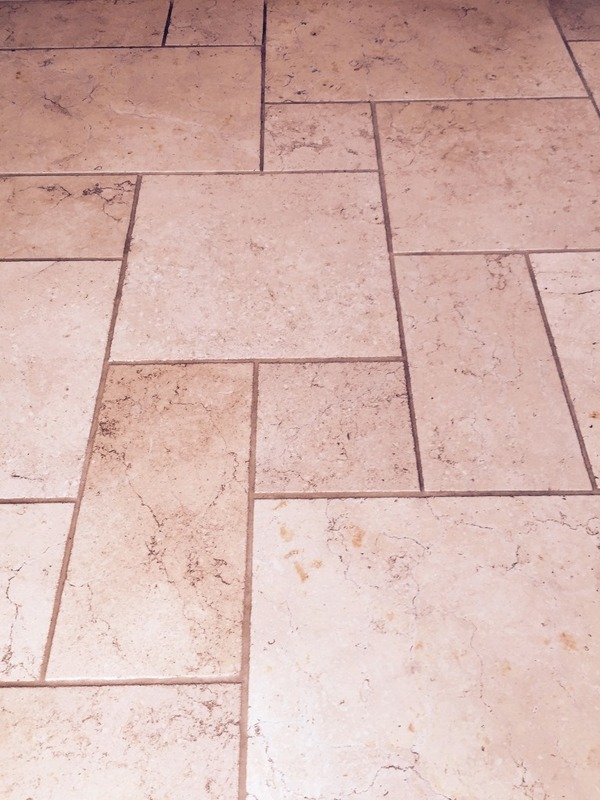 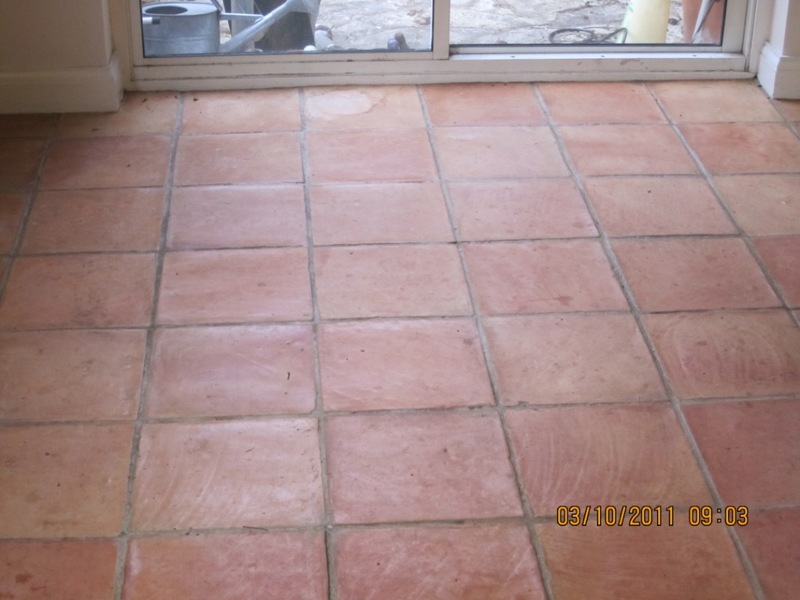 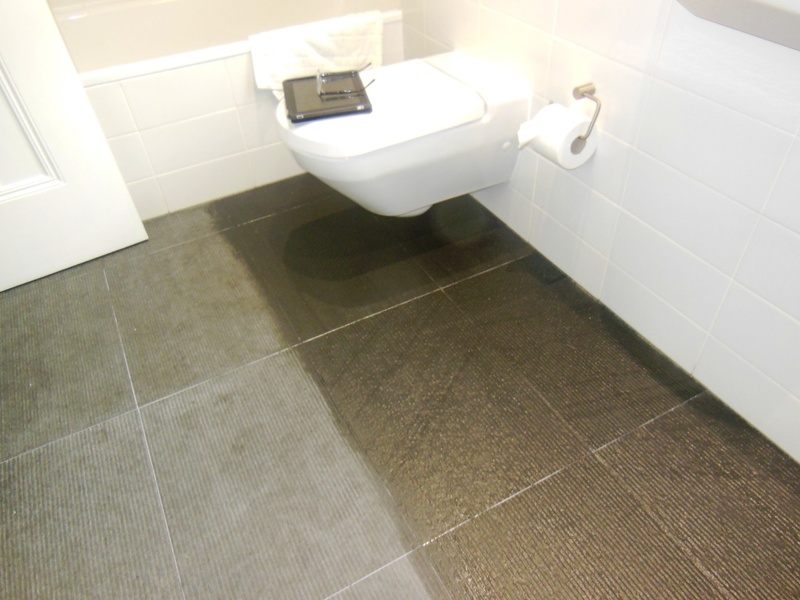 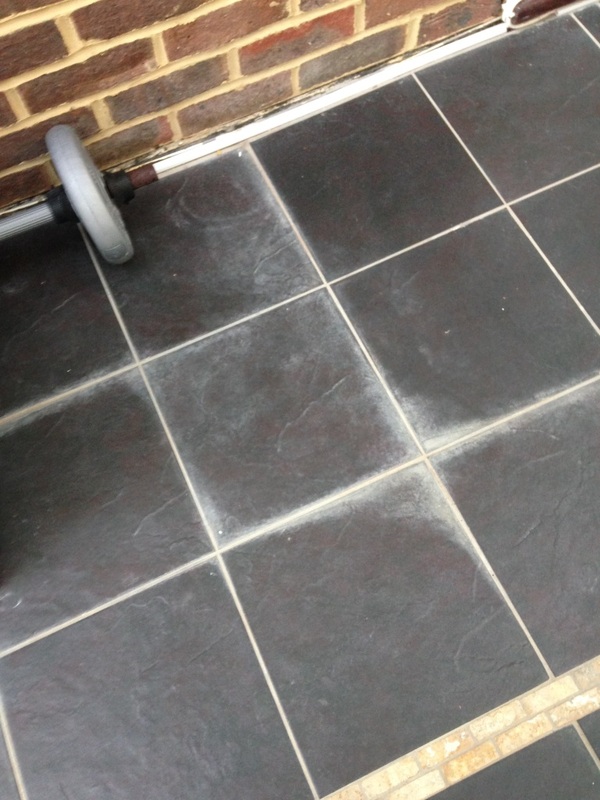 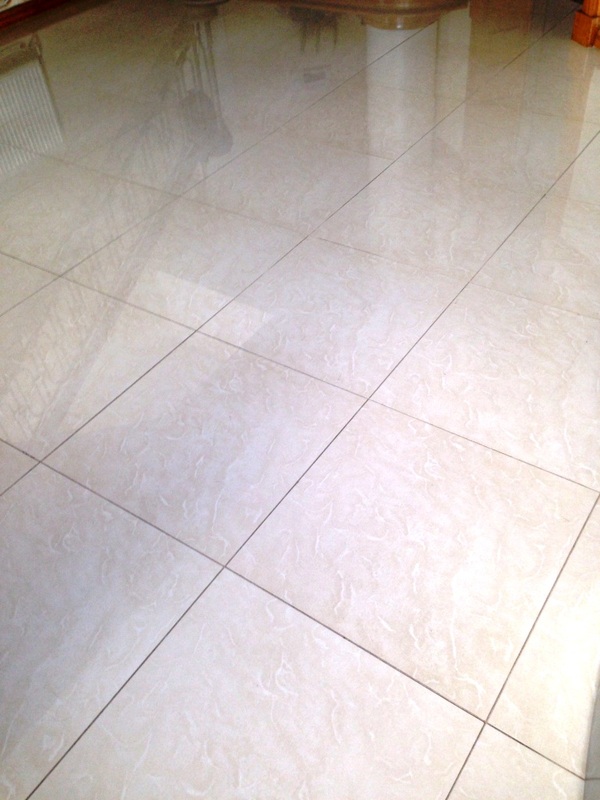 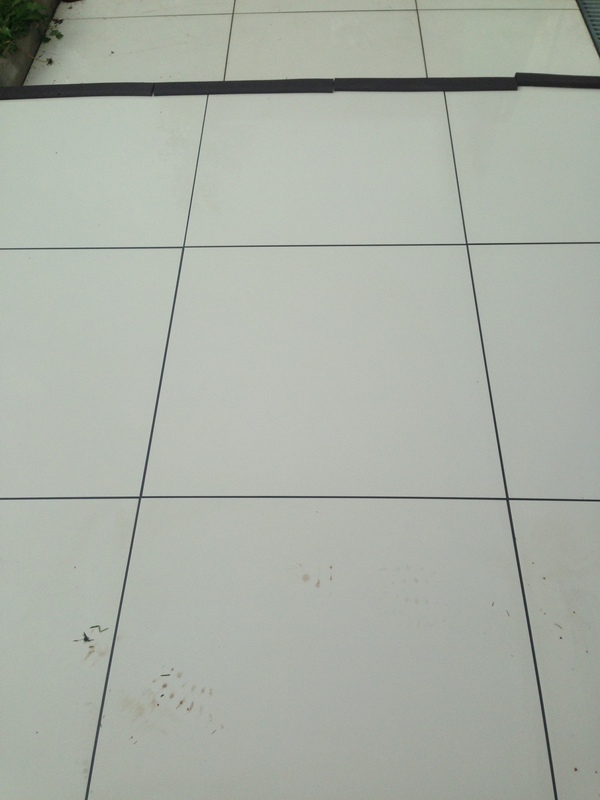 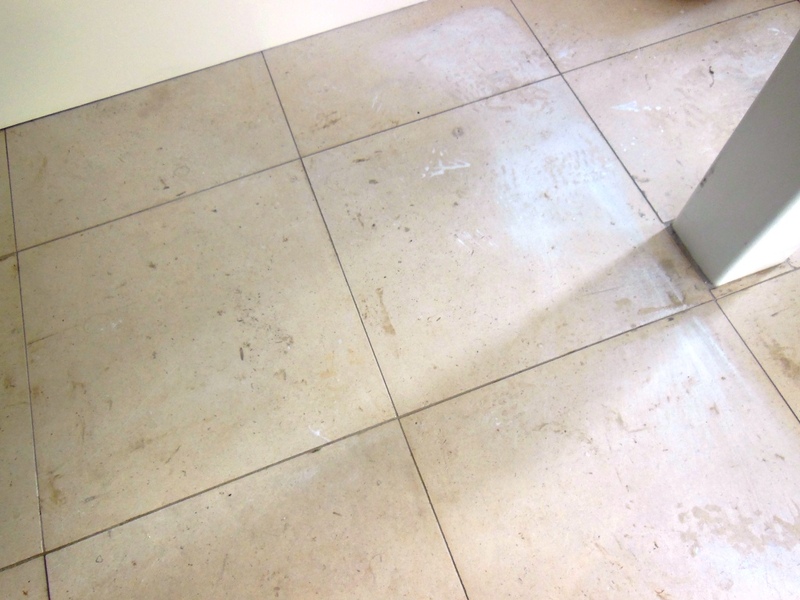 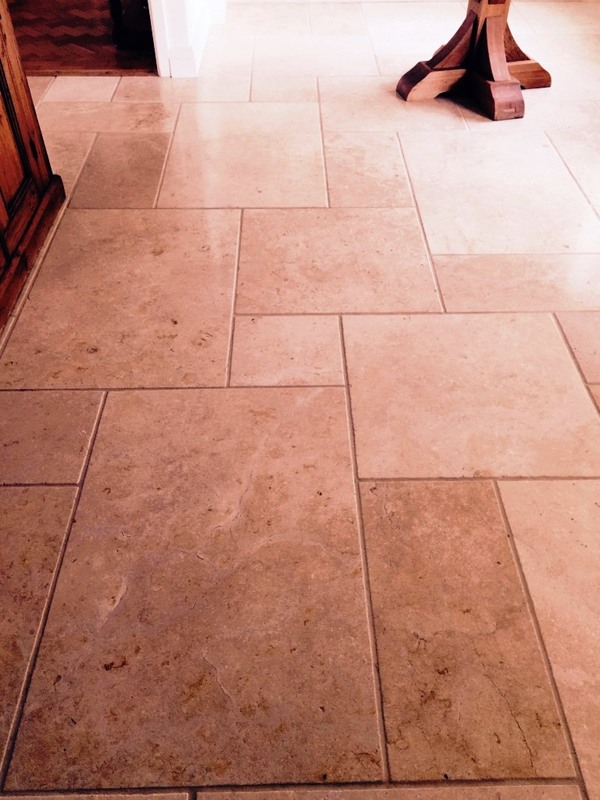 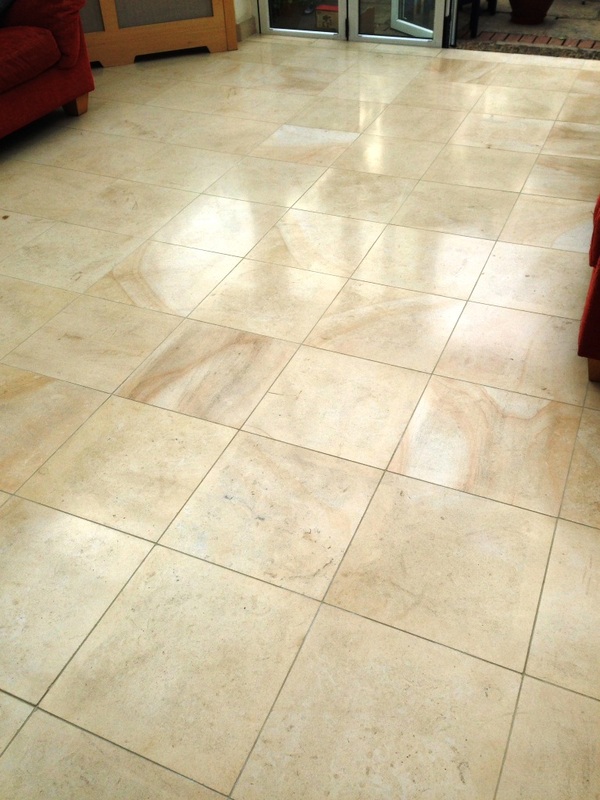 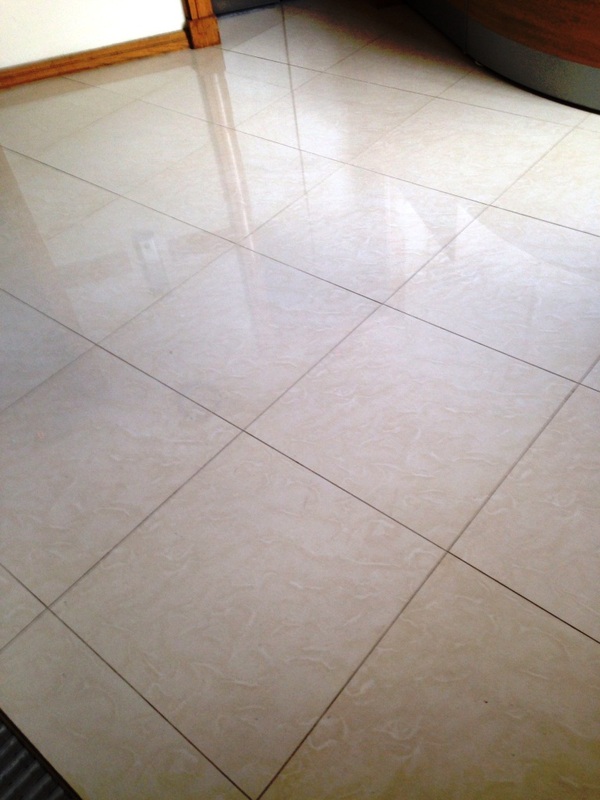 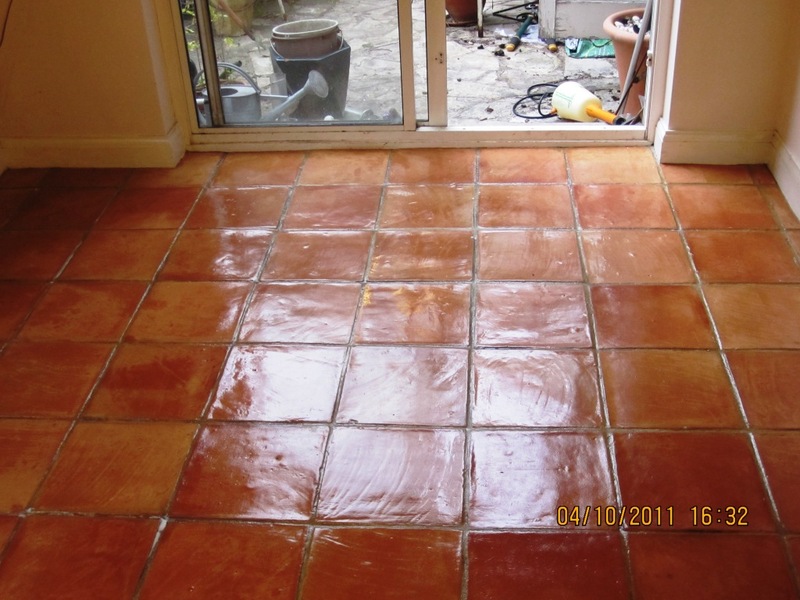 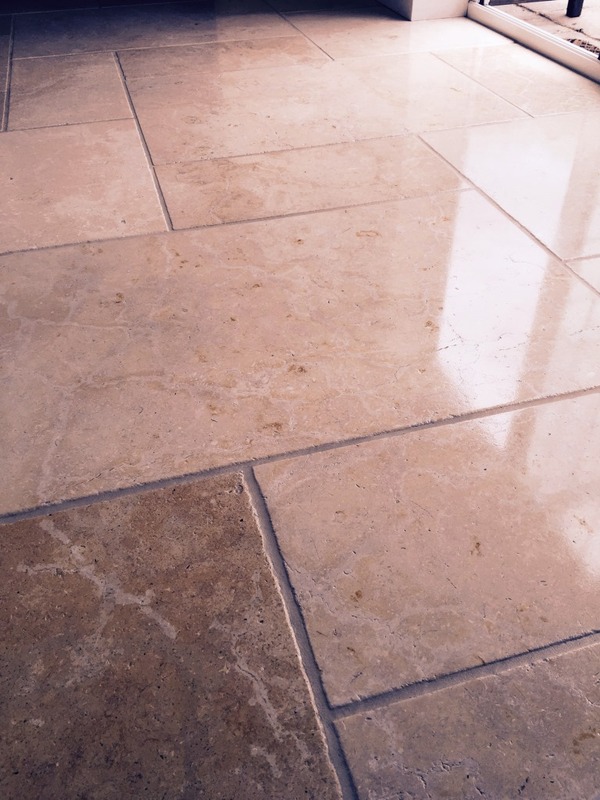 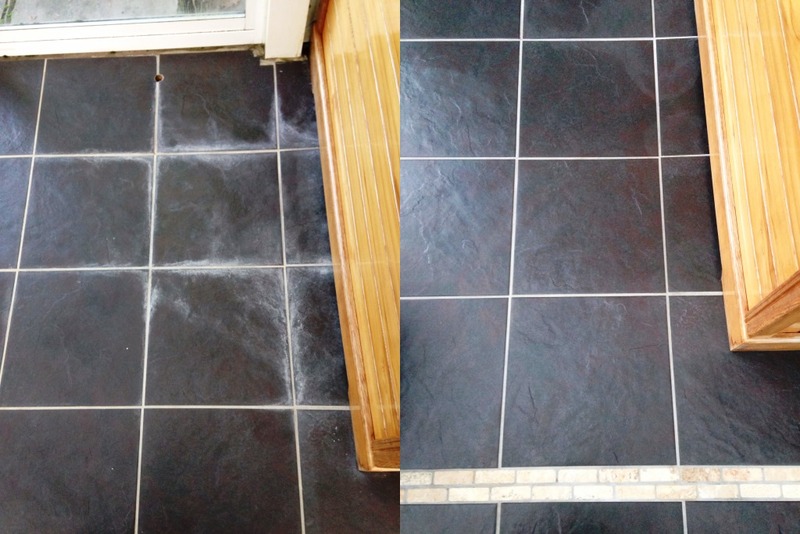 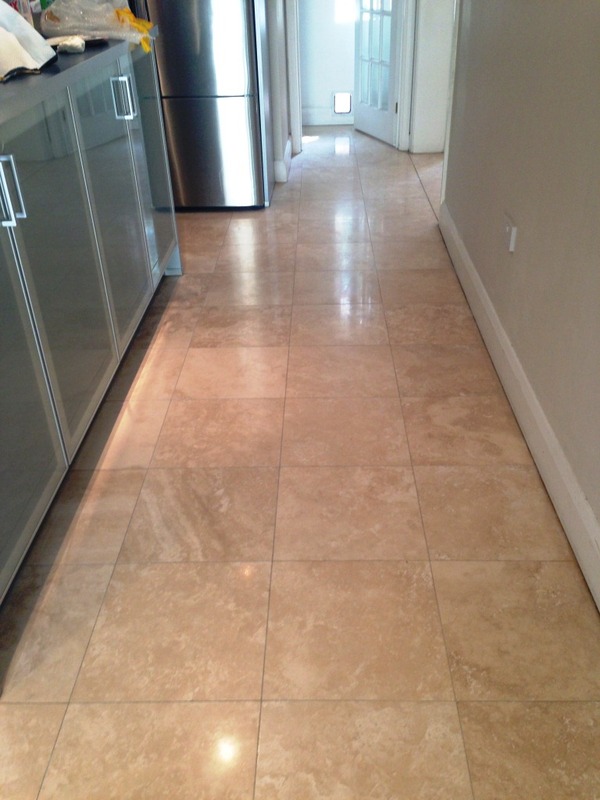 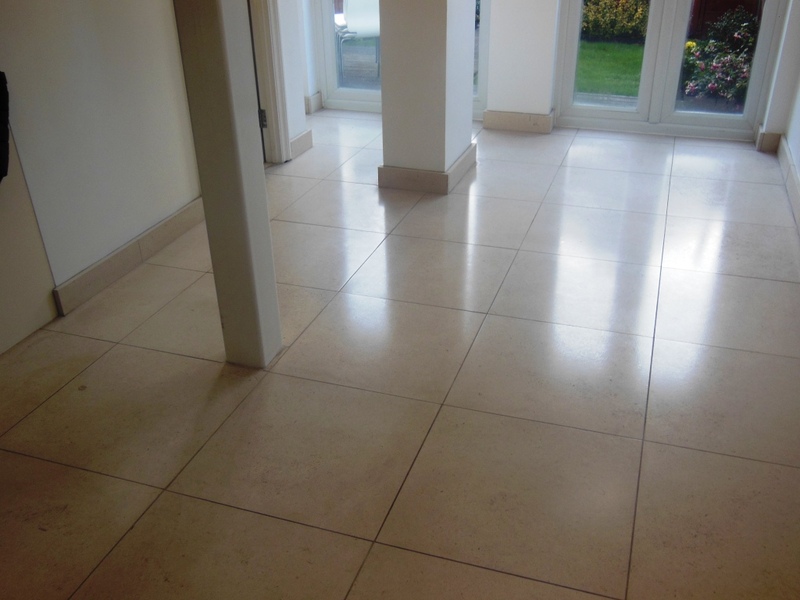 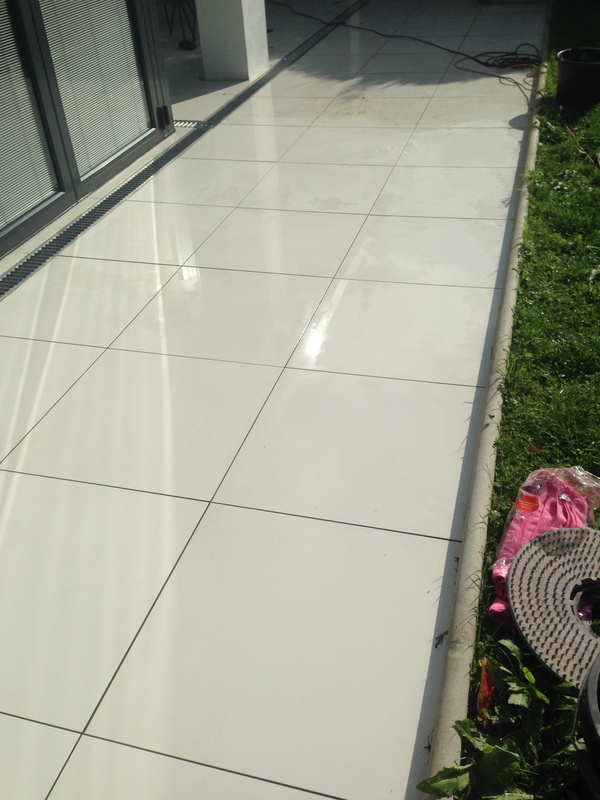 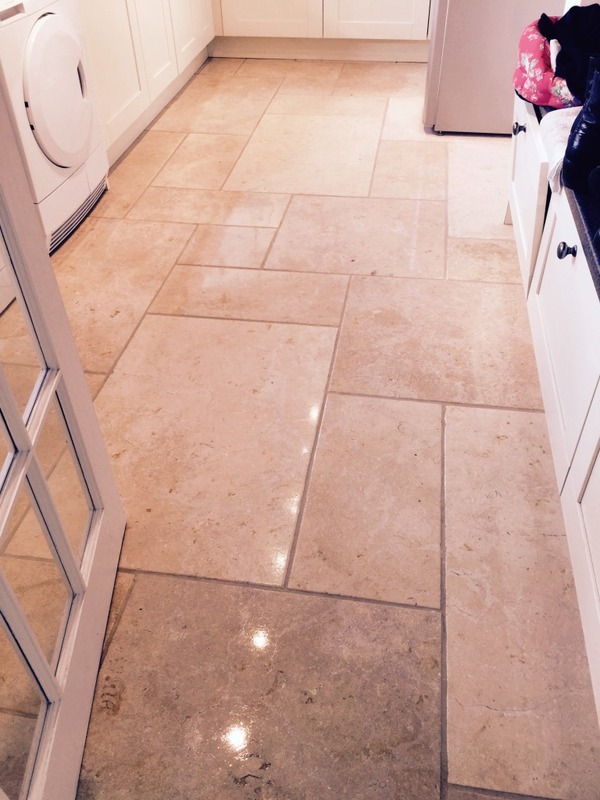 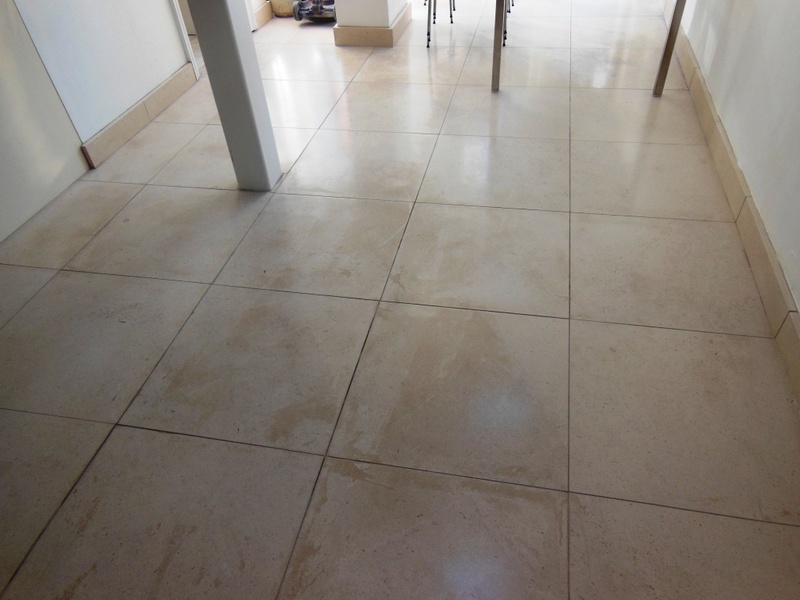 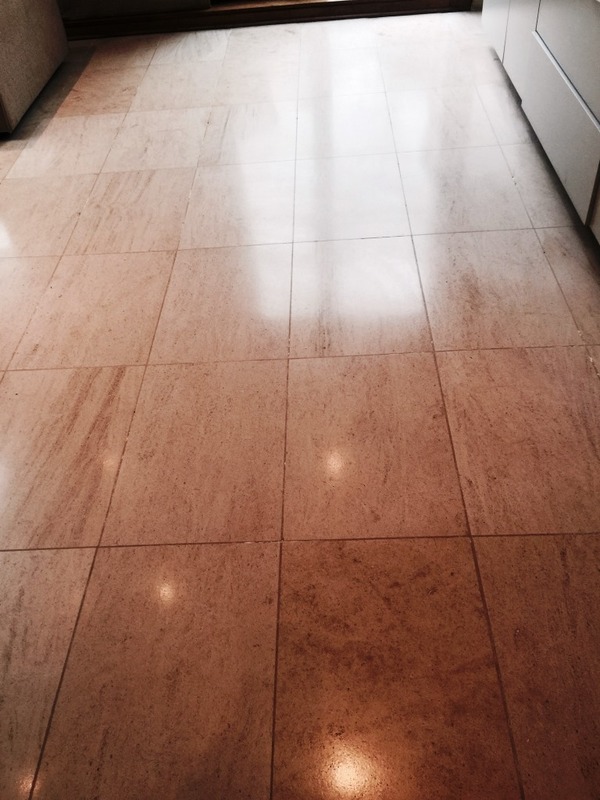 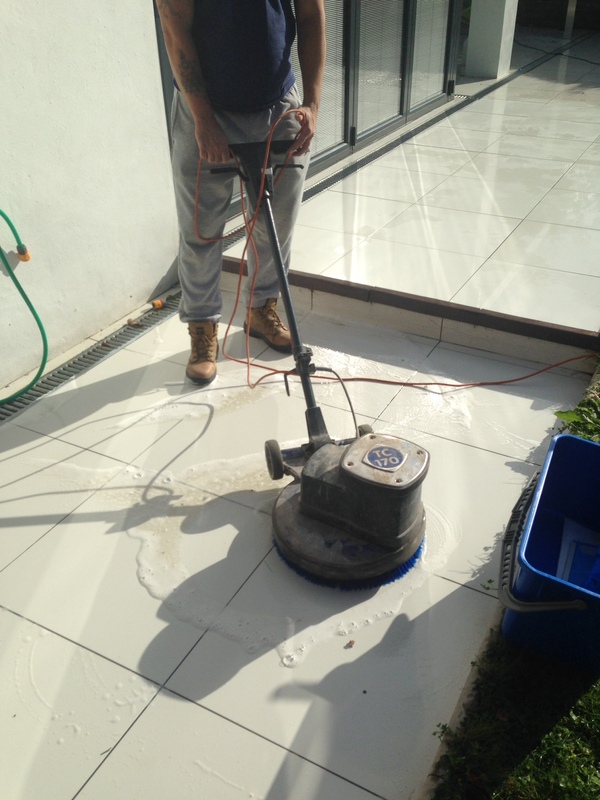 My product of choice for removing the extremely heavy soil buildup on the tiles was Tile Doctor NanoTech HBU (formerly UltraClean), a powerful solvent-based cream cleaner. 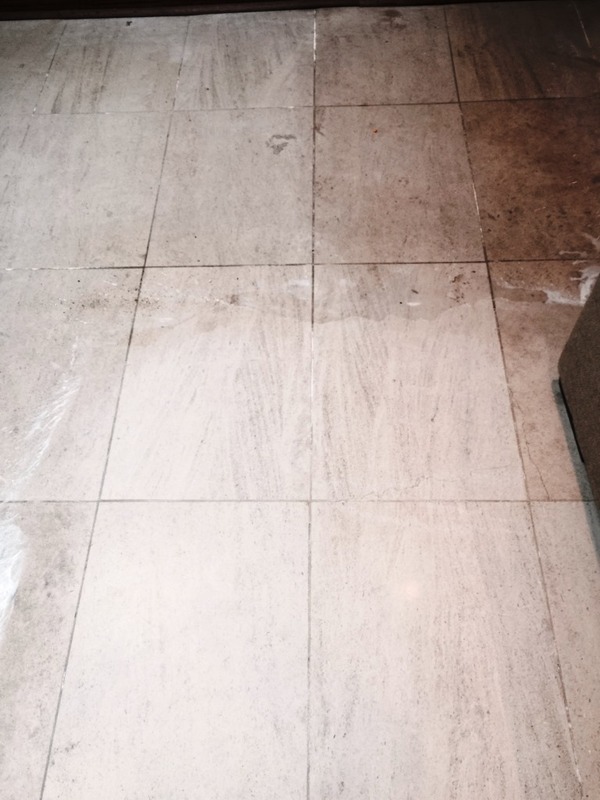 What makes this product different from standard cleaners is its use of nano-sized cleaning particles to penetrate below tough stains, dissolve them, and lift them to the surface. 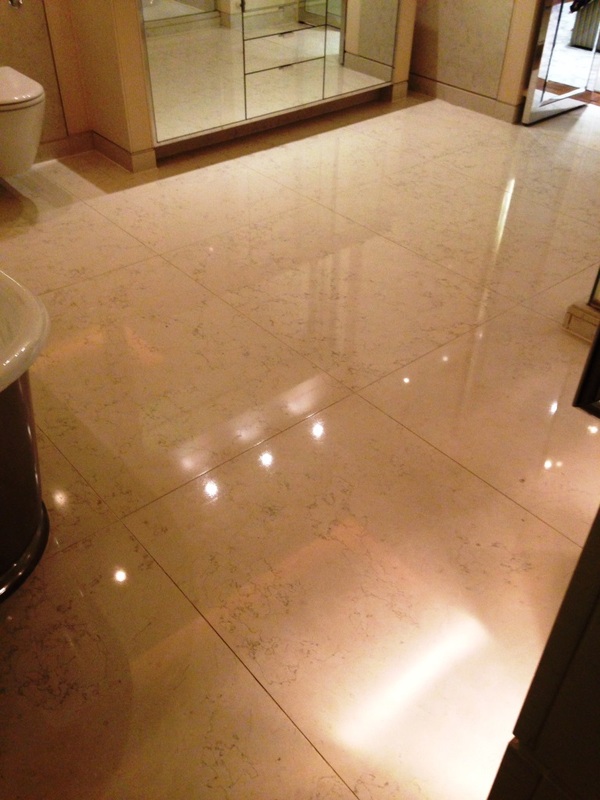 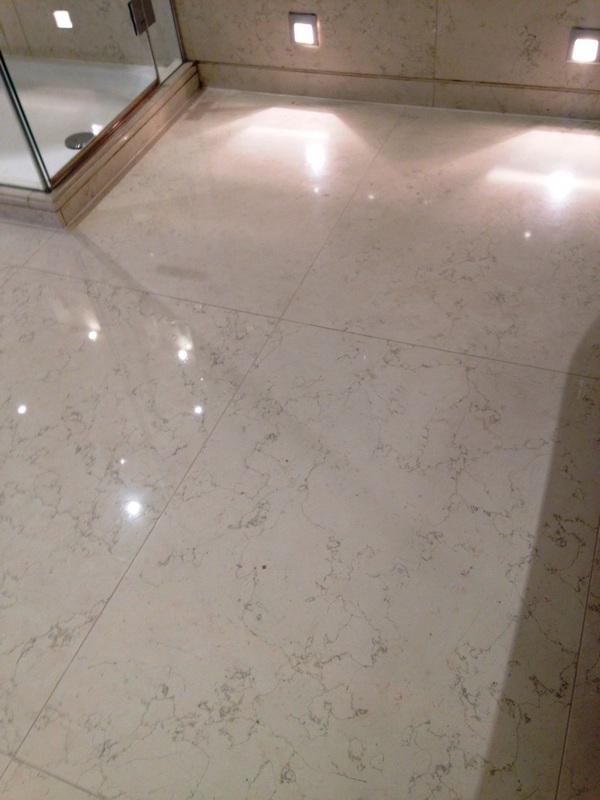 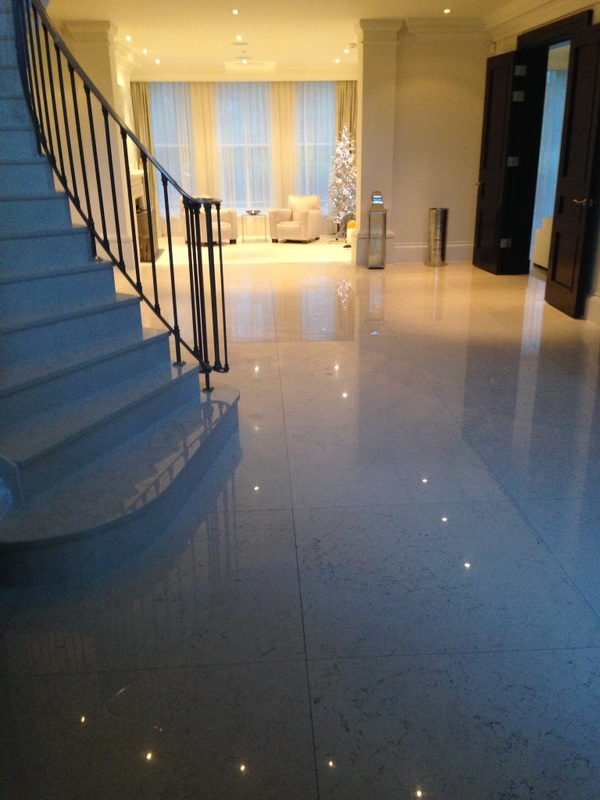 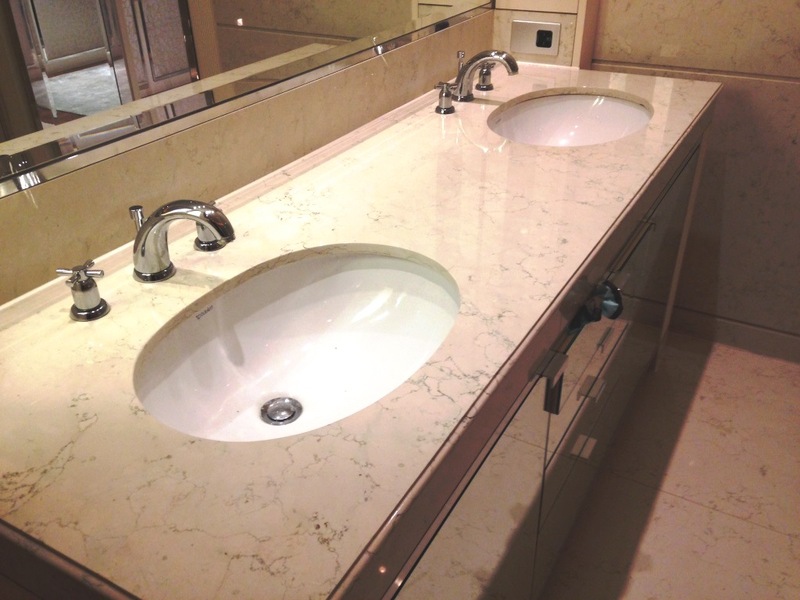 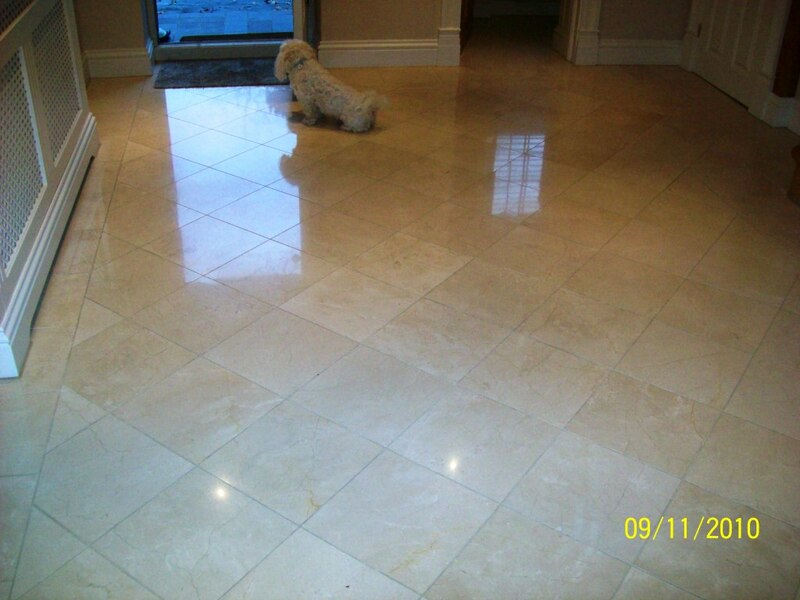 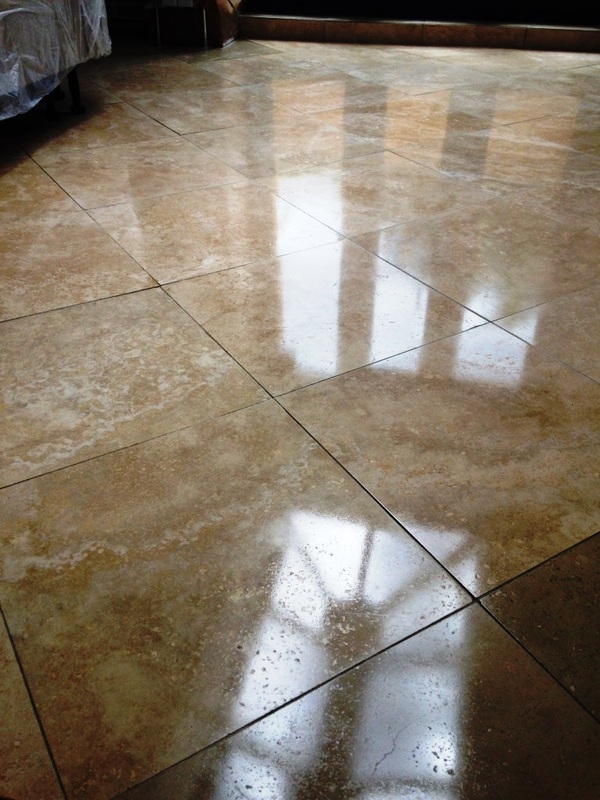 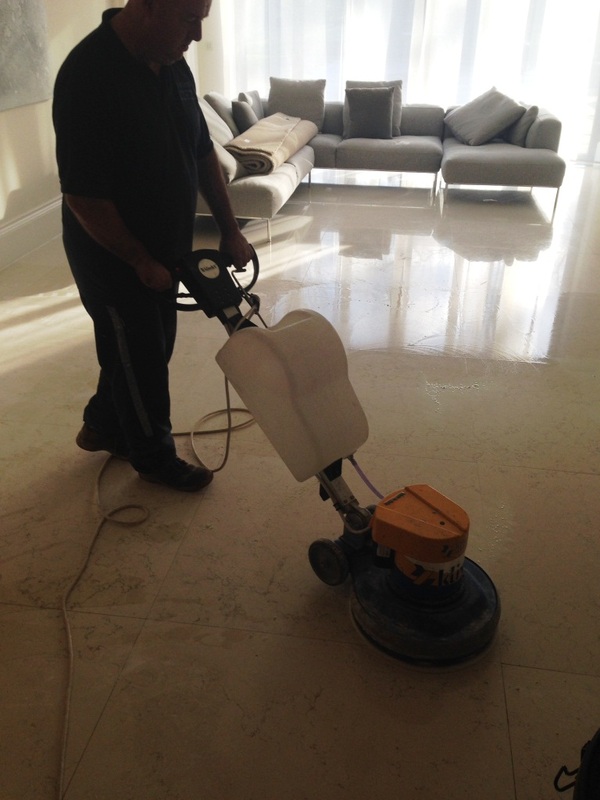 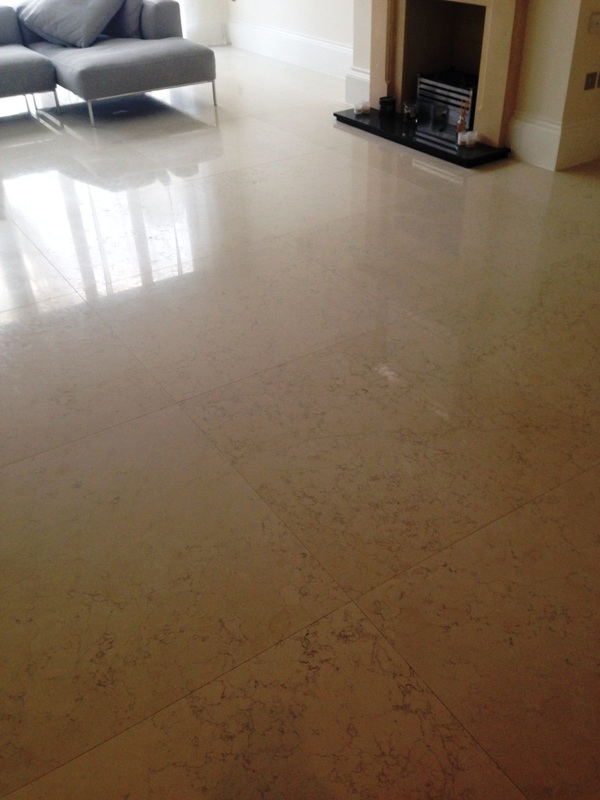 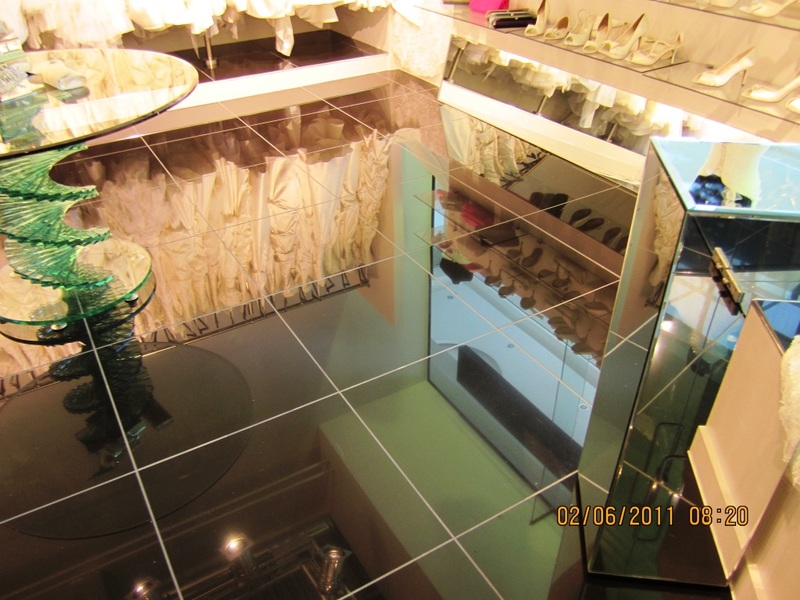 NanoTech HBU is a highly versatile product which can be used on most types of natural stone floor, both polished and unpolished. 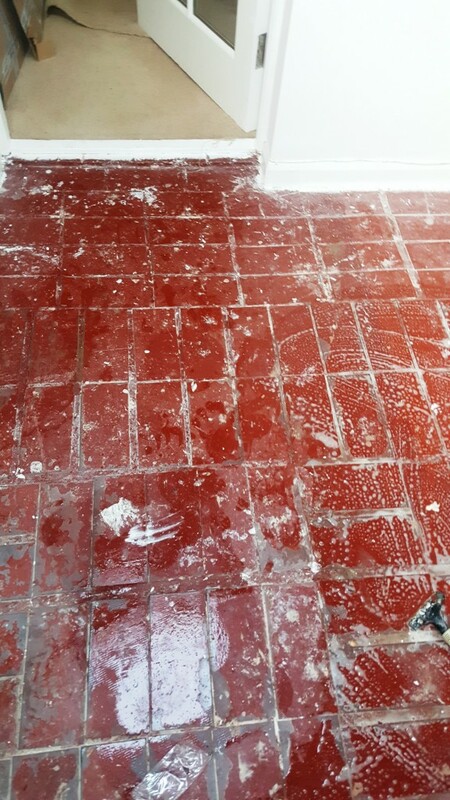 I laid down the NanoTech HBU and left it to dwell for a short period on the tiles, allowing it to begin eating through the dirt, before using a scraper in combination with a steamer to manually lift the muck away from the tiles. 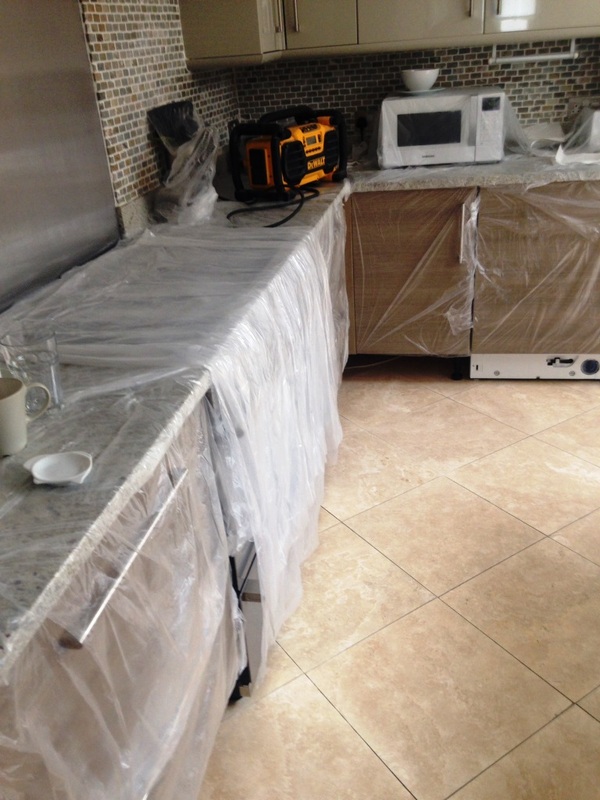 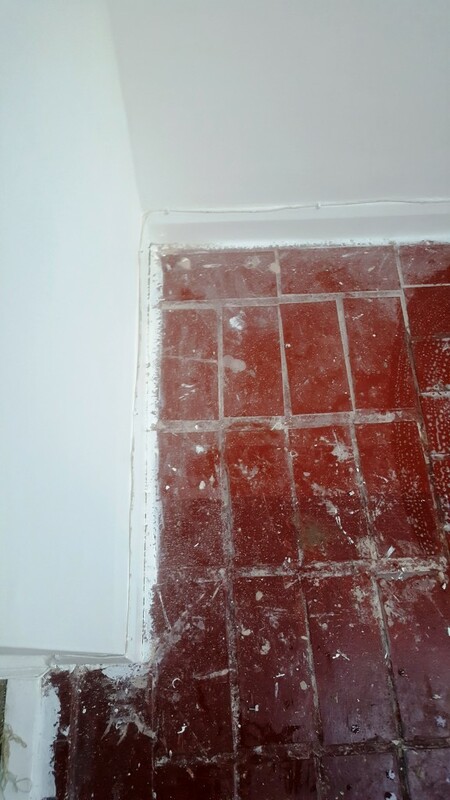 Next, to tackle the glue and paint marks, I applied Tile Doctor Remove and Go, a stripper specifically designed to break down adhesive and solvent stains, and then used a scraper and a scouring pad to manually remove the glue and paint in the affected areas. 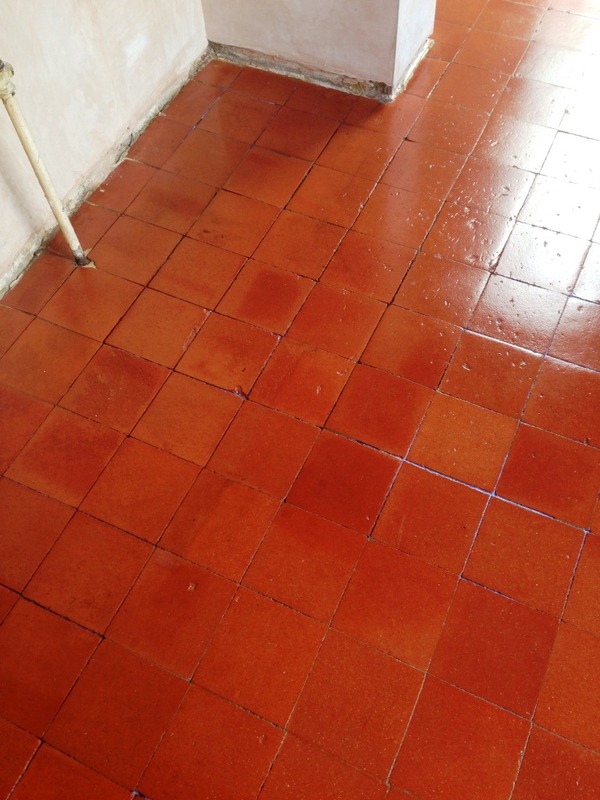 Once this was done, I scrubbed in some more NanoTech HBU to dissolve any remaining muck before rinsing the area thoroughly with clean water. 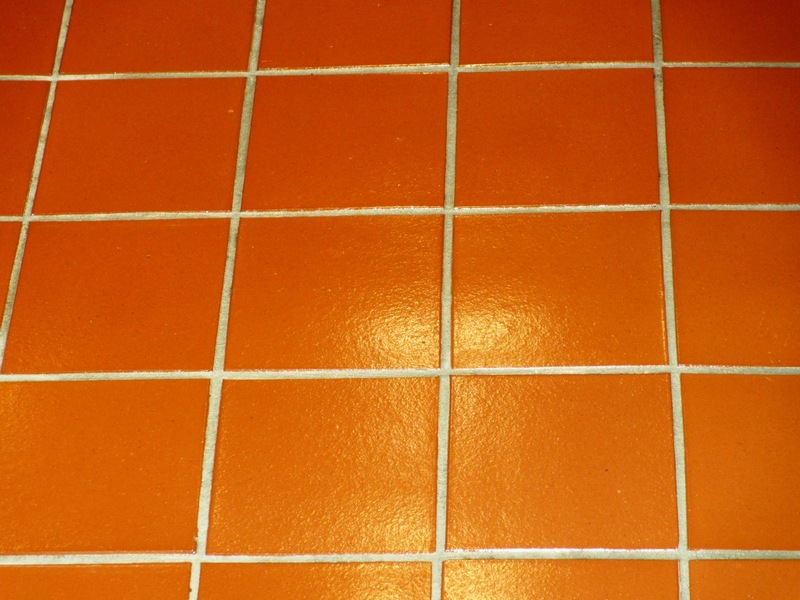 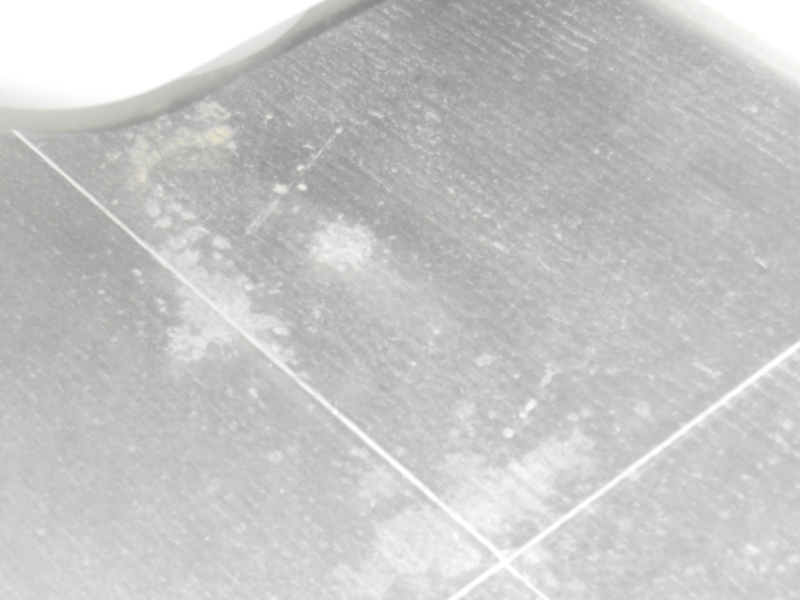 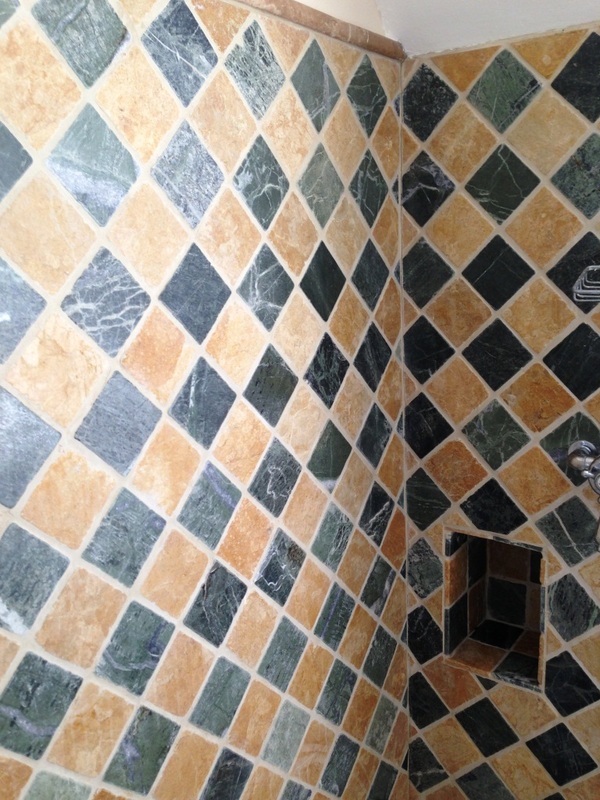 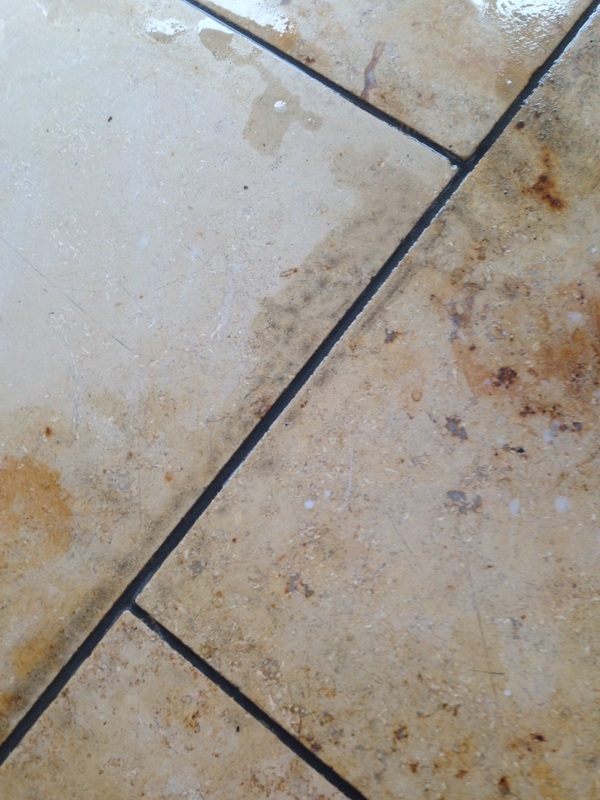 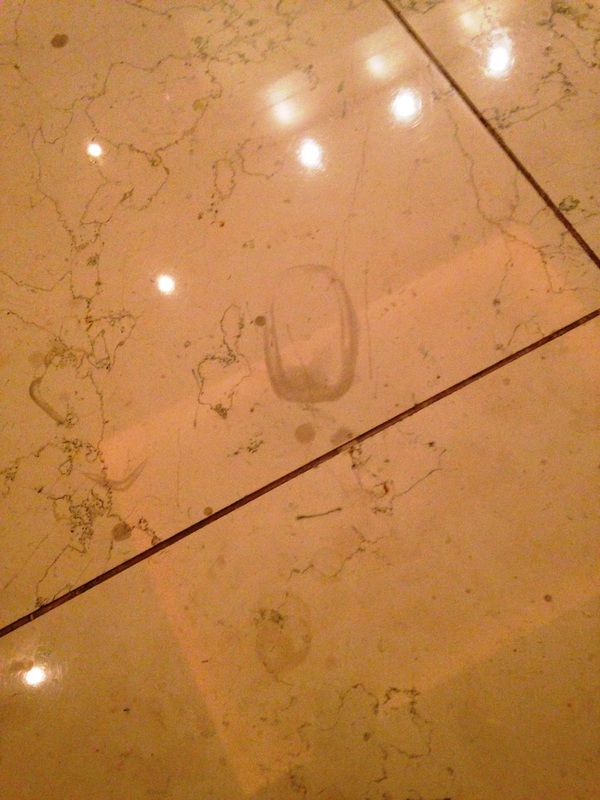 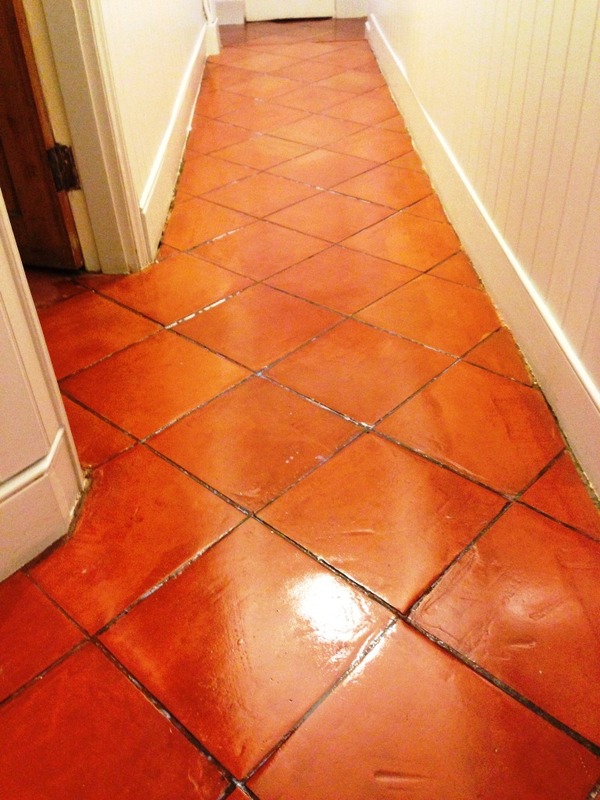 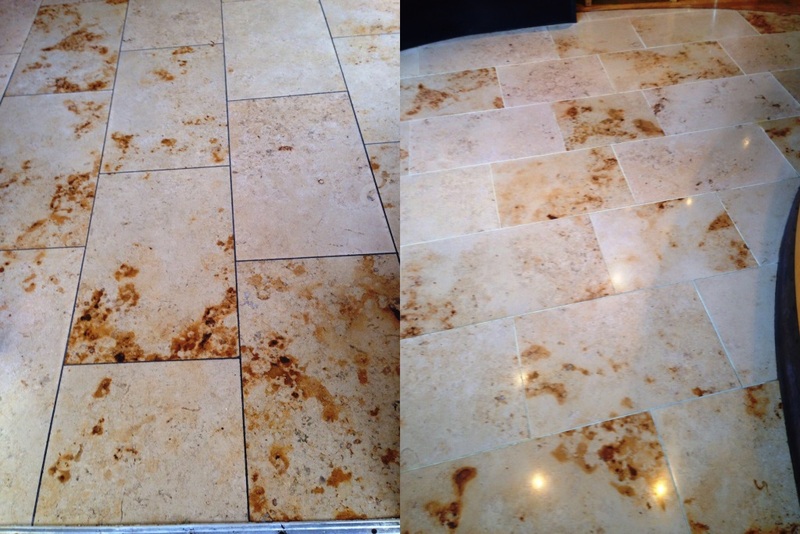 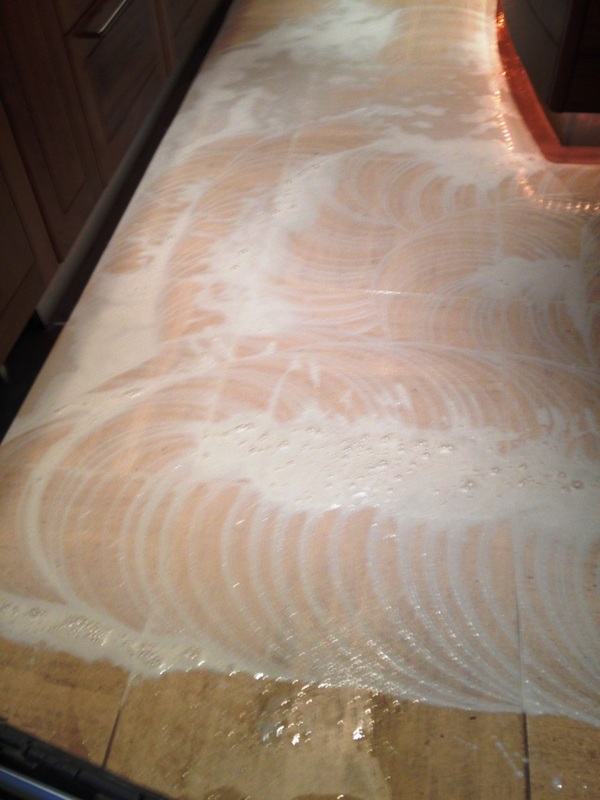 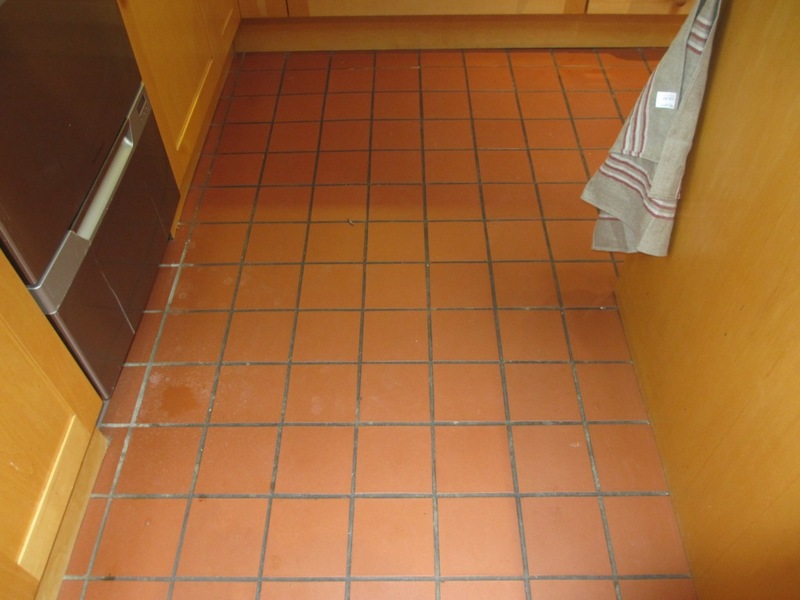 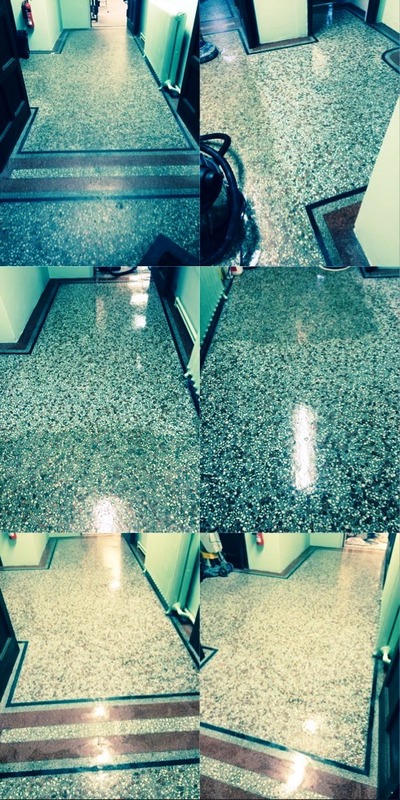 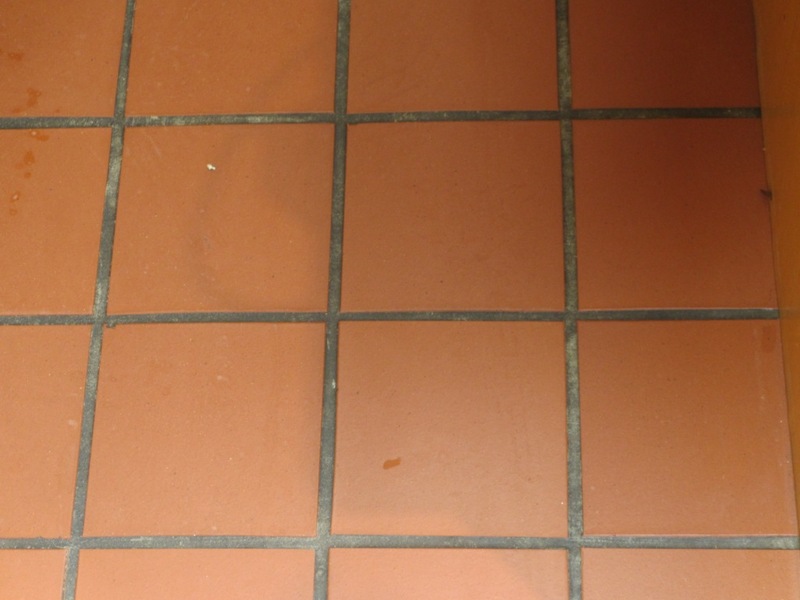 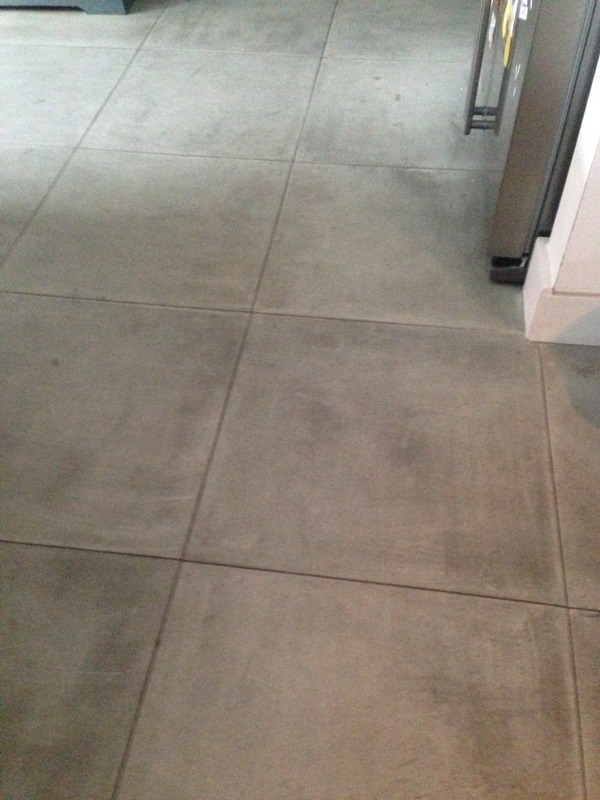 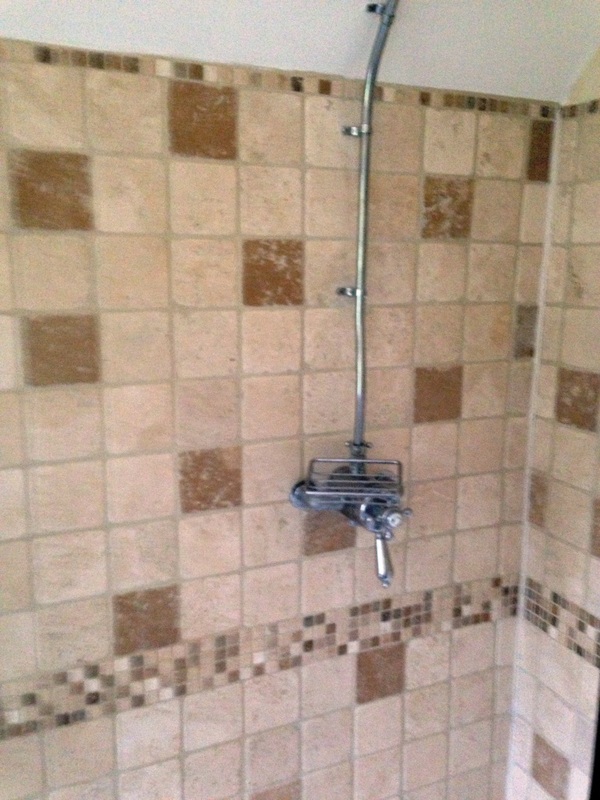 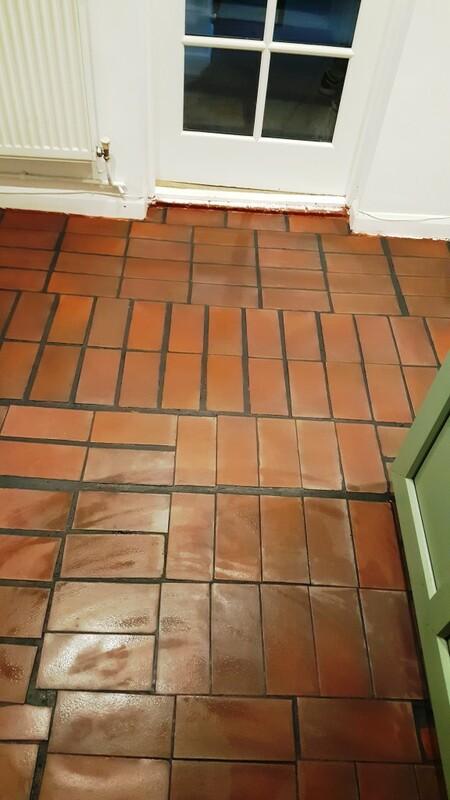 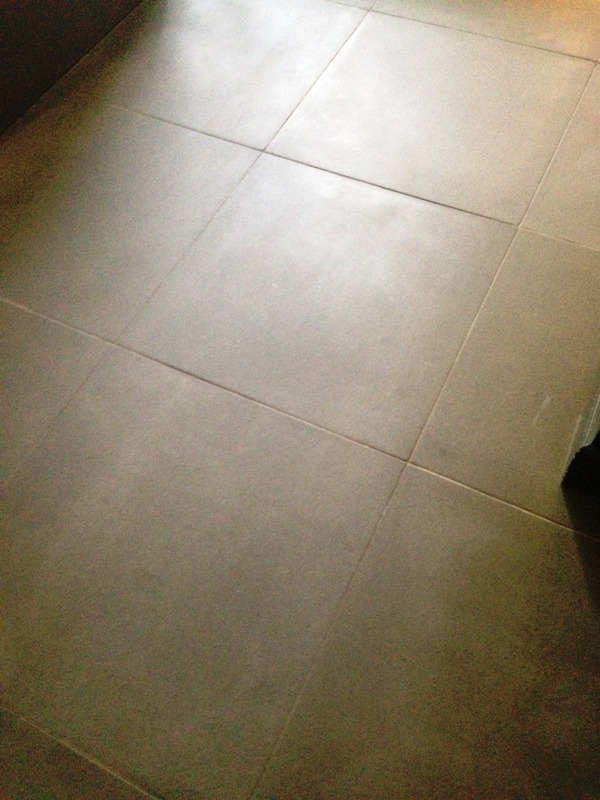 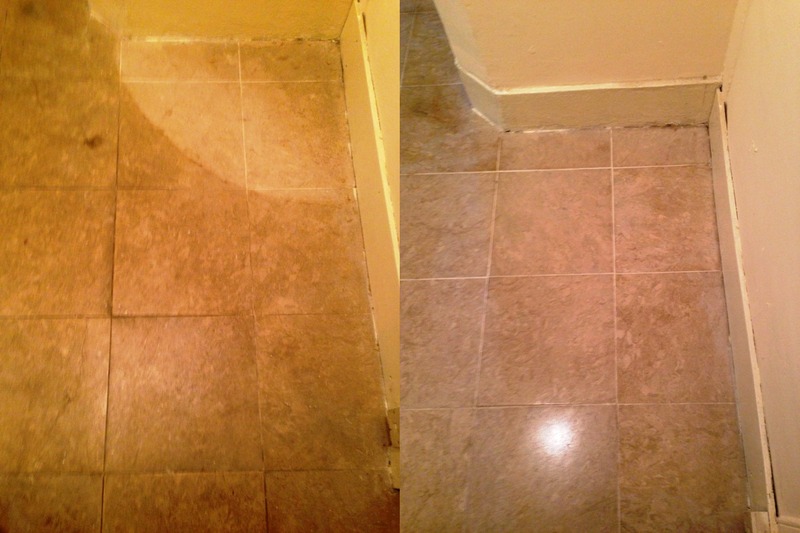 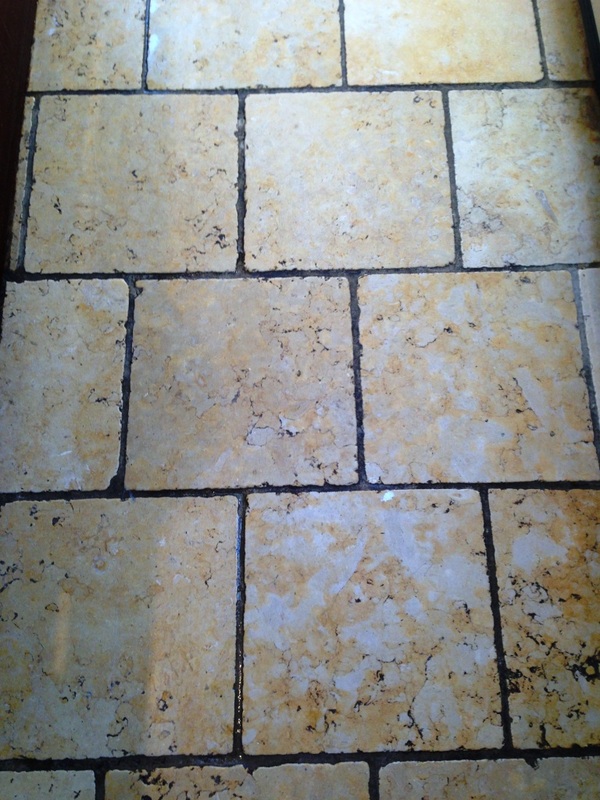 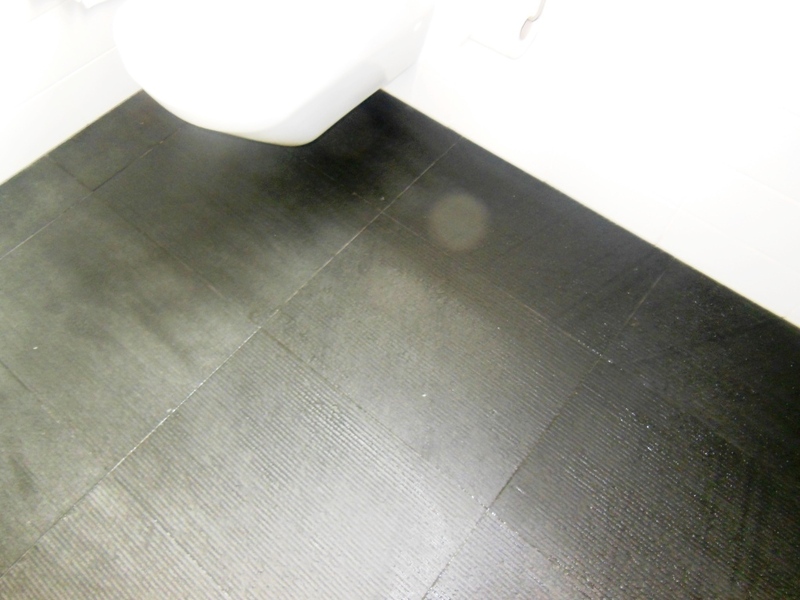 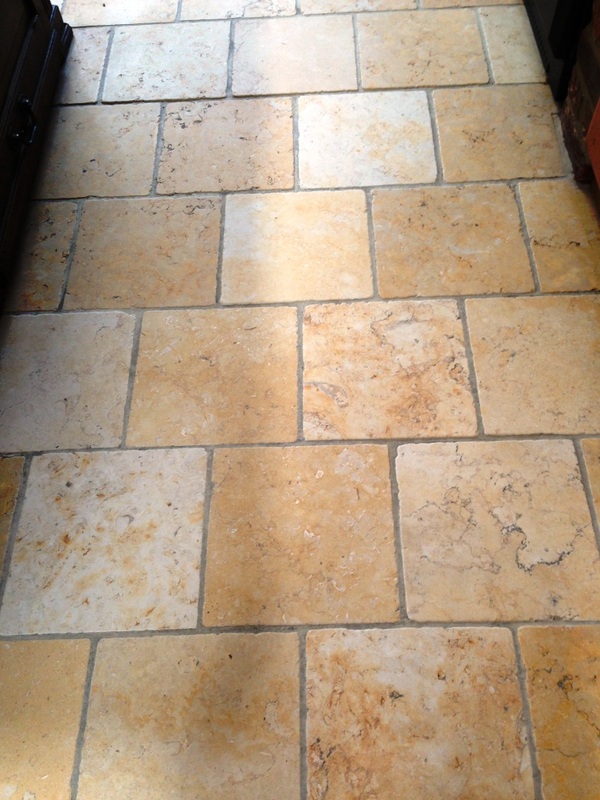 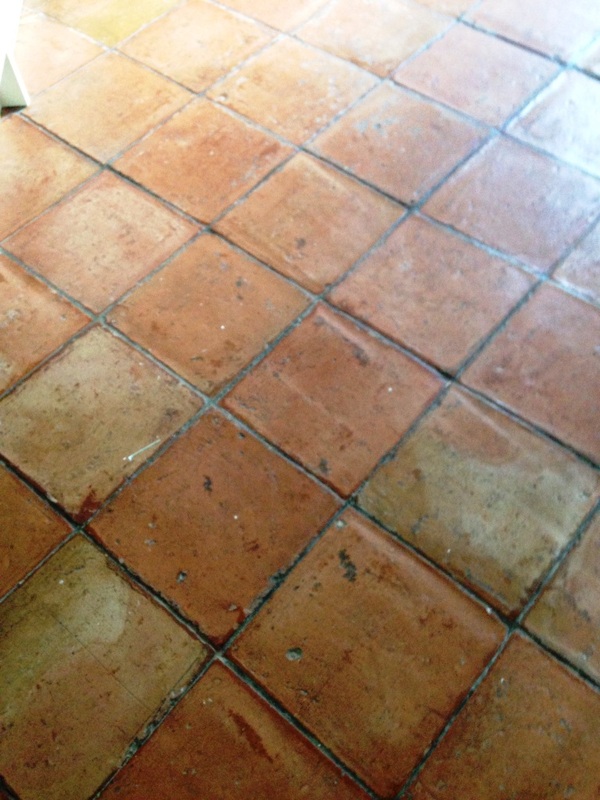 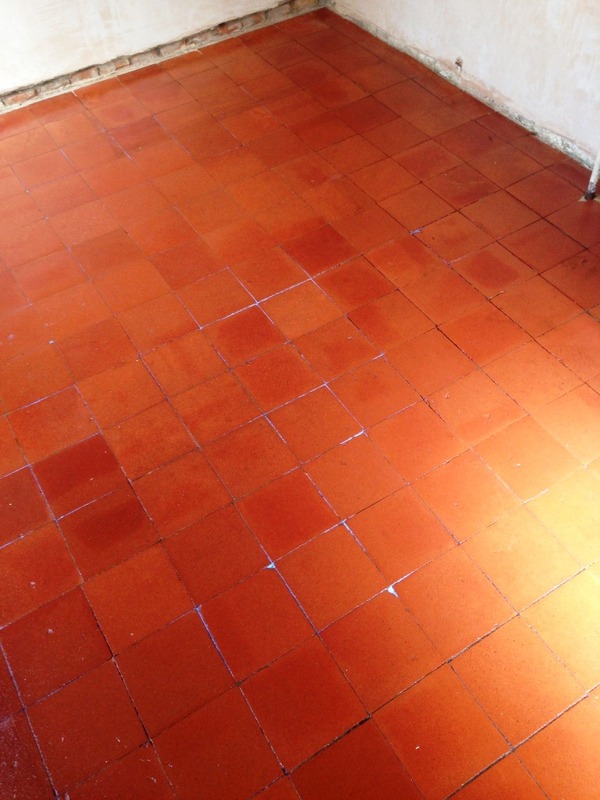 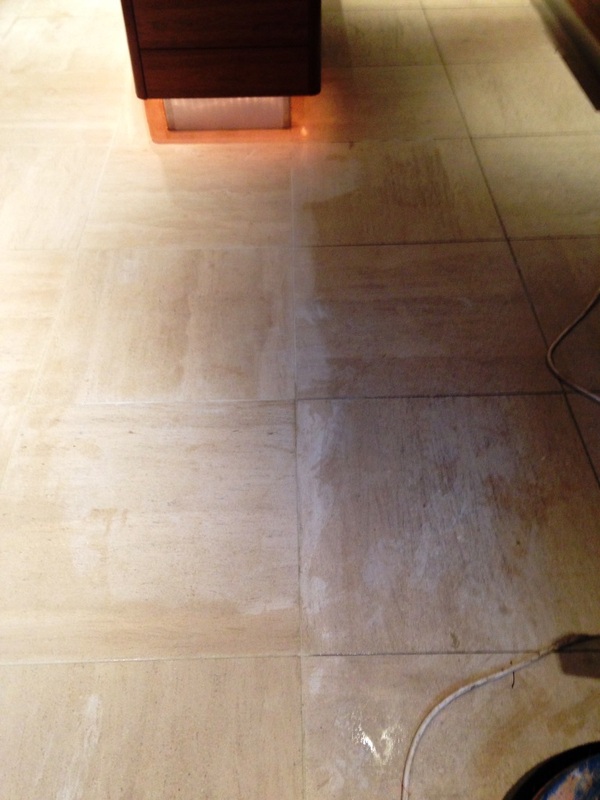 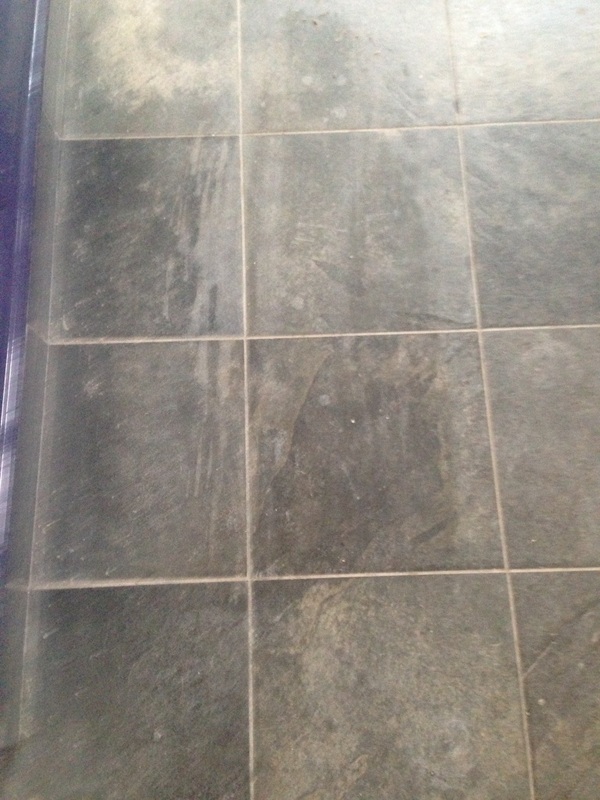 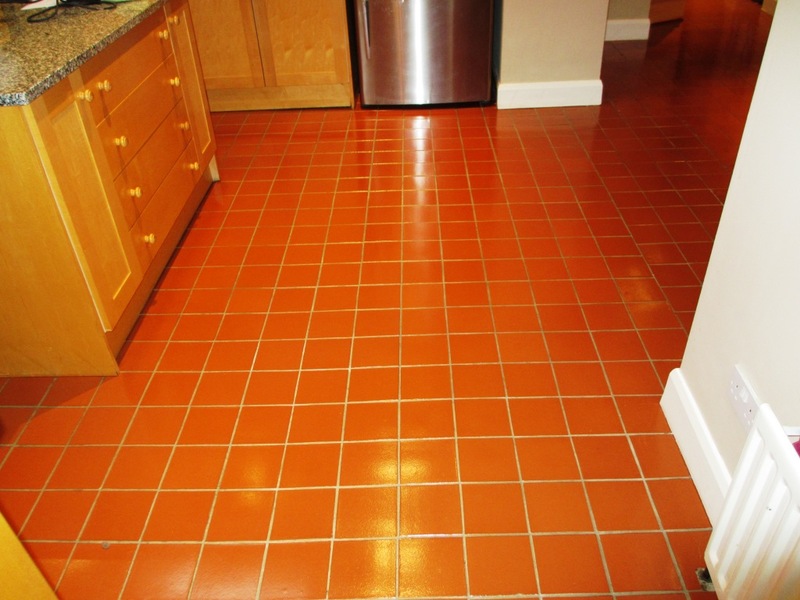 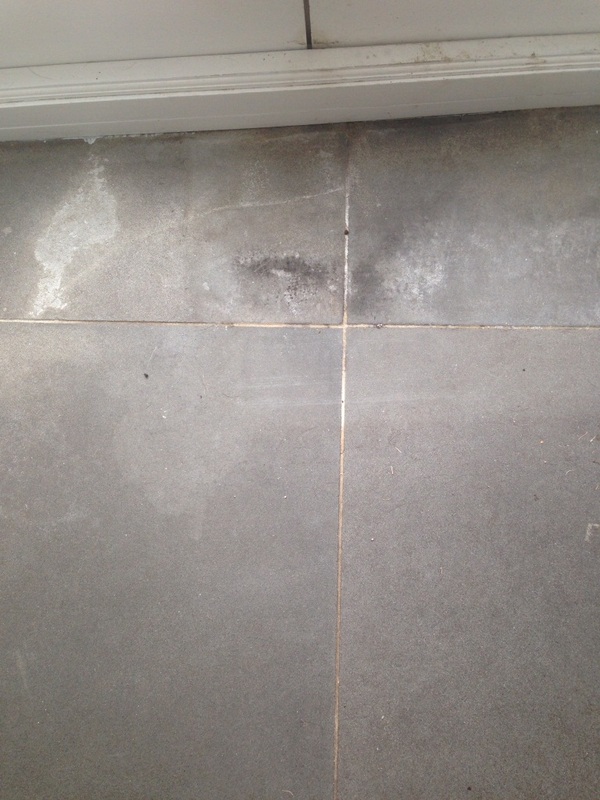 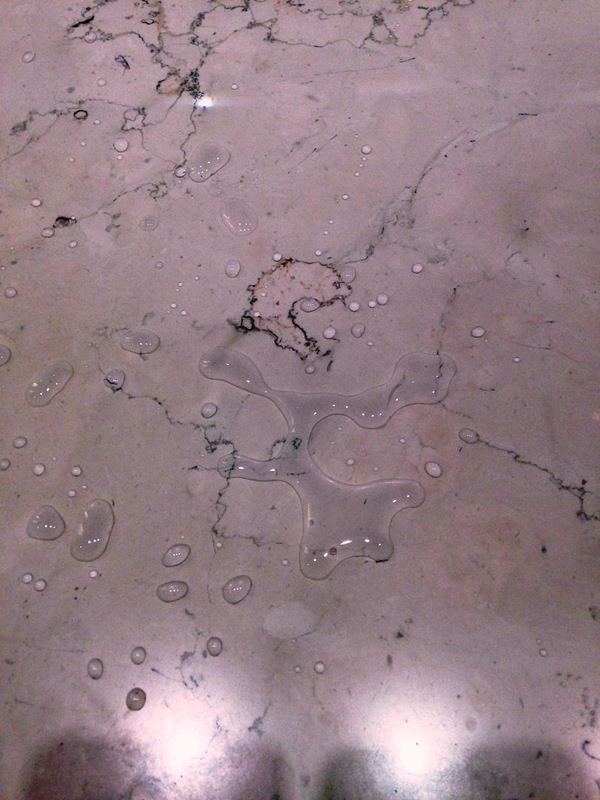 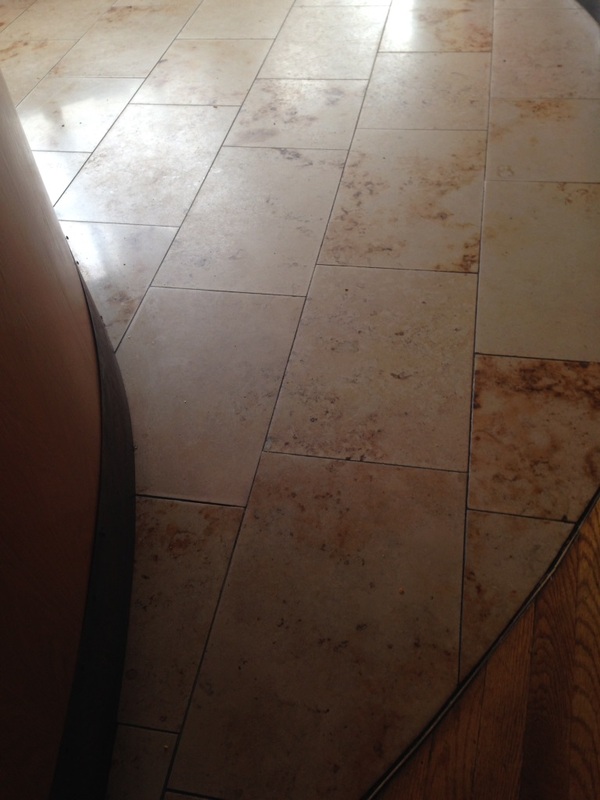 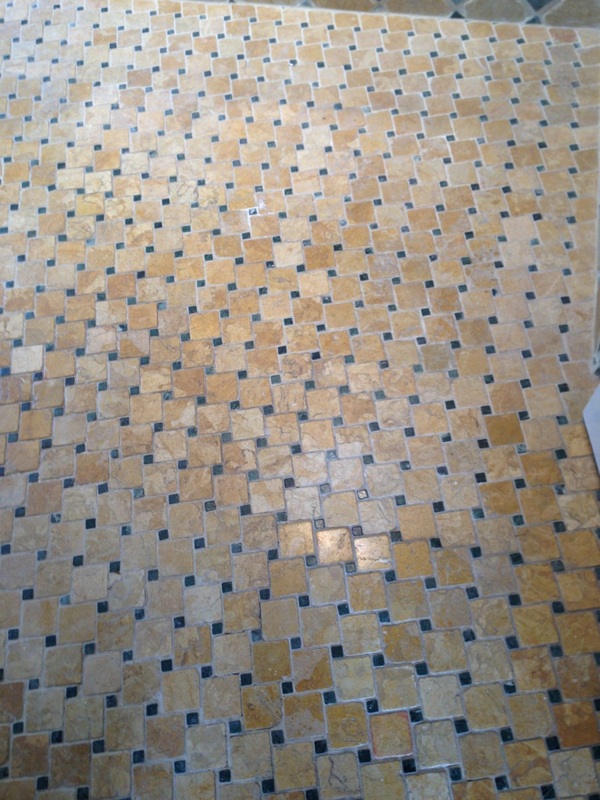 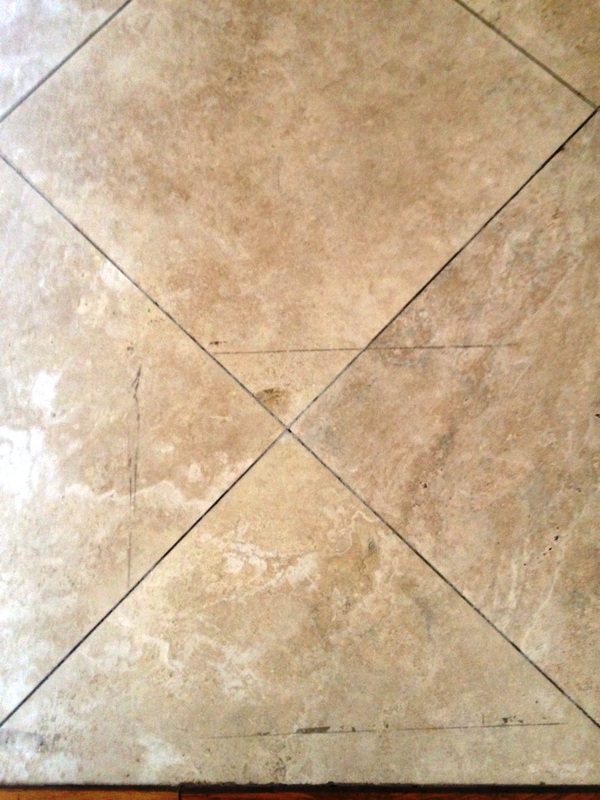 To complete the cleaning process, I laid some down some Tile Doctor Acid Gel, which is a blend of Phosphoric and Hydrochloric acids in gel form, to eliminate inherent grout haze and alkaline mineral deposits in the affected areas. 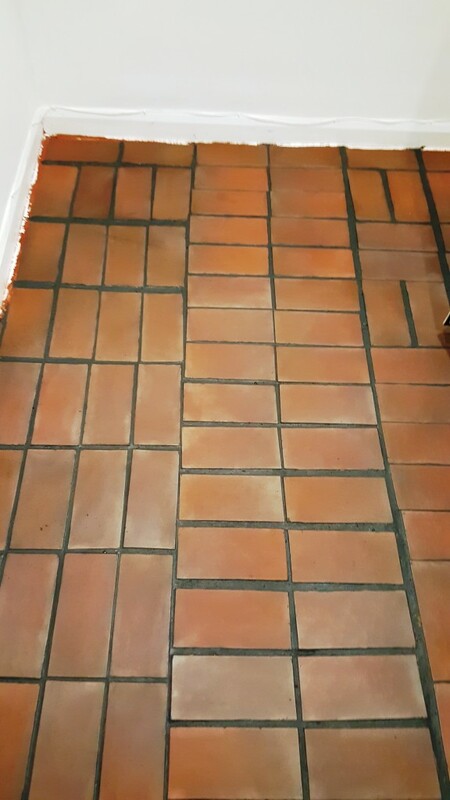 I then left this to dwell for ten minutes before giving the floor a final rinse to remove any chemicals and soiled residue. 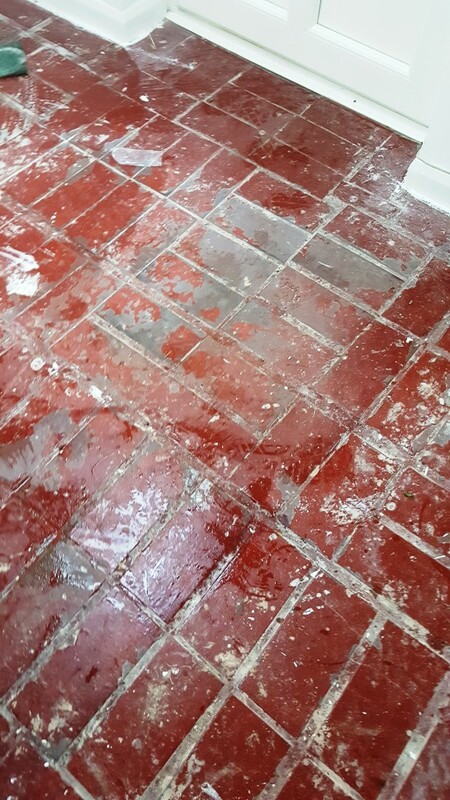 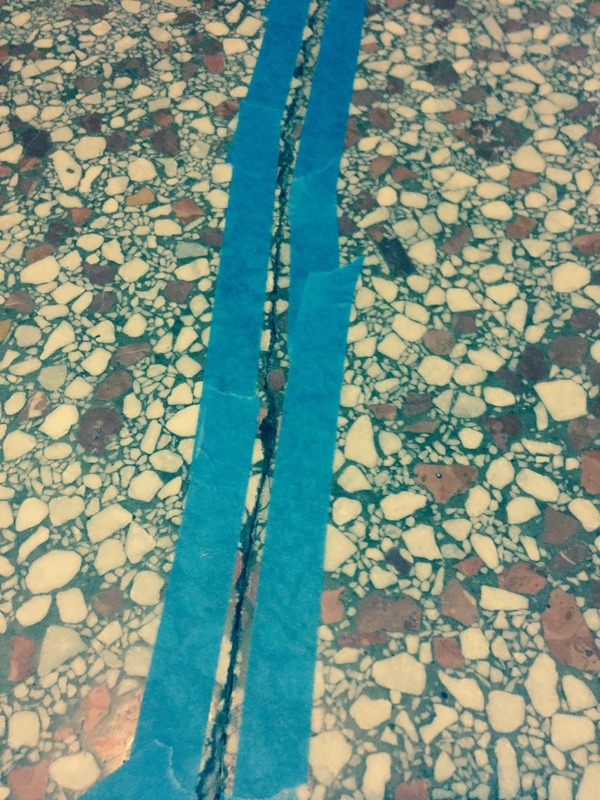 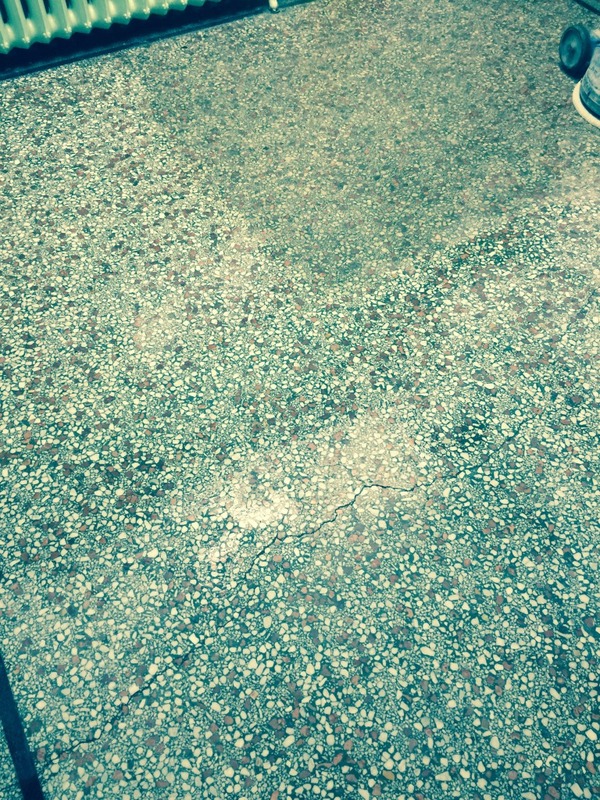 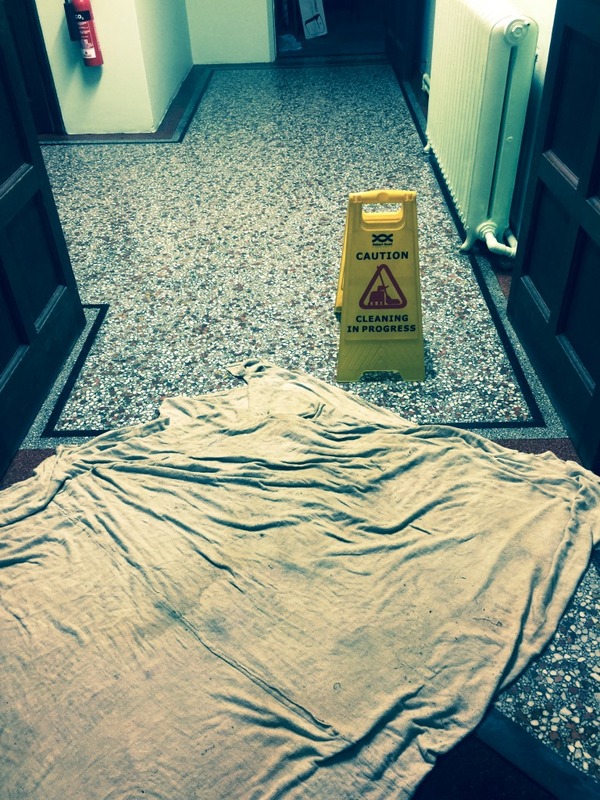 The floor was left for a week to dry out before I returned to seal it. 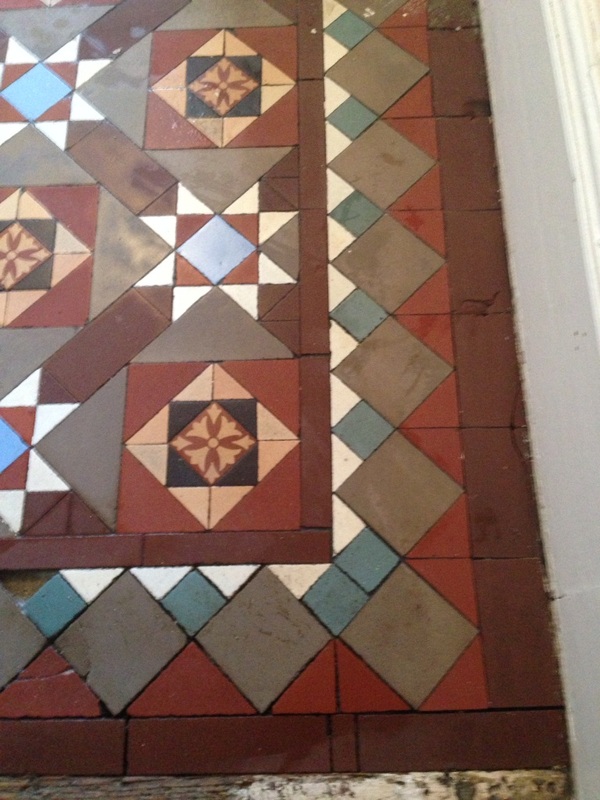 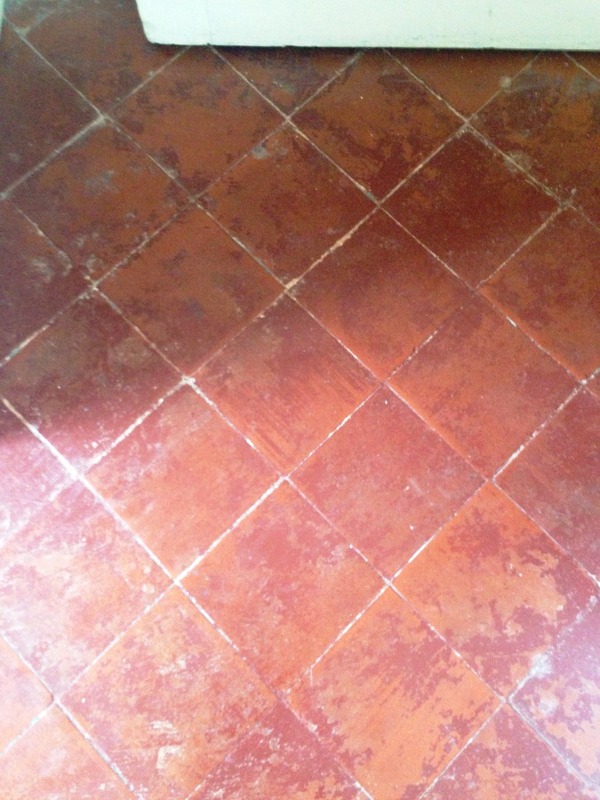 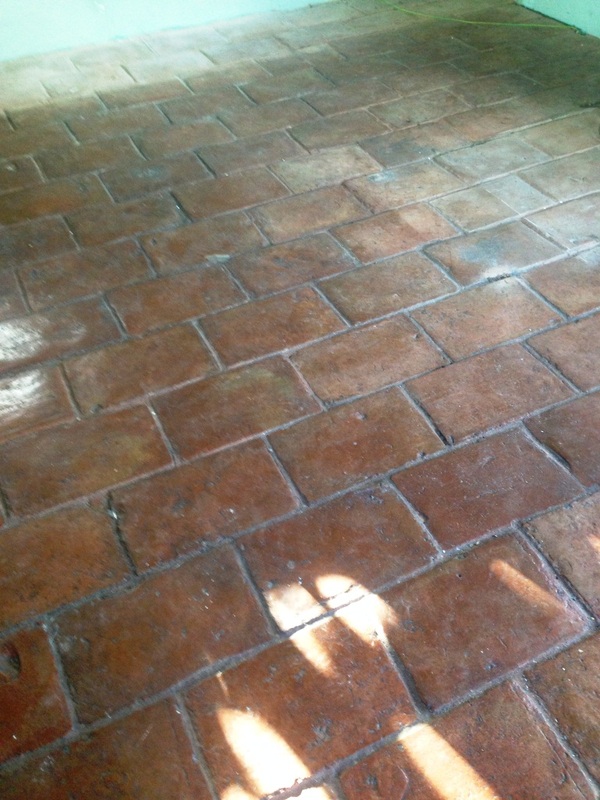 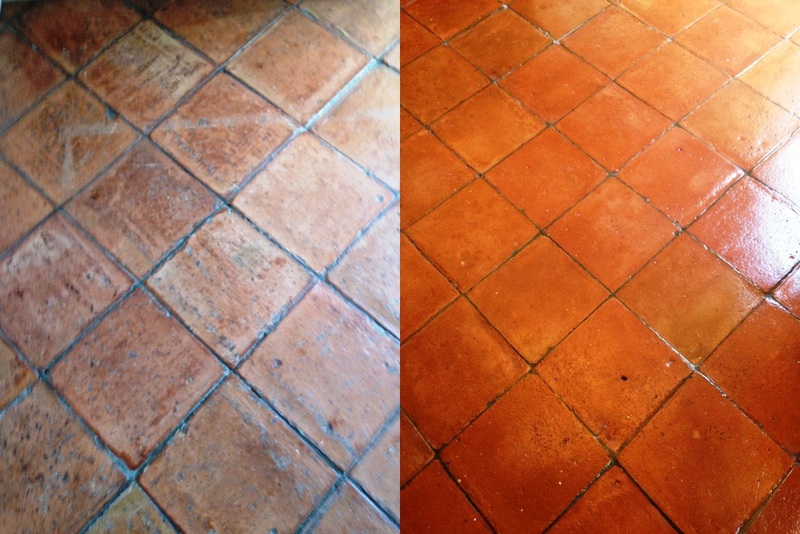 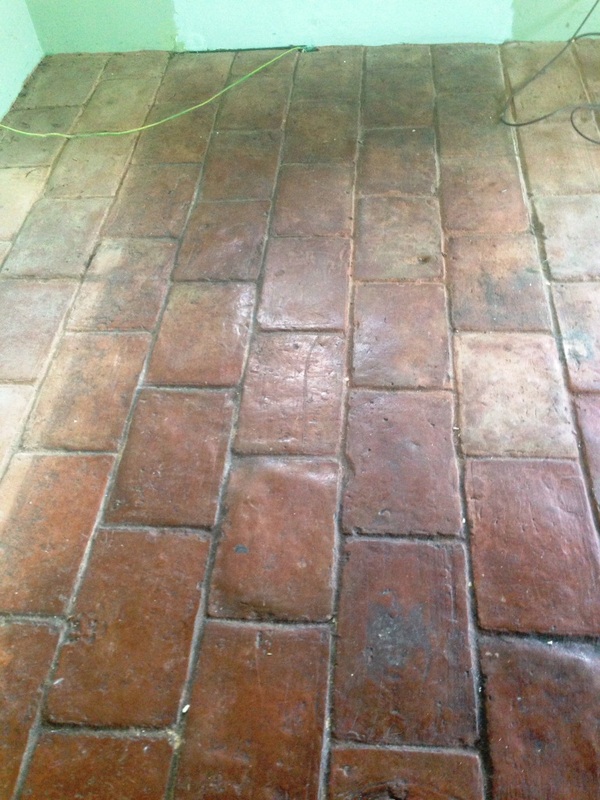 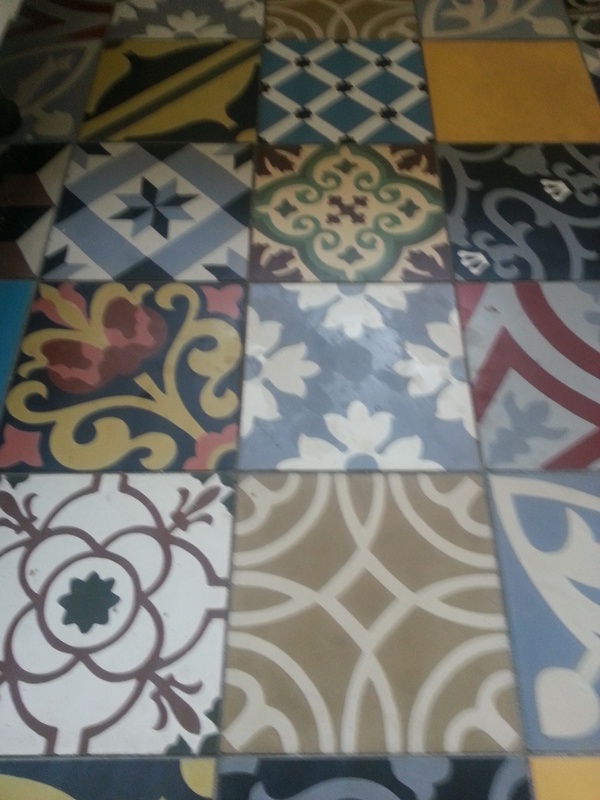 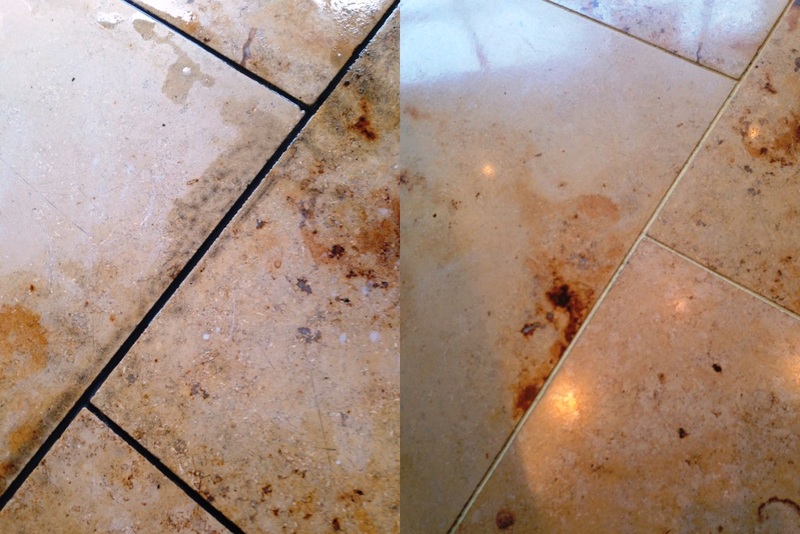 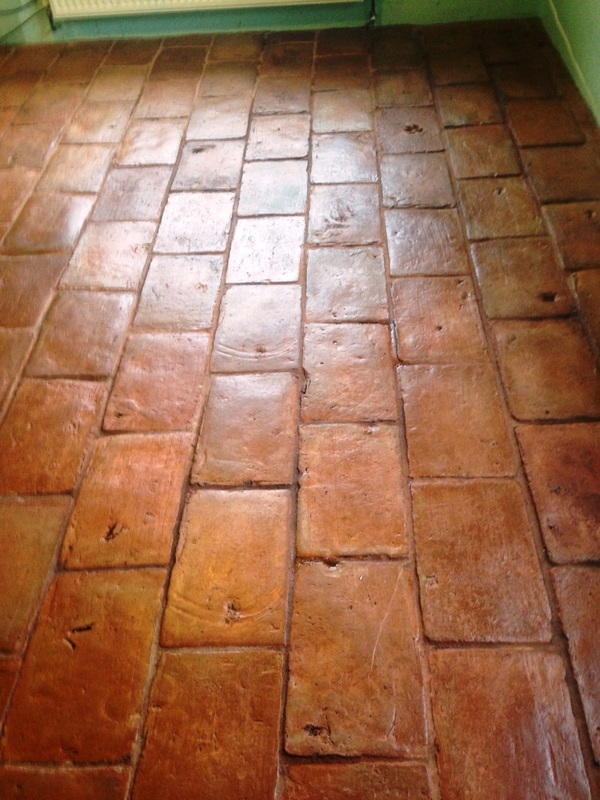 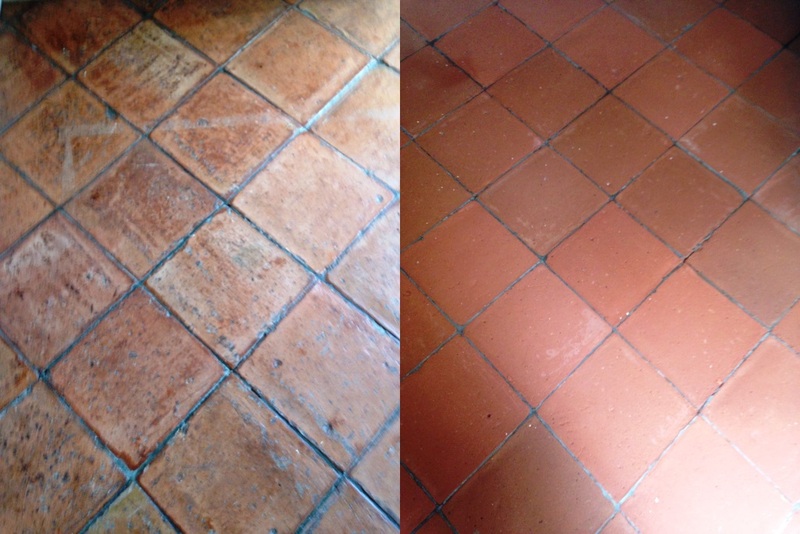 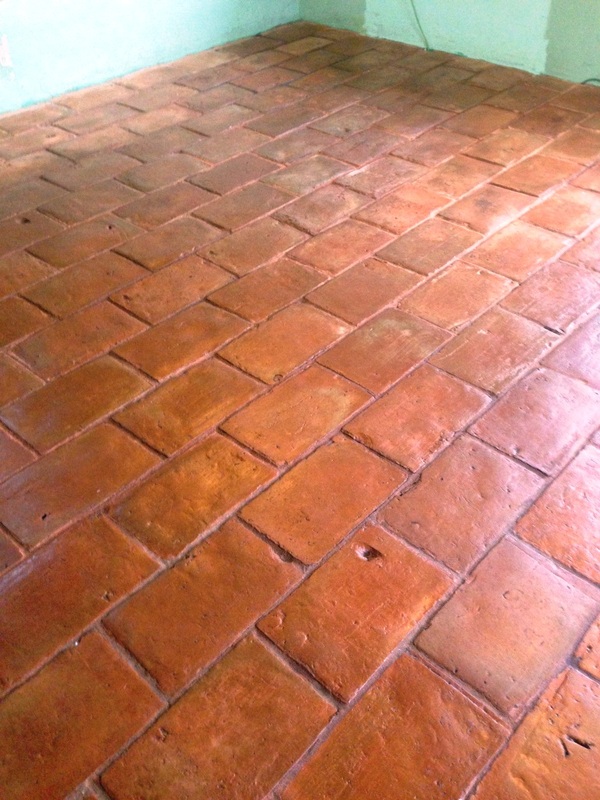 With these fantastic Victorian tiles now muck-free, I proceeded to seal the floor. 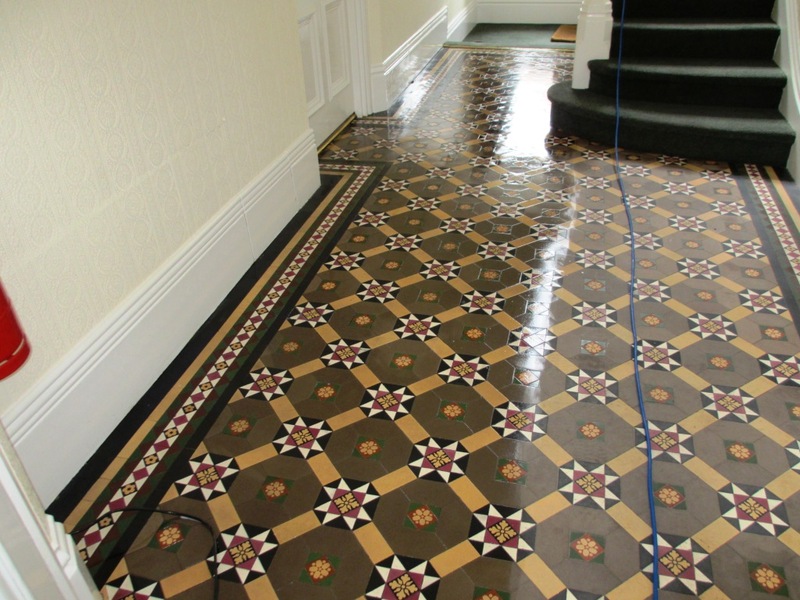 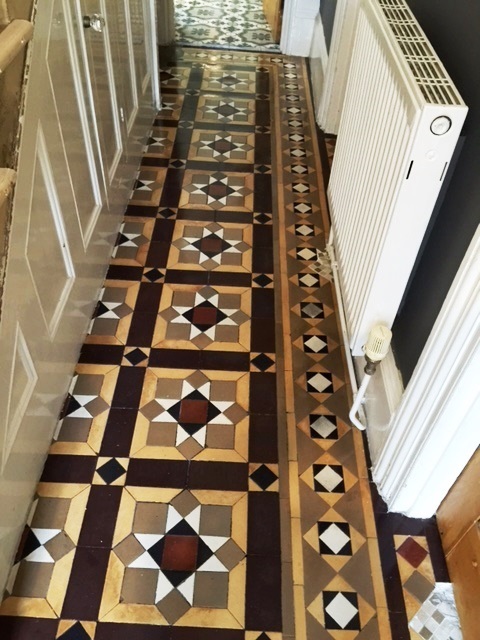 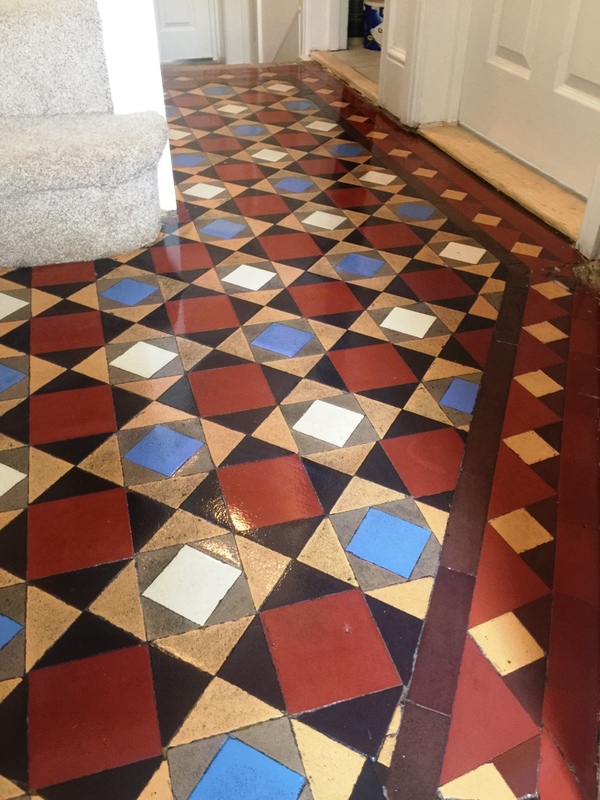 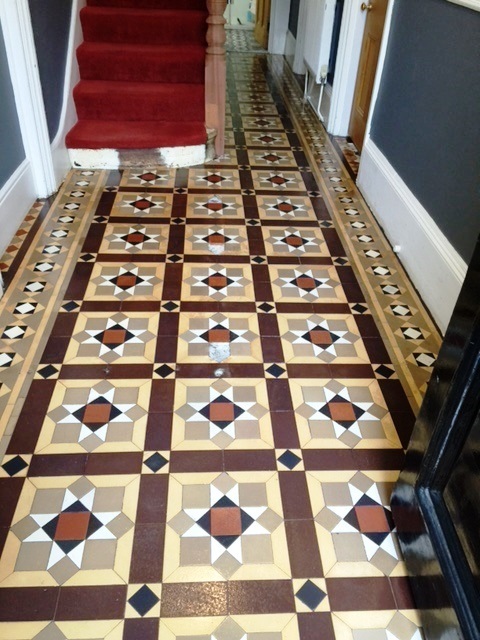 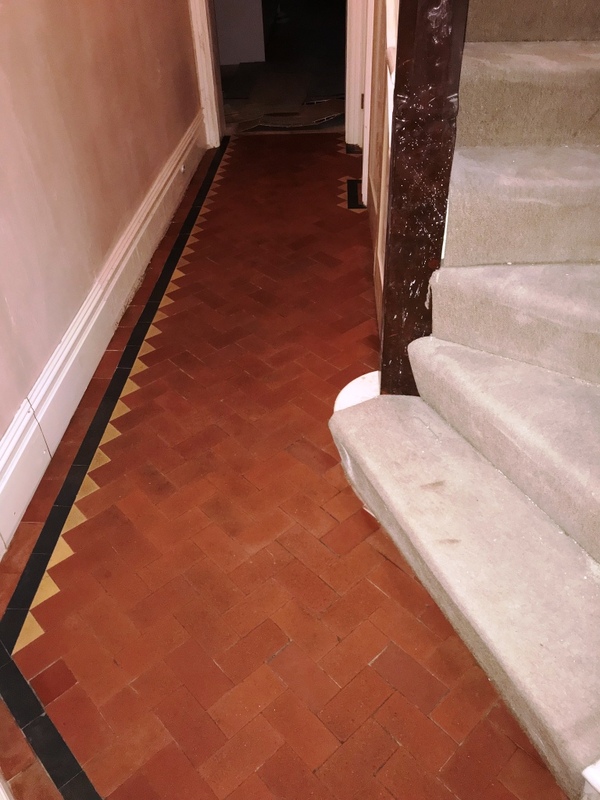 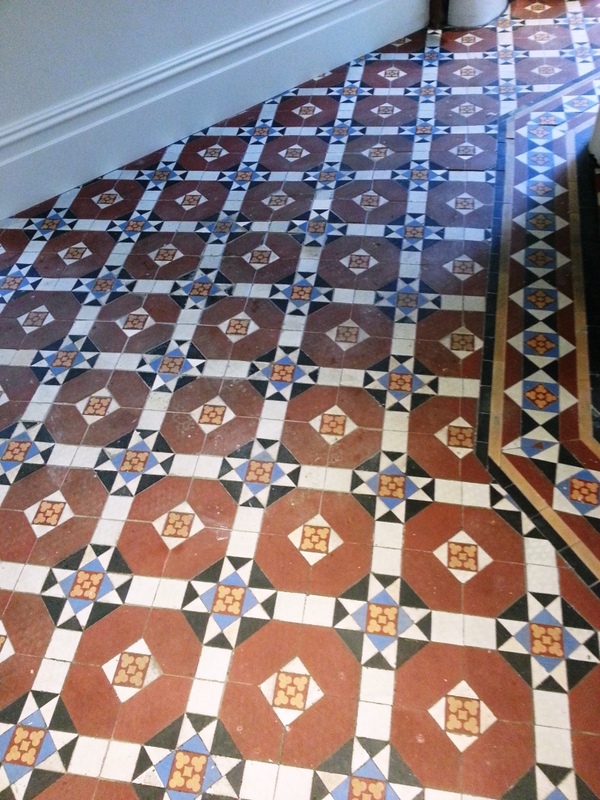 I initially applied a single coat of Tile Doctor Colour Grow, which is an impregnating, colour-enhancing sealer that really brings out the colourful features of patterned Victorian tiled floors like this one. 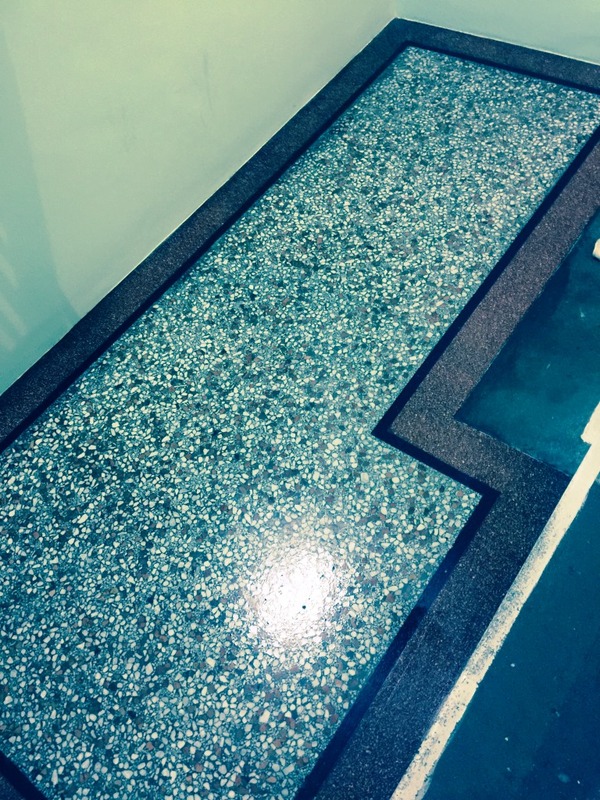 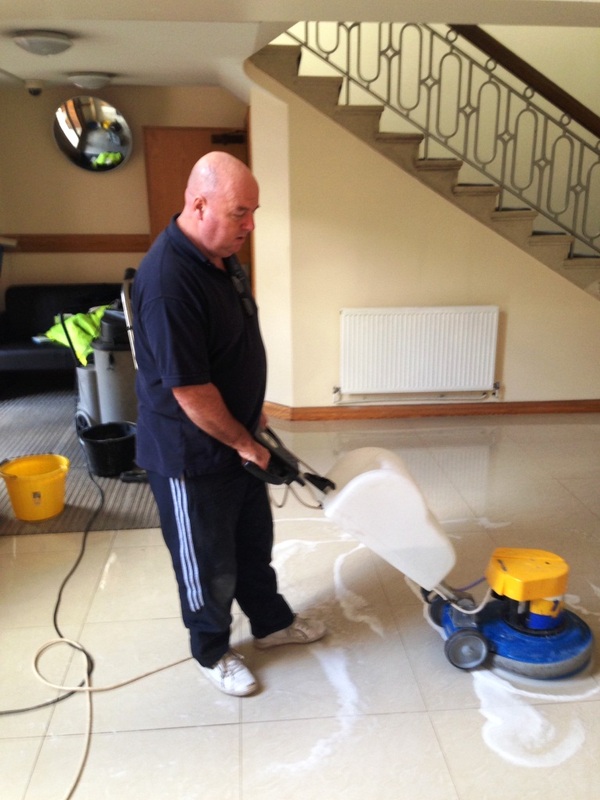 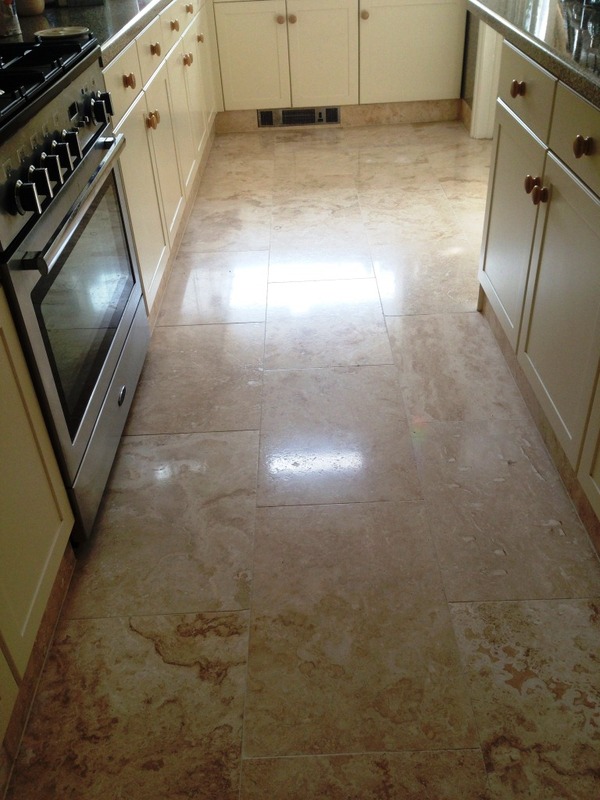 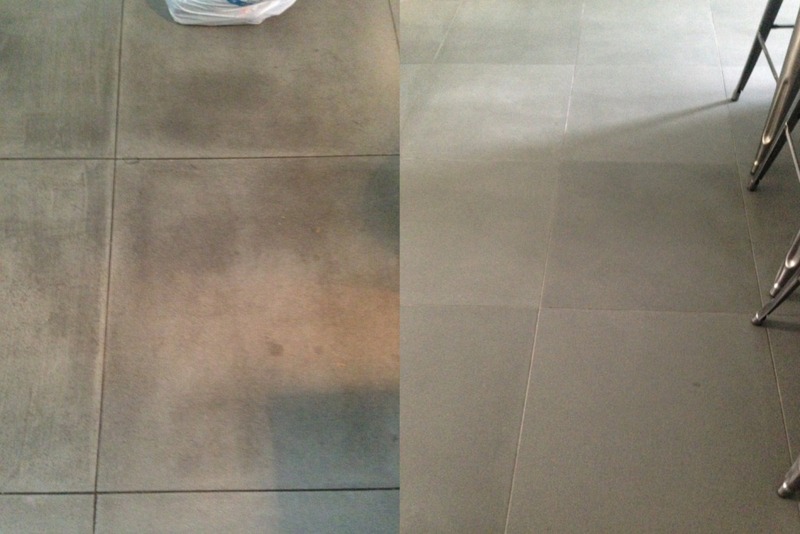 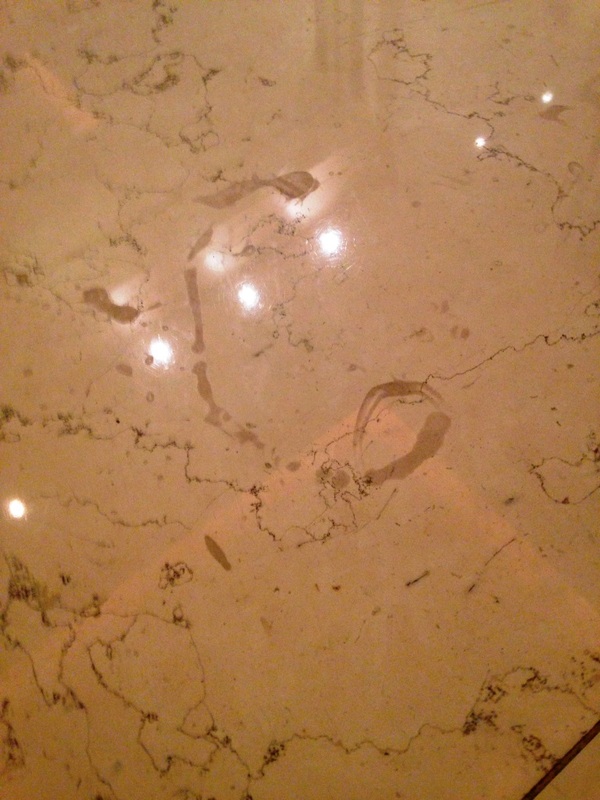 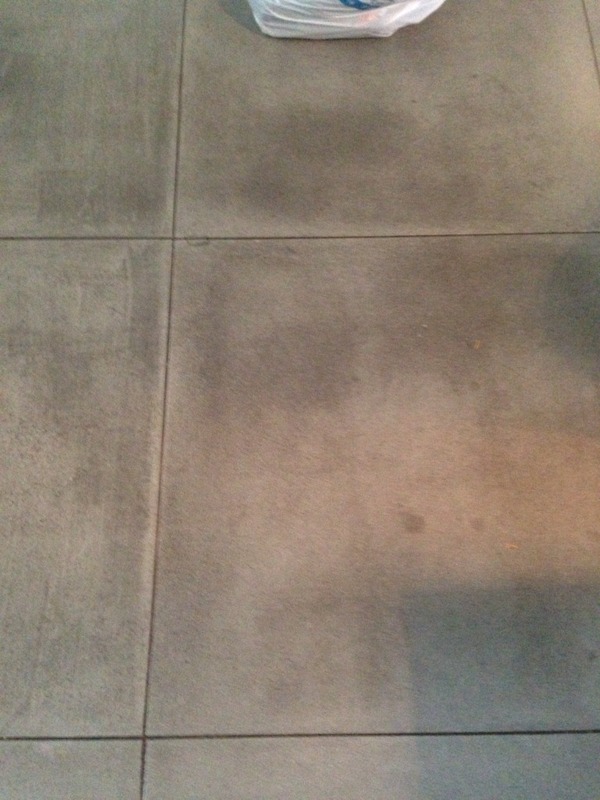 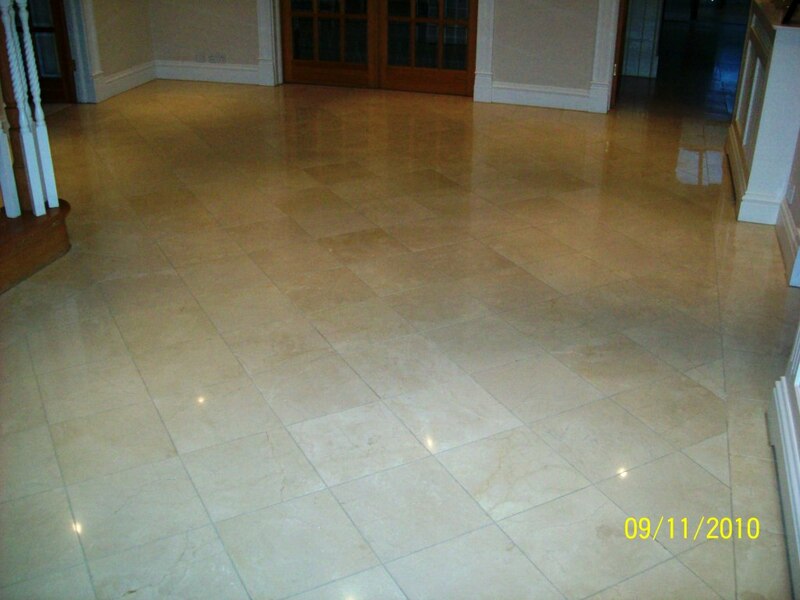 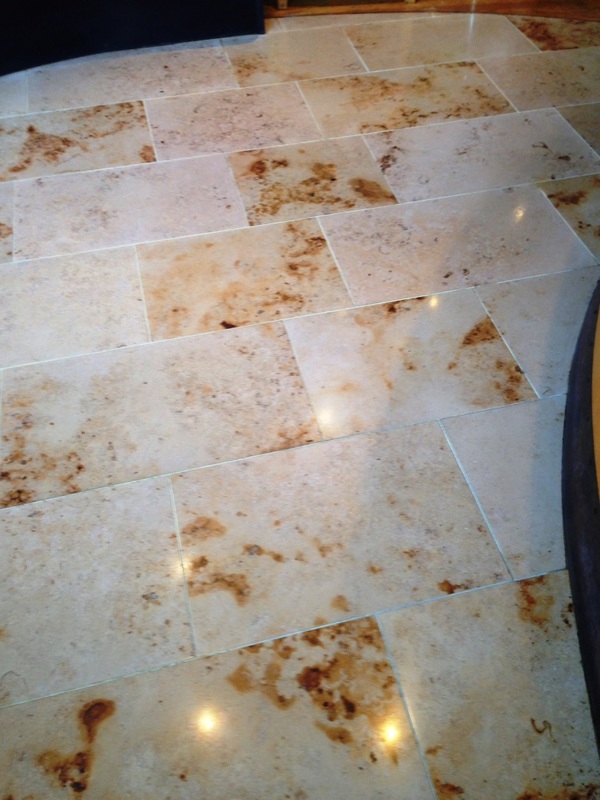 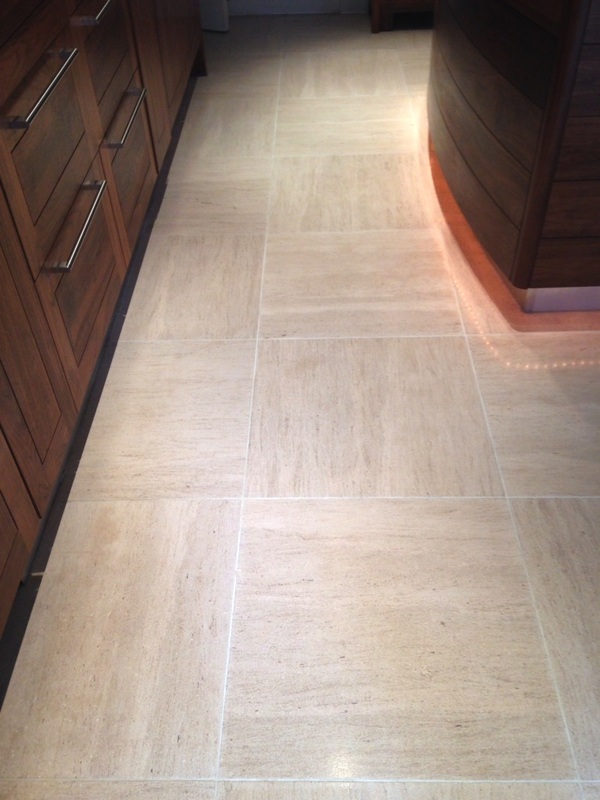 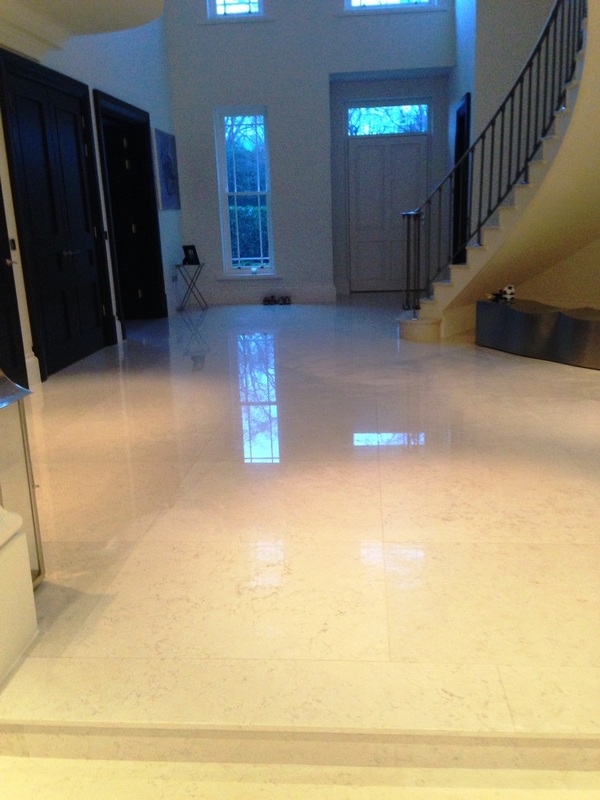 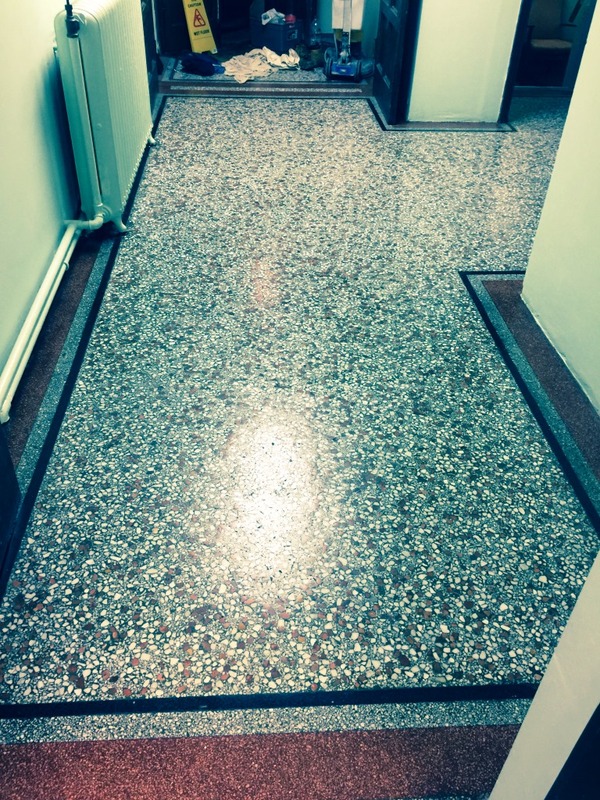 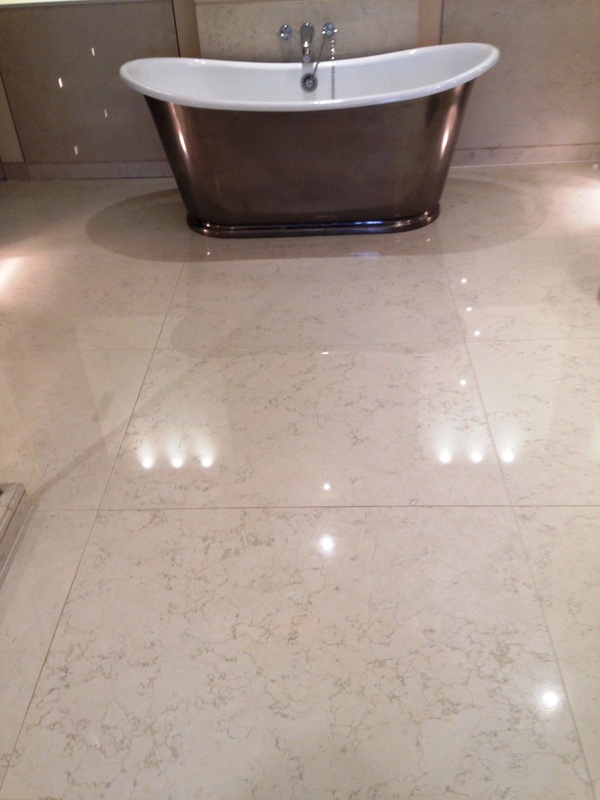 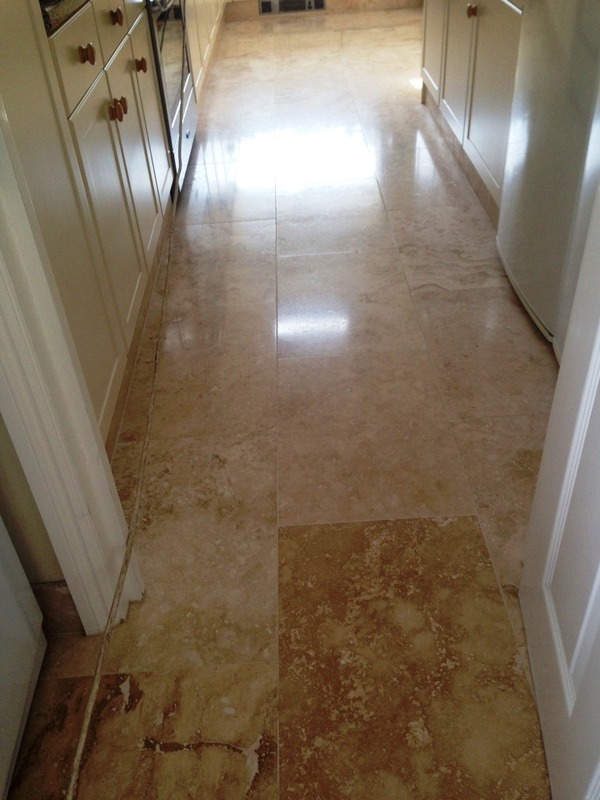 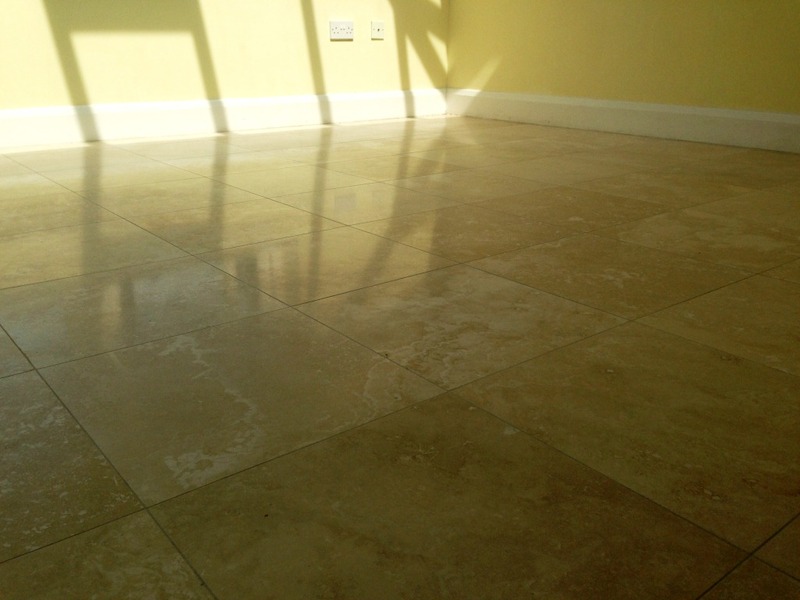 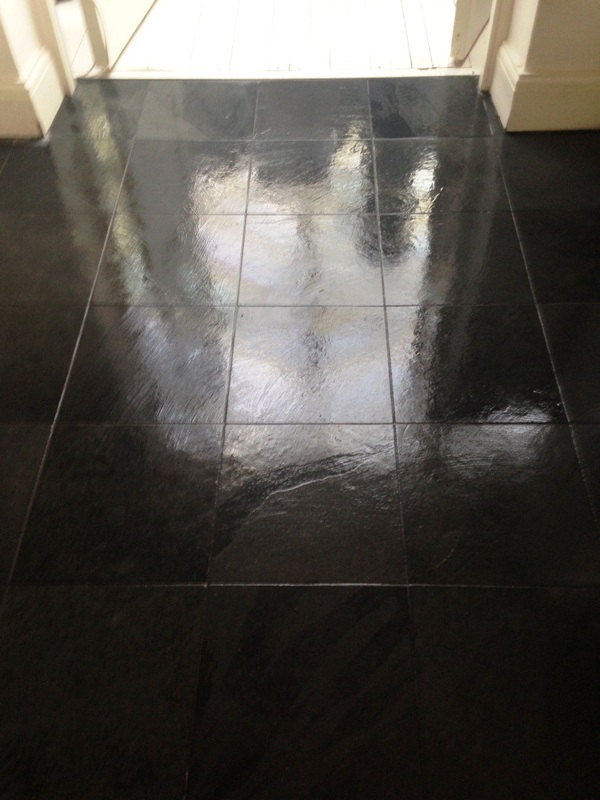 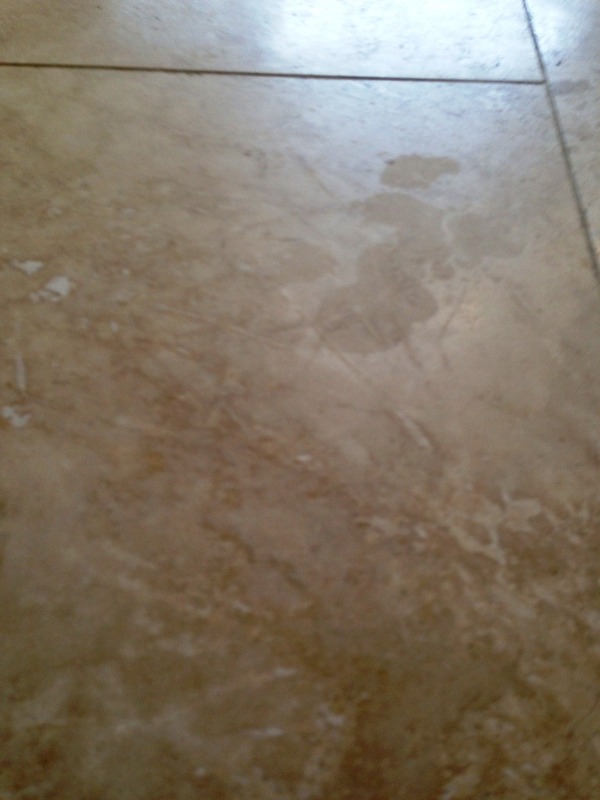 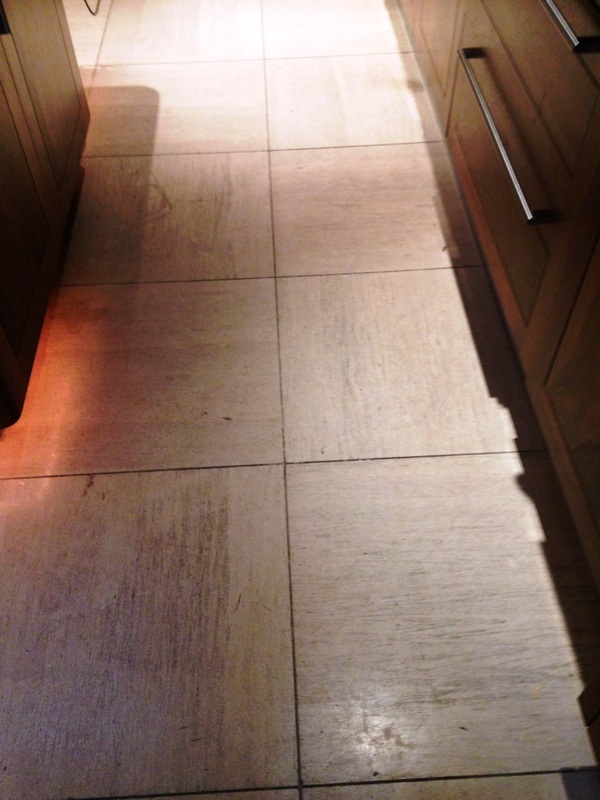 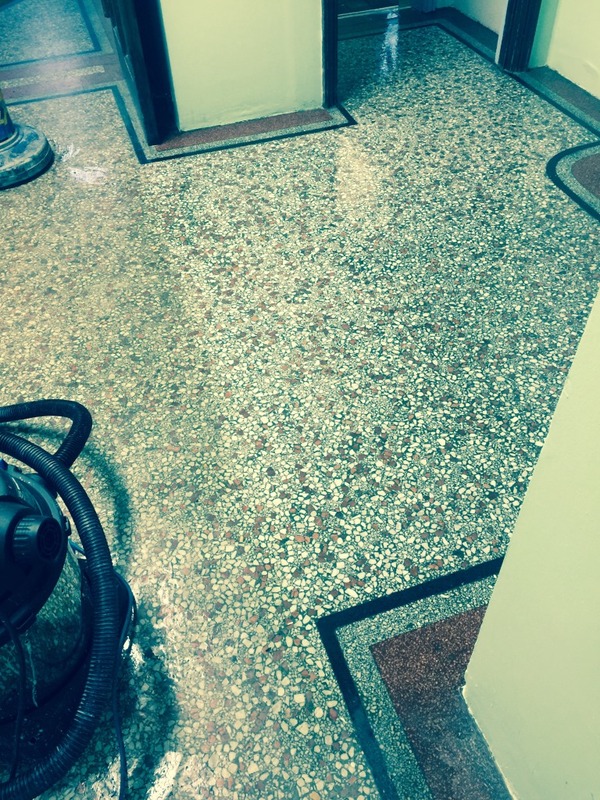 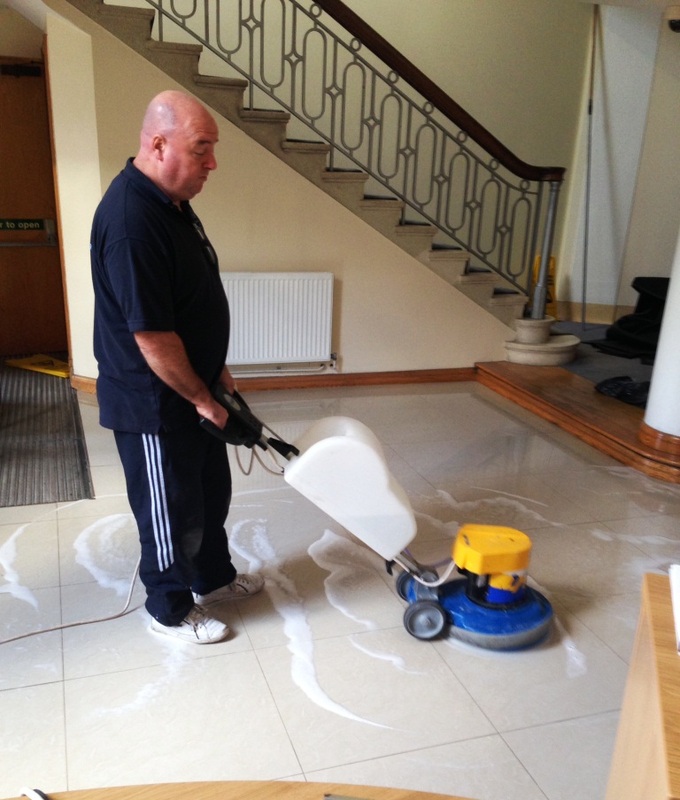 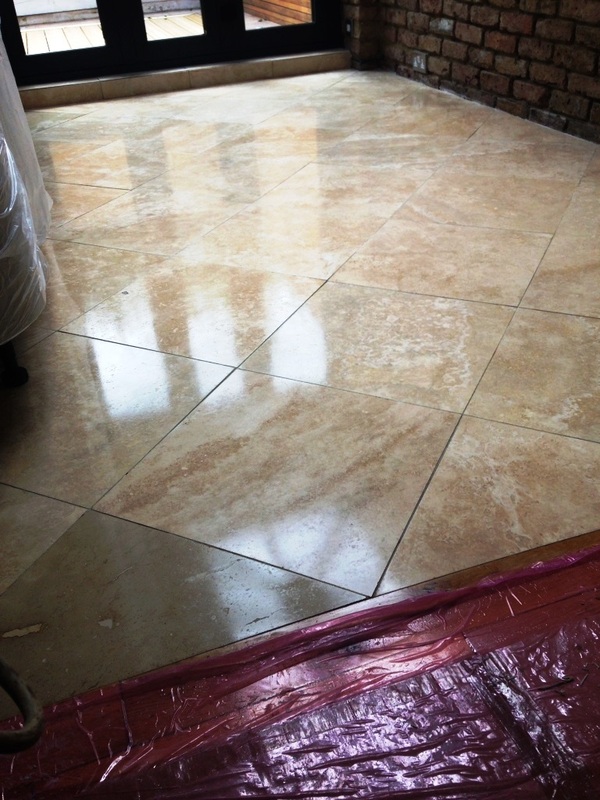 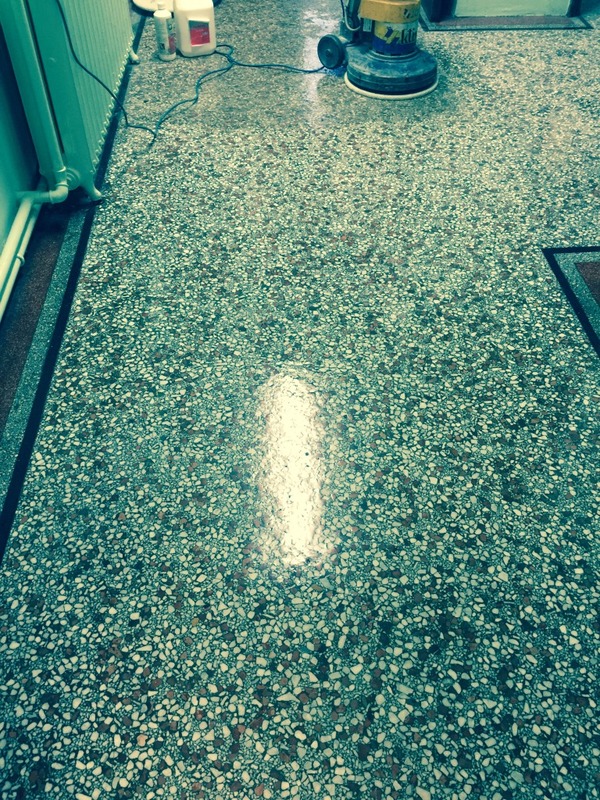 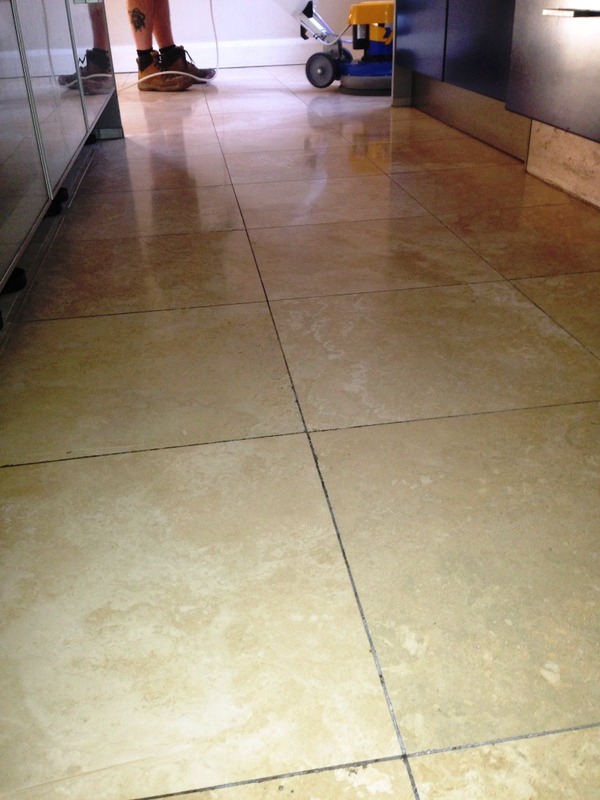 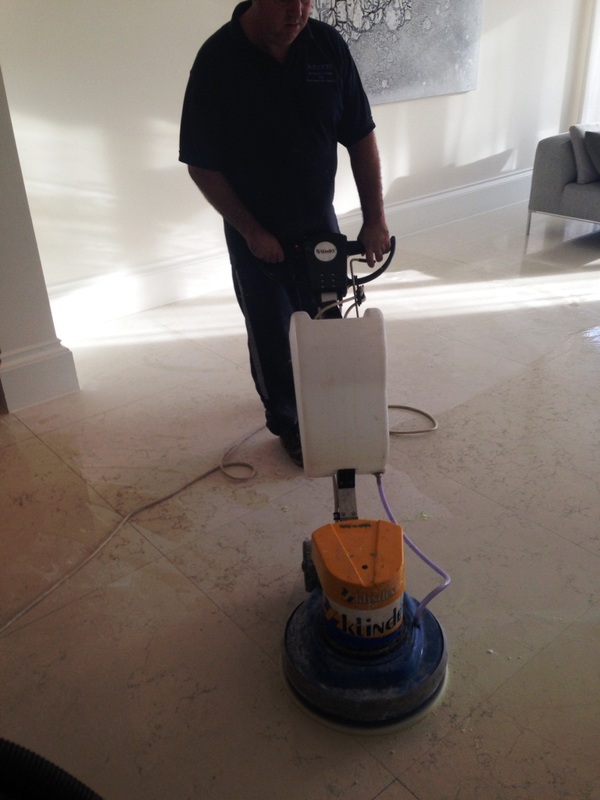 Once this initial coat of sealant had dried in, I asked the customer which kind of finish she preferred for the floor. 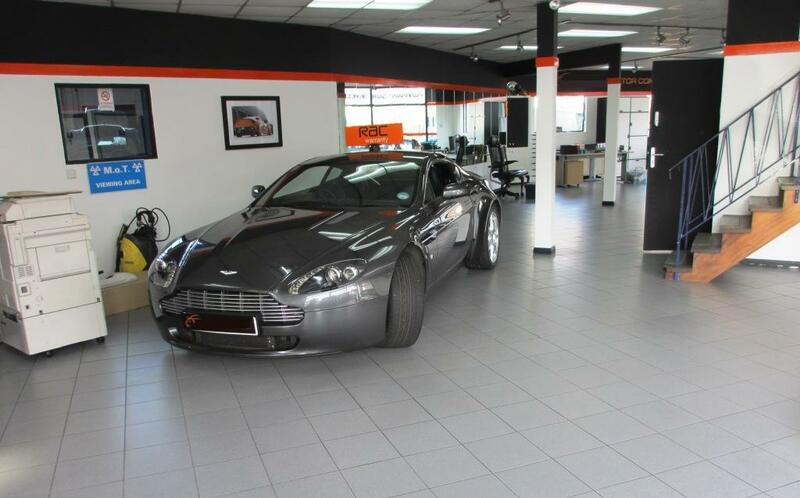 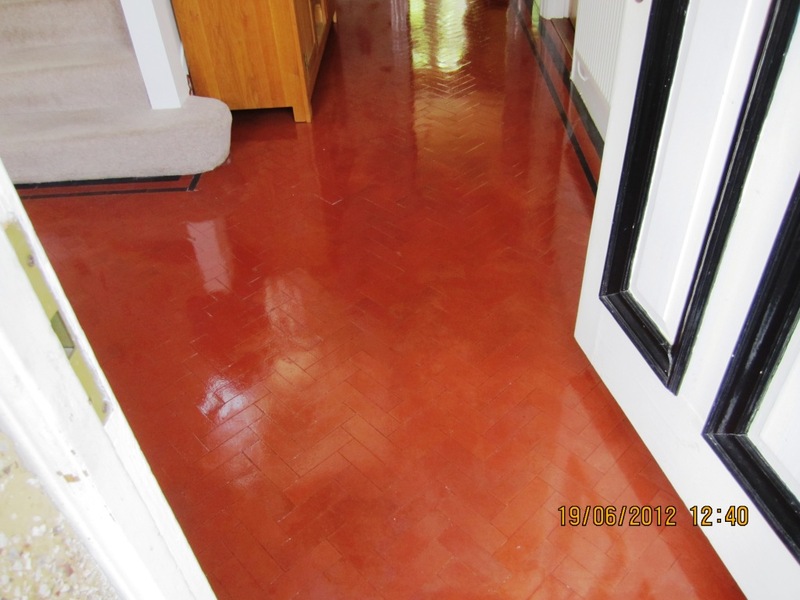 She decided on a sheen finish, and so I laid down an extra five layers of Colour Grow to ensure the desired appearance, as well as to guarantee durable surface protection against dirt, stains and spillages. 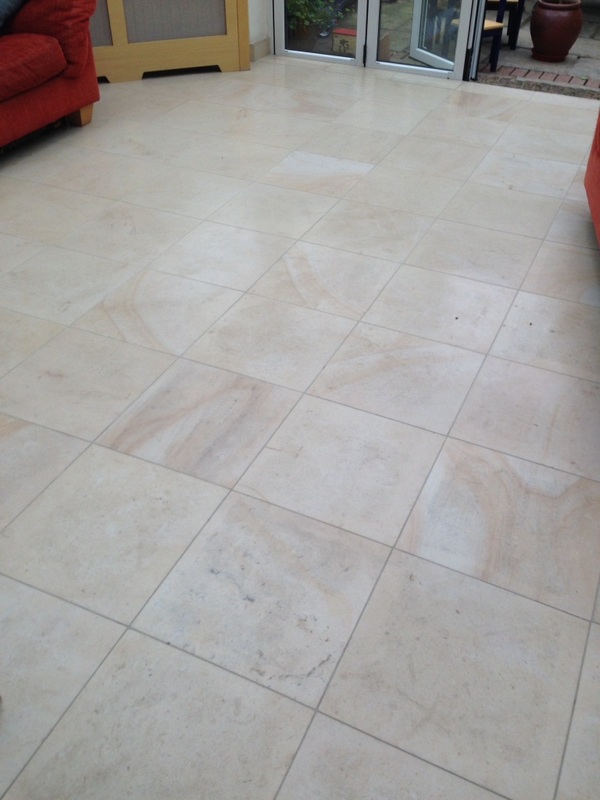 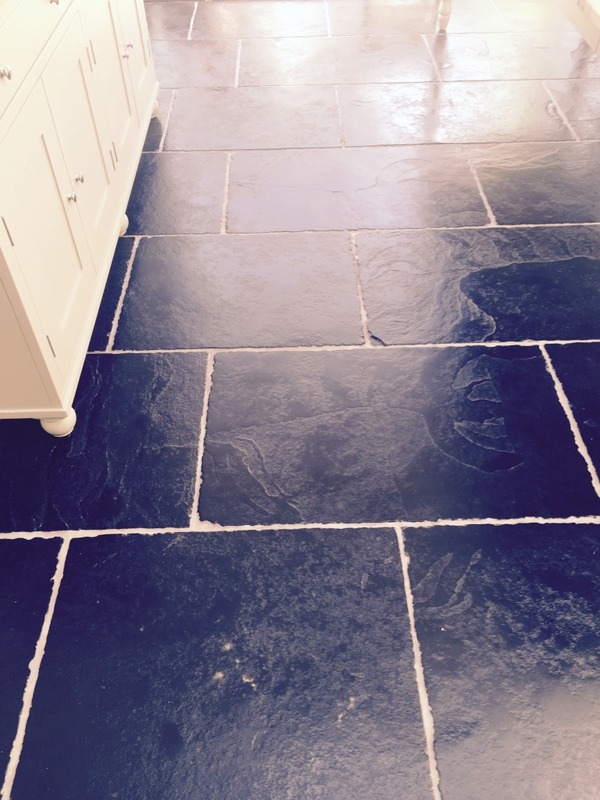 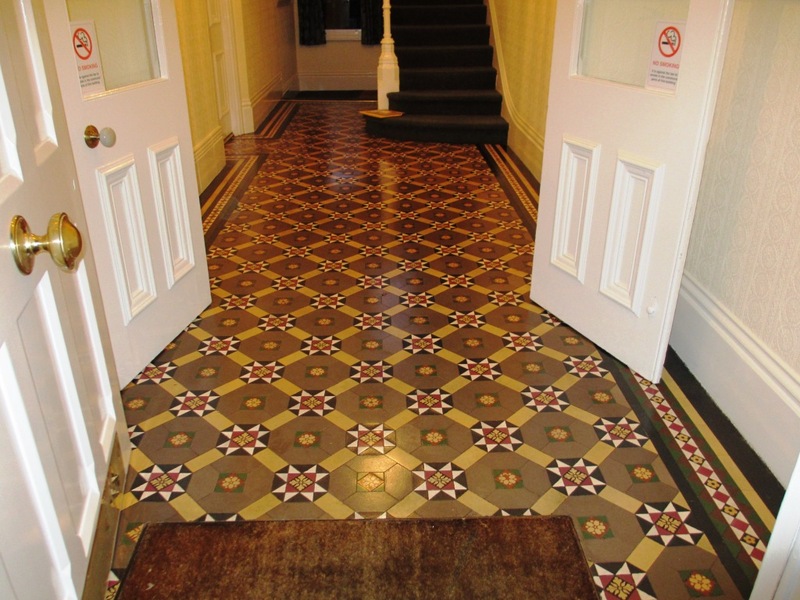 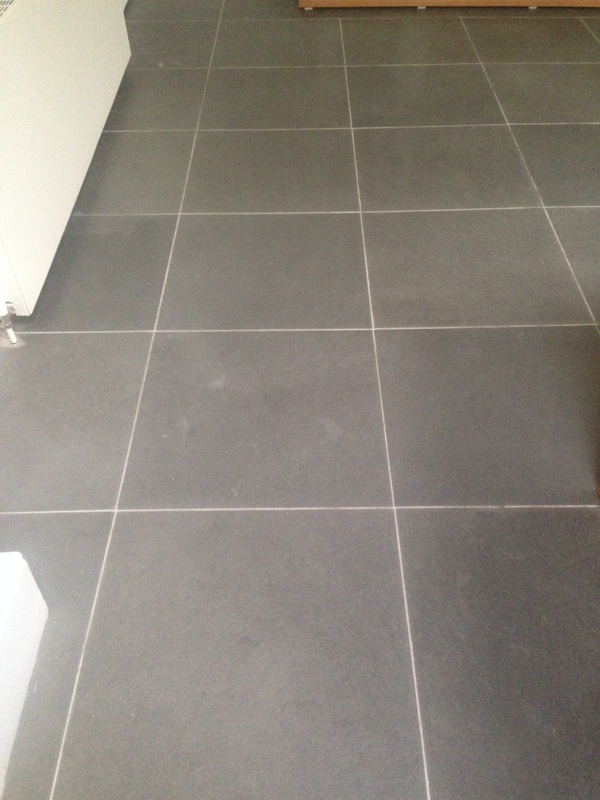 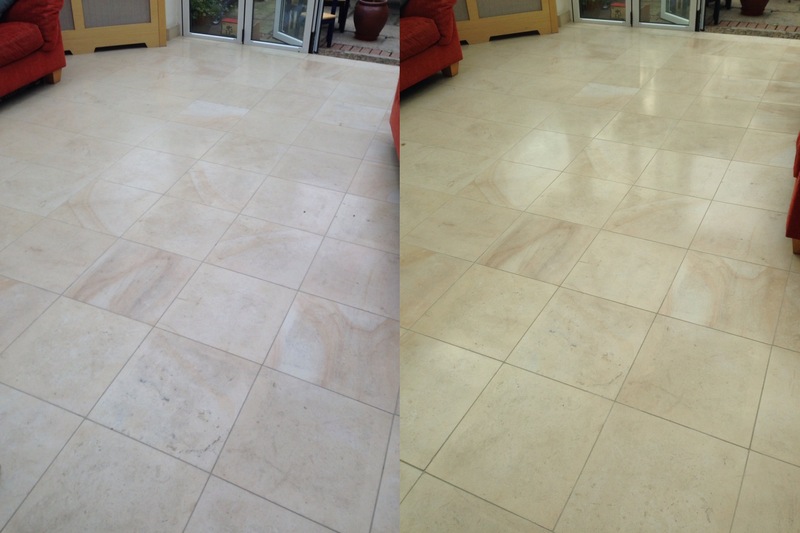 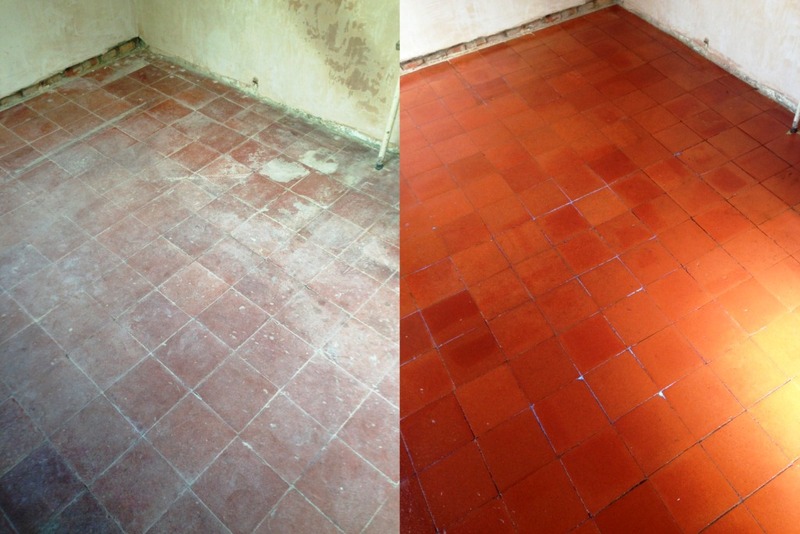 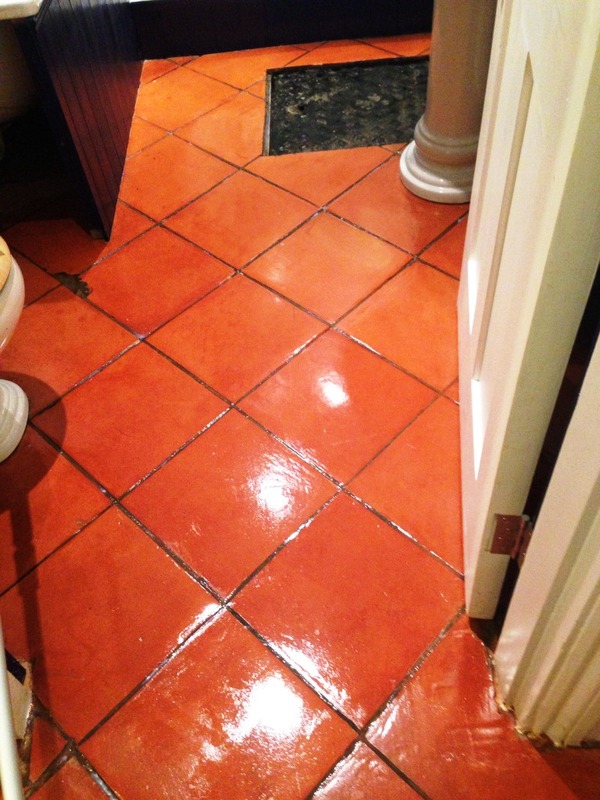 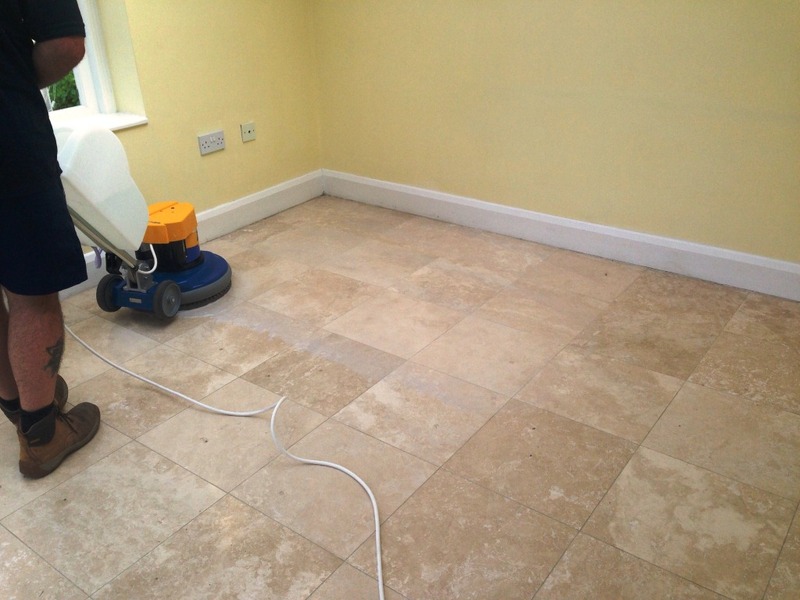 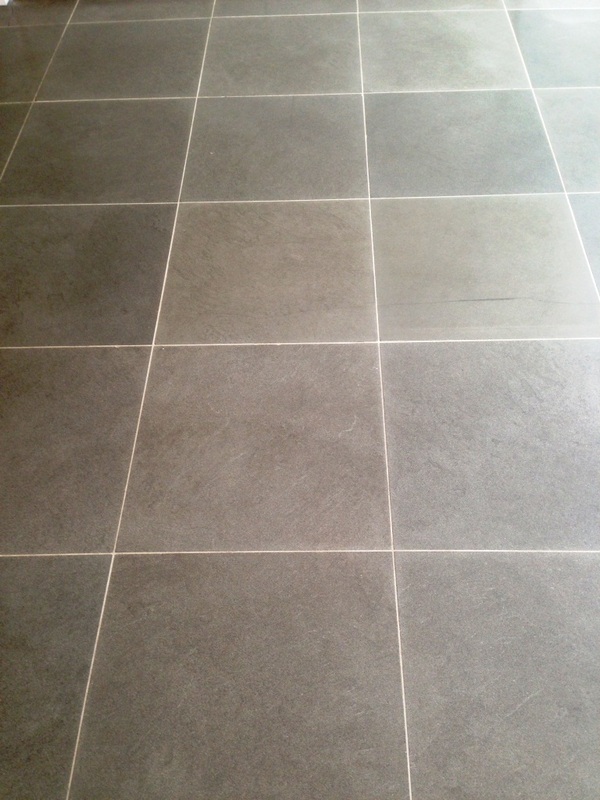 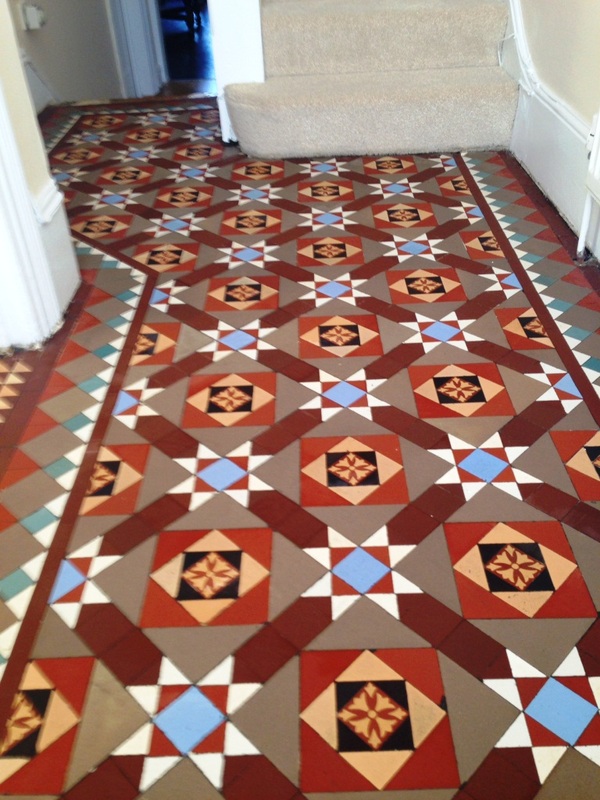 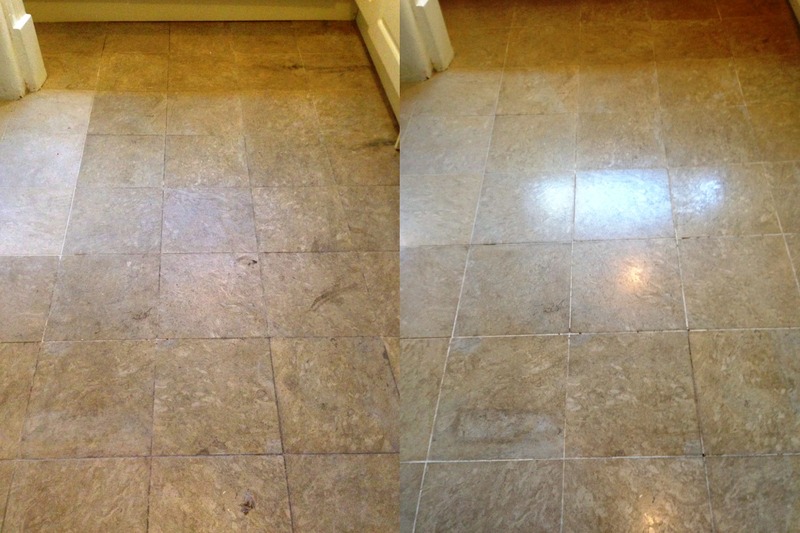 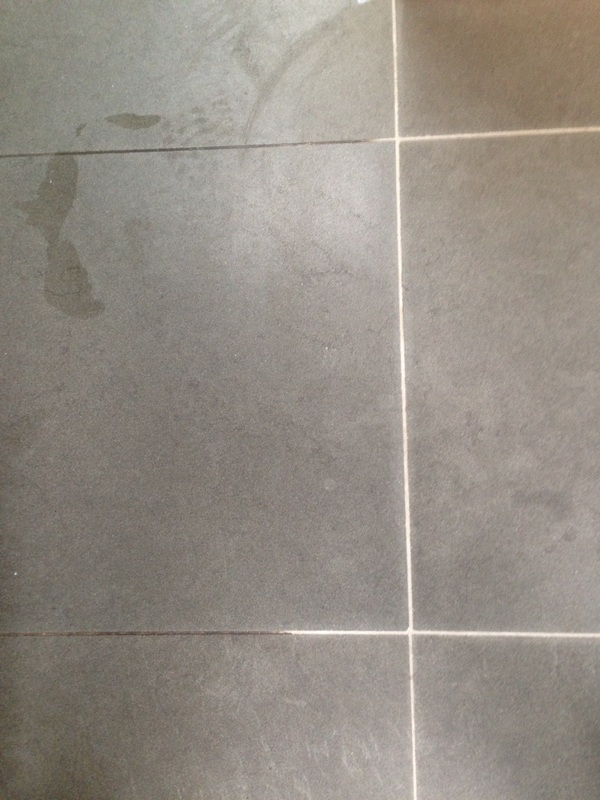 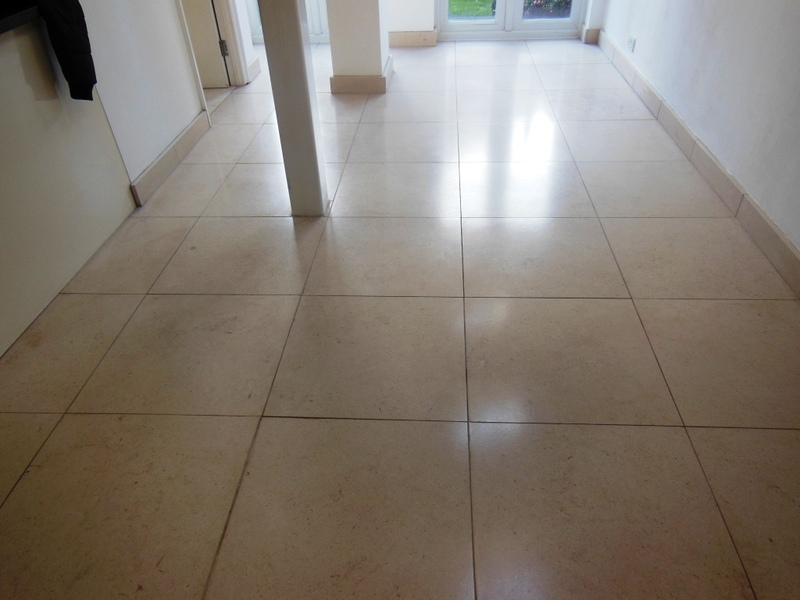 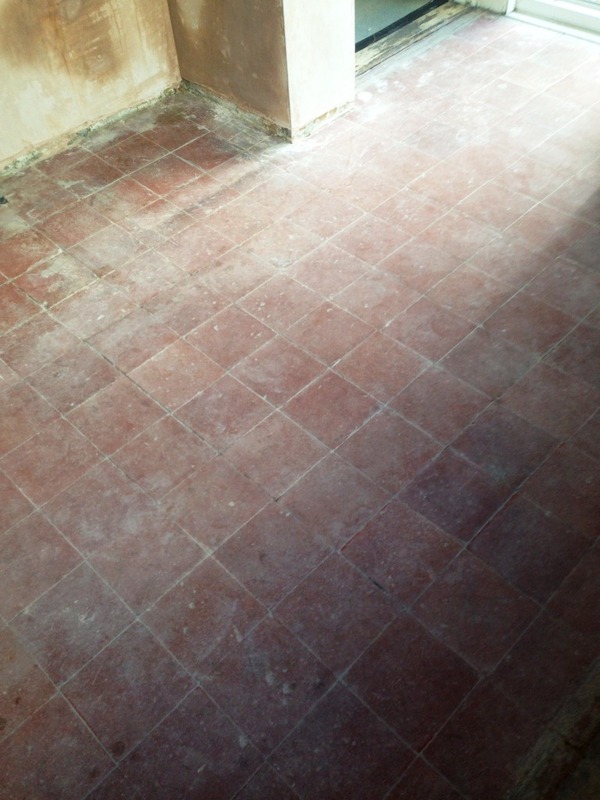 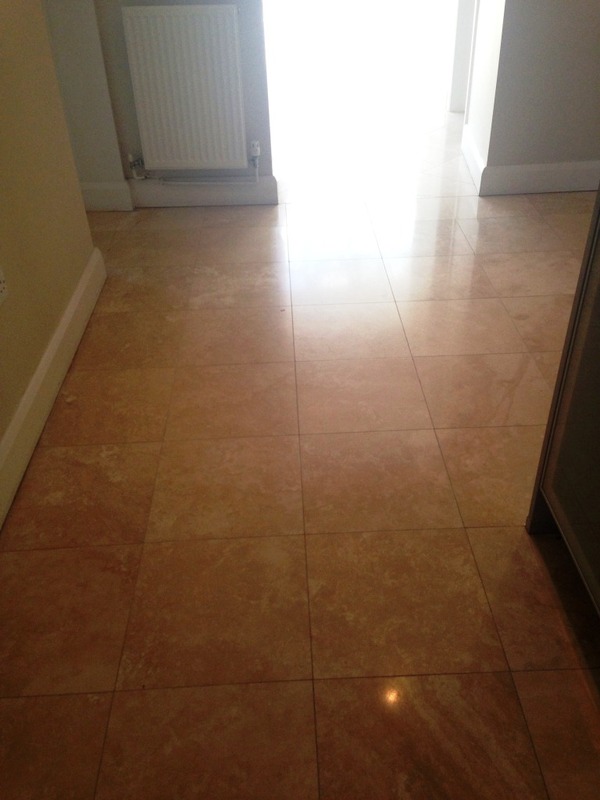 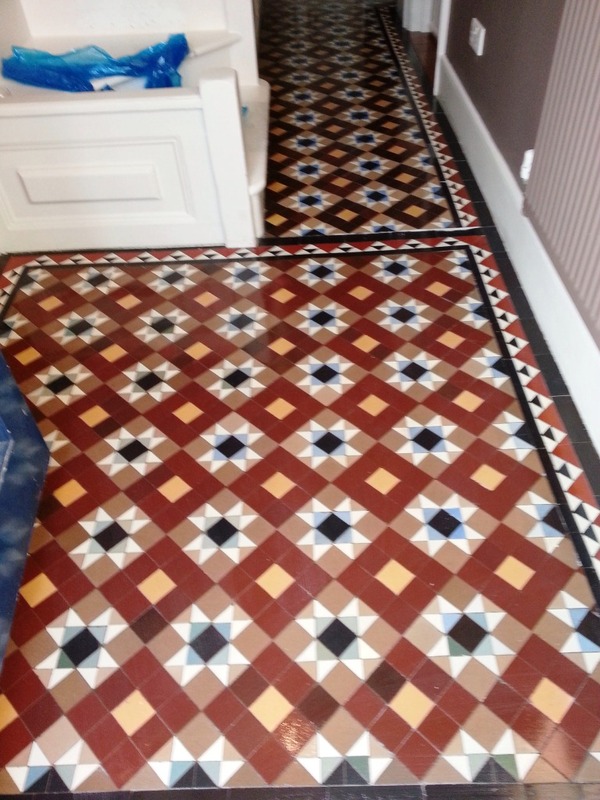 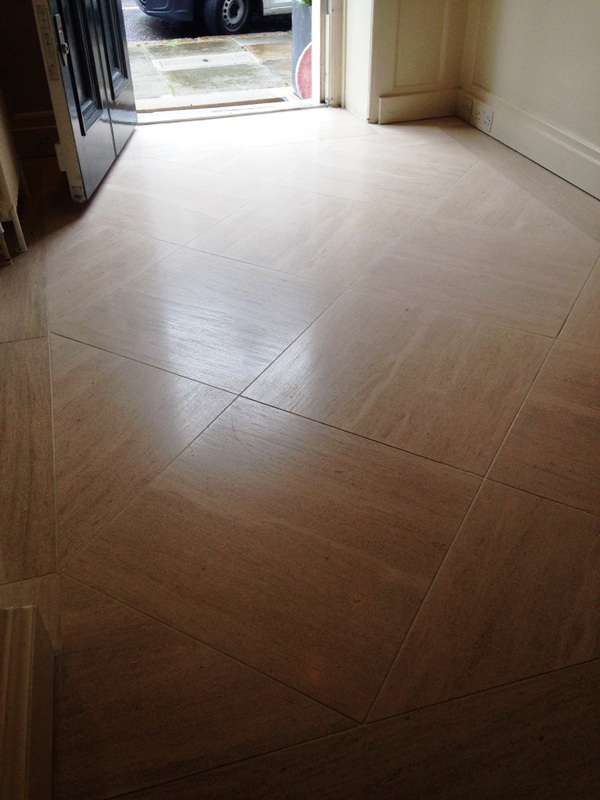 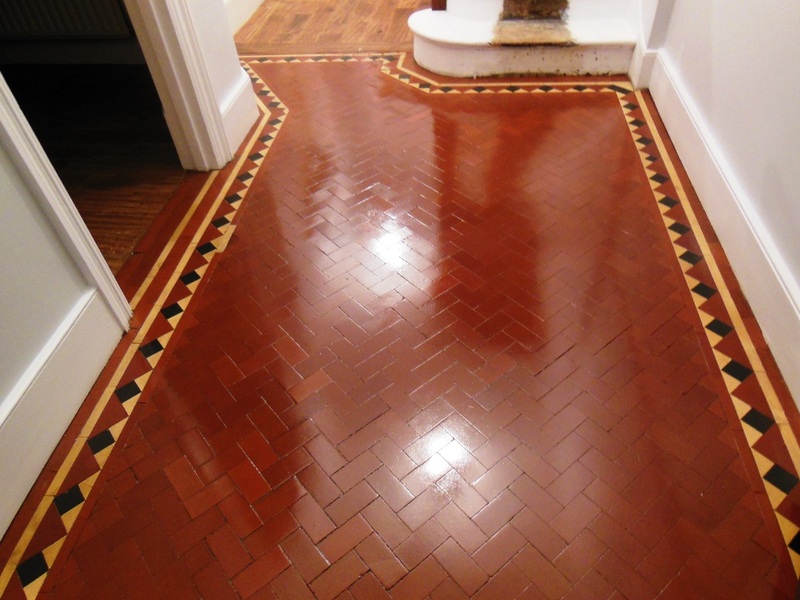 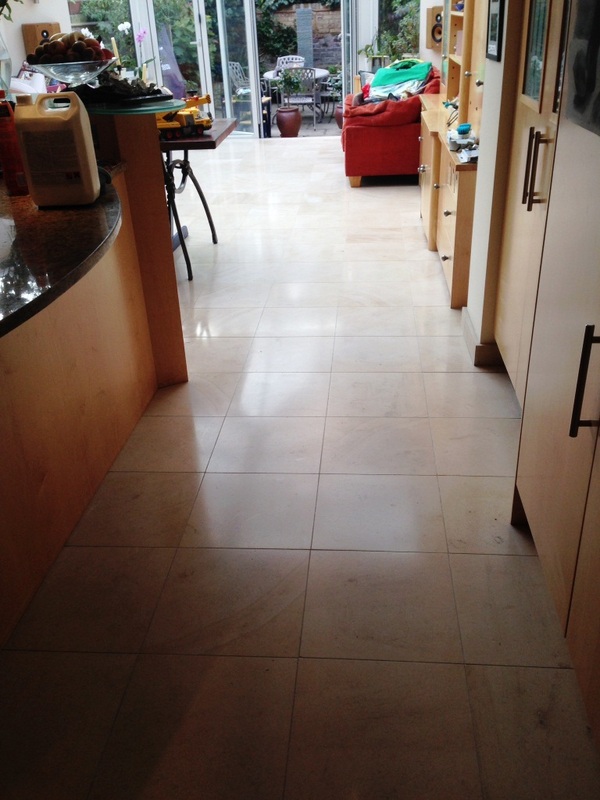 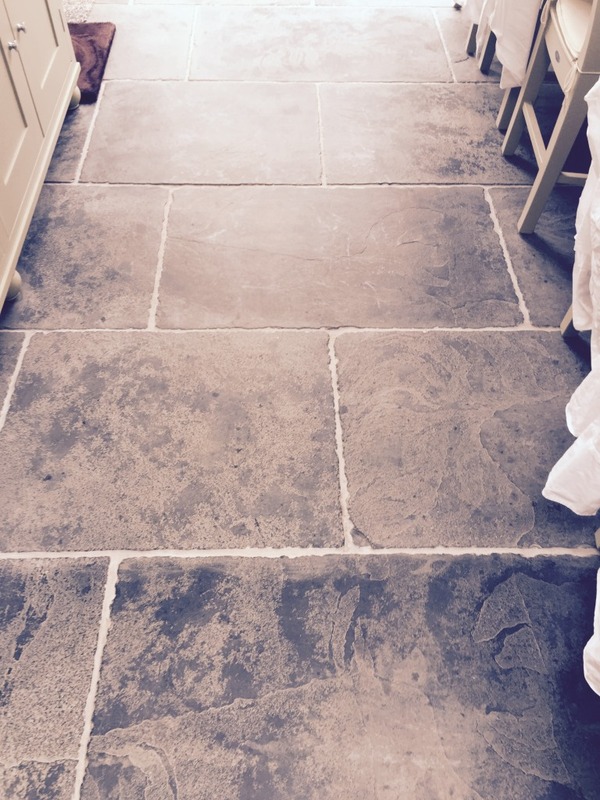 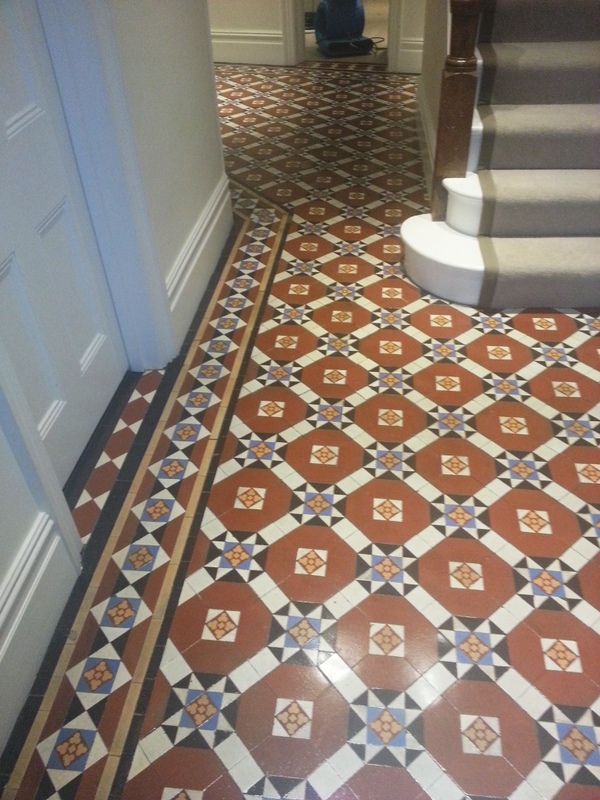 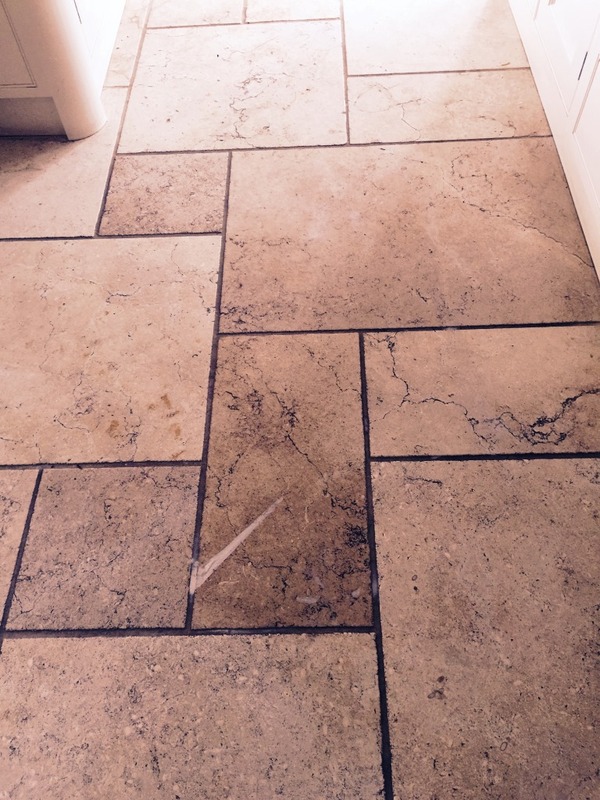 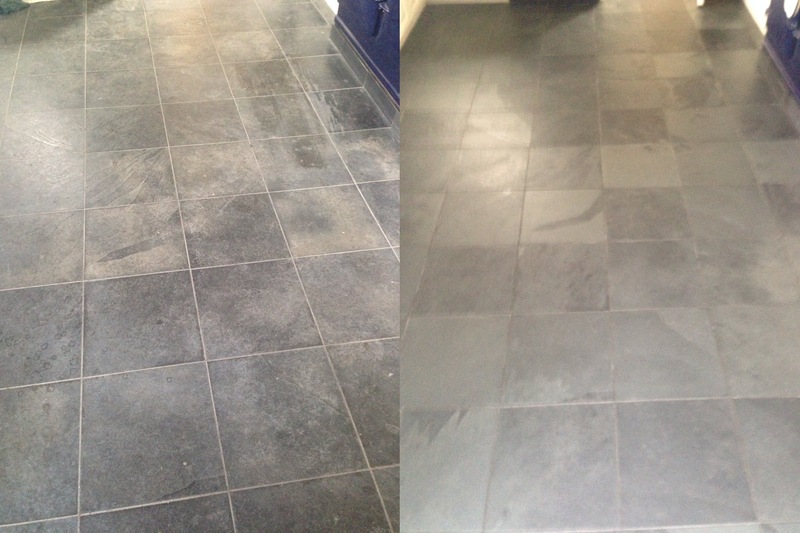 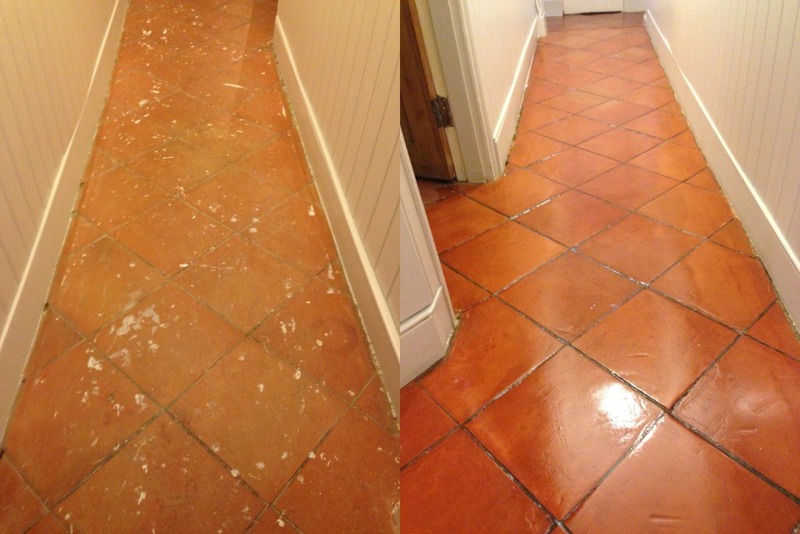 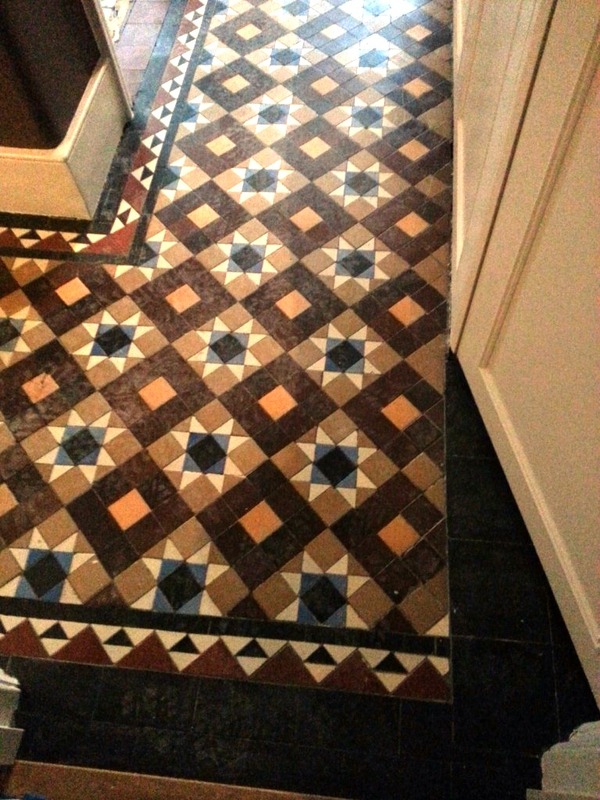 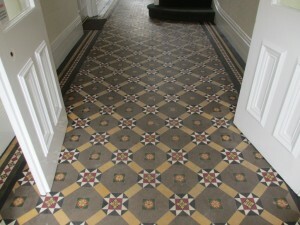 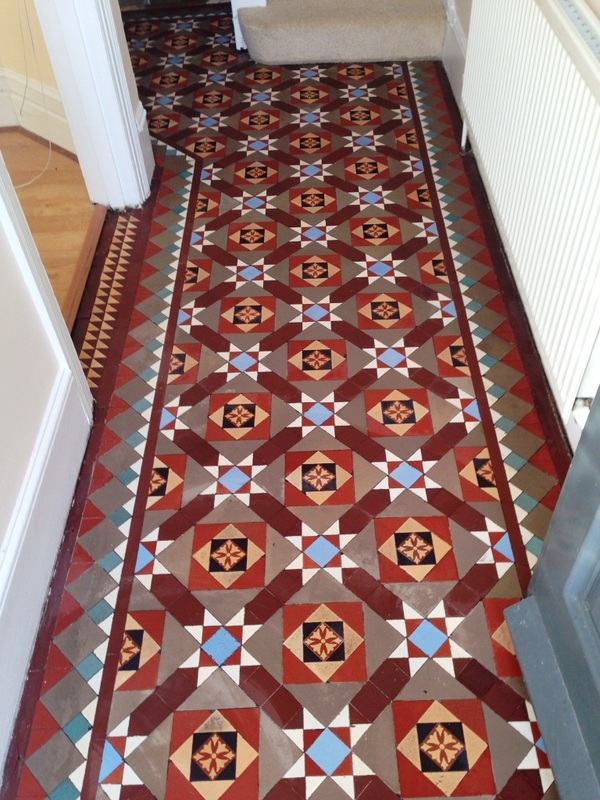 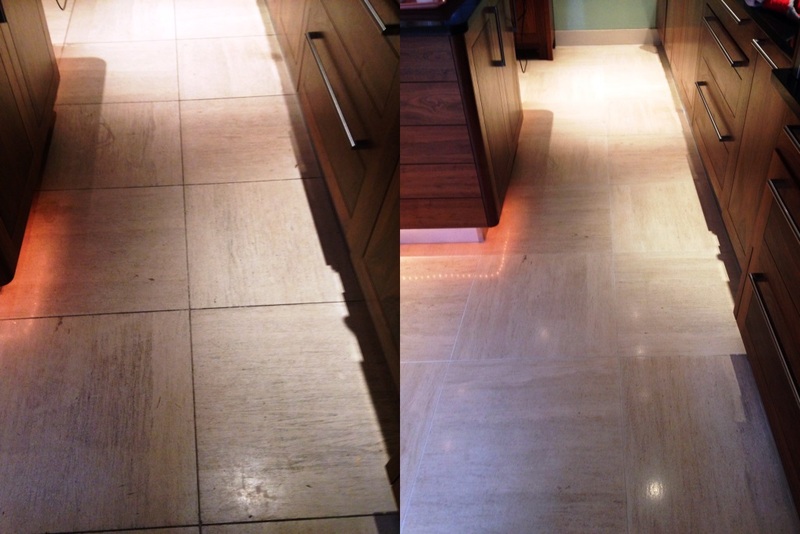 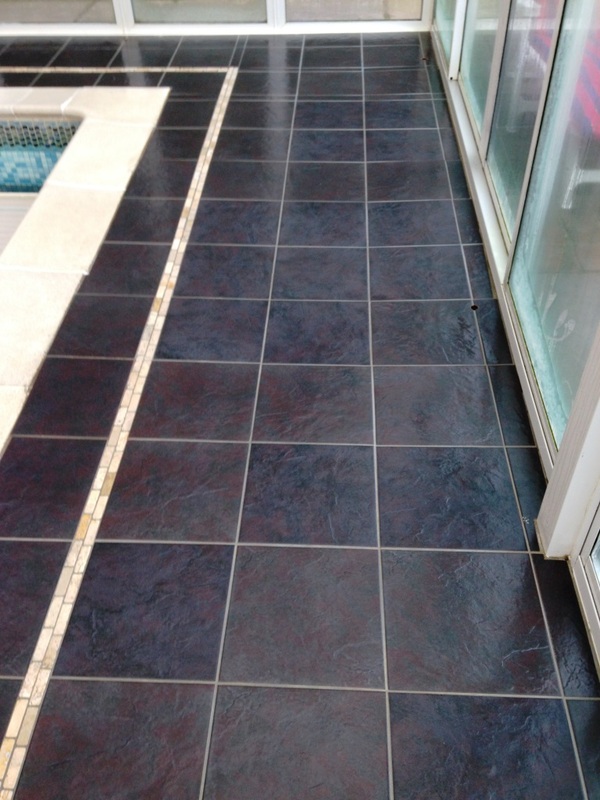 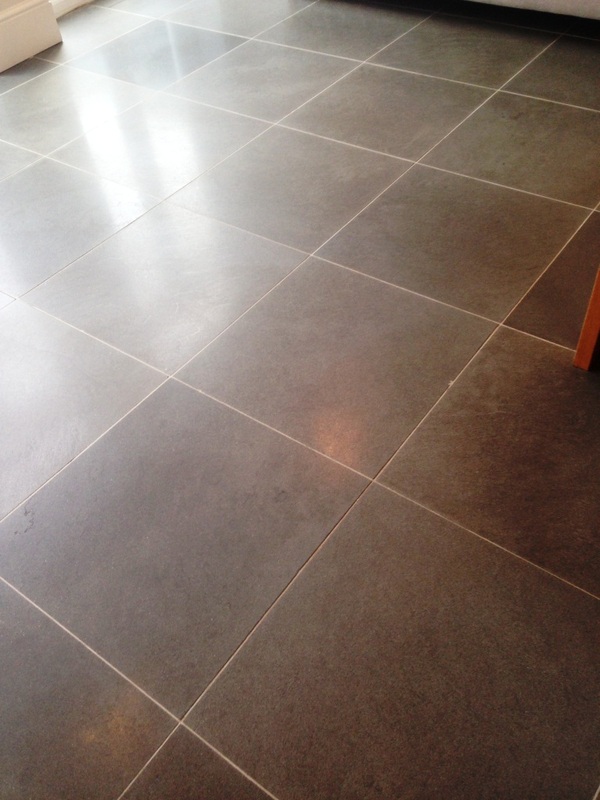 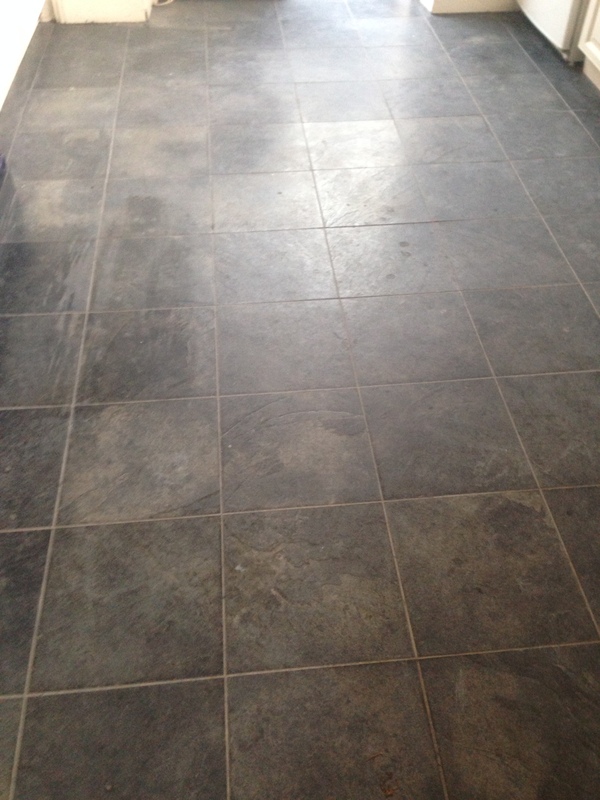 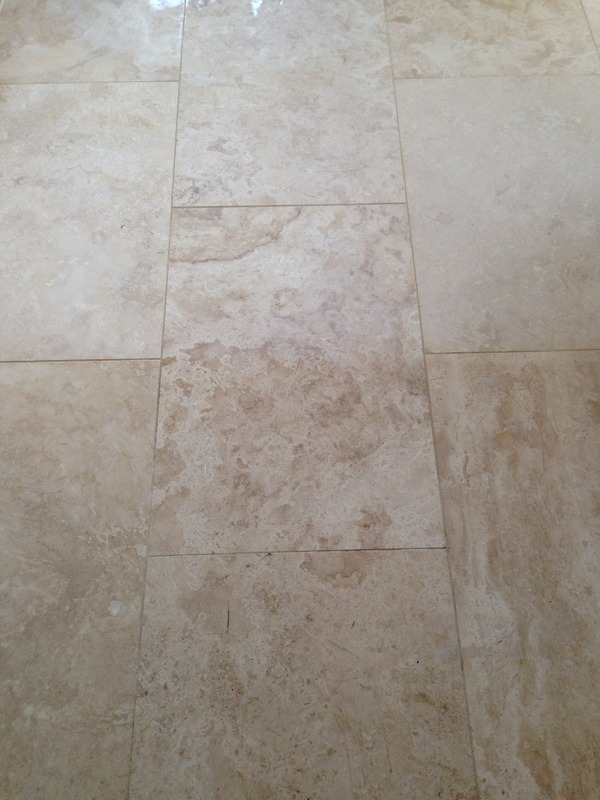 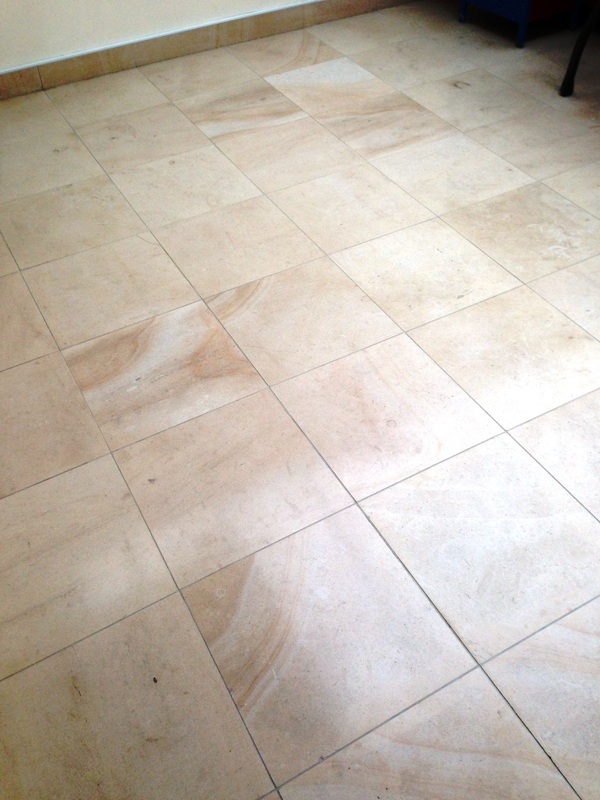 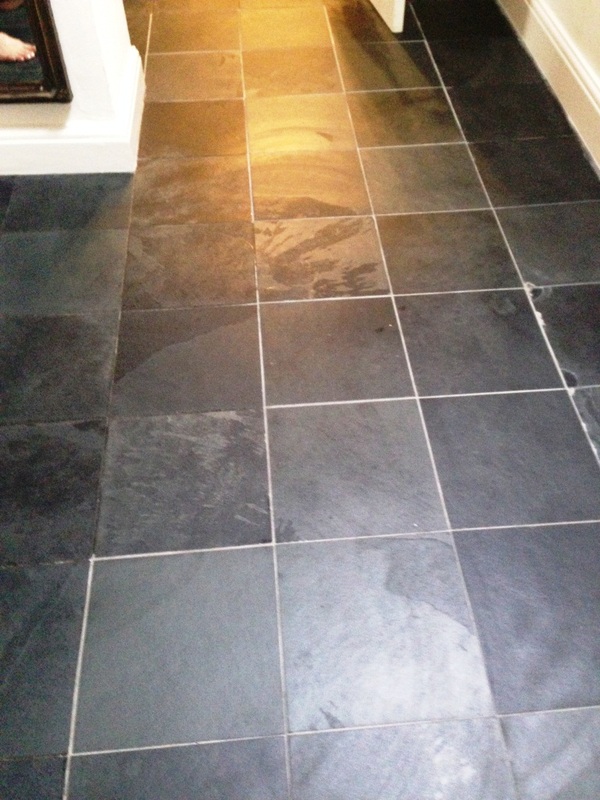 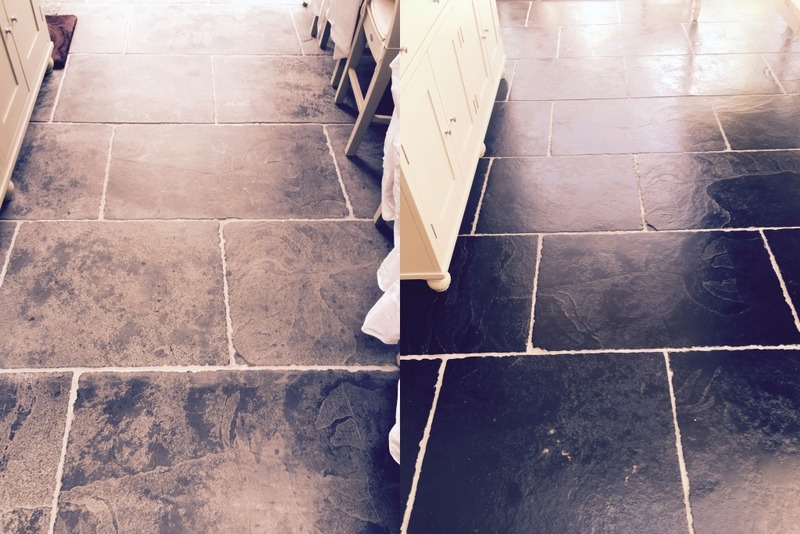 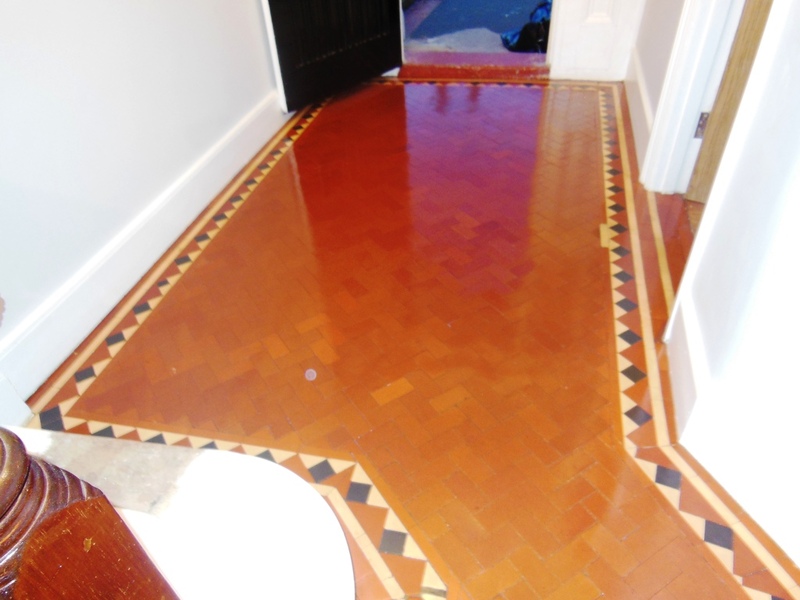 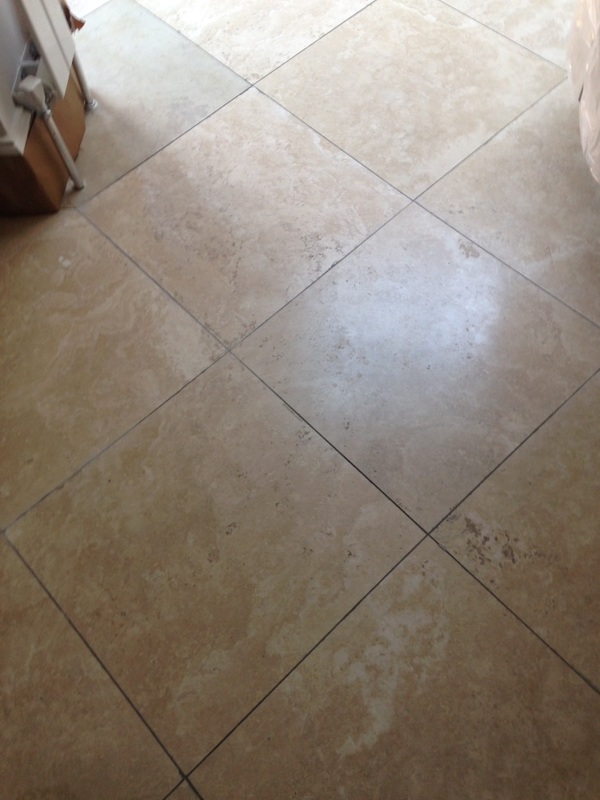 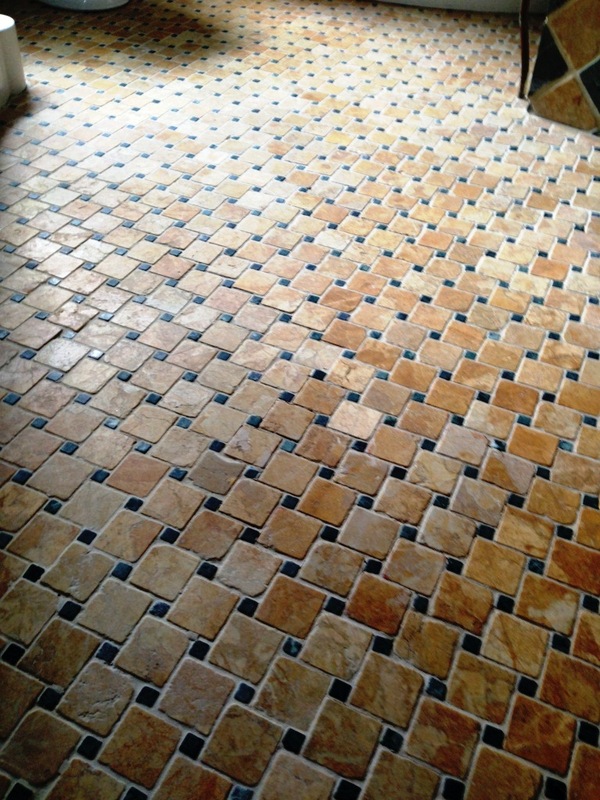 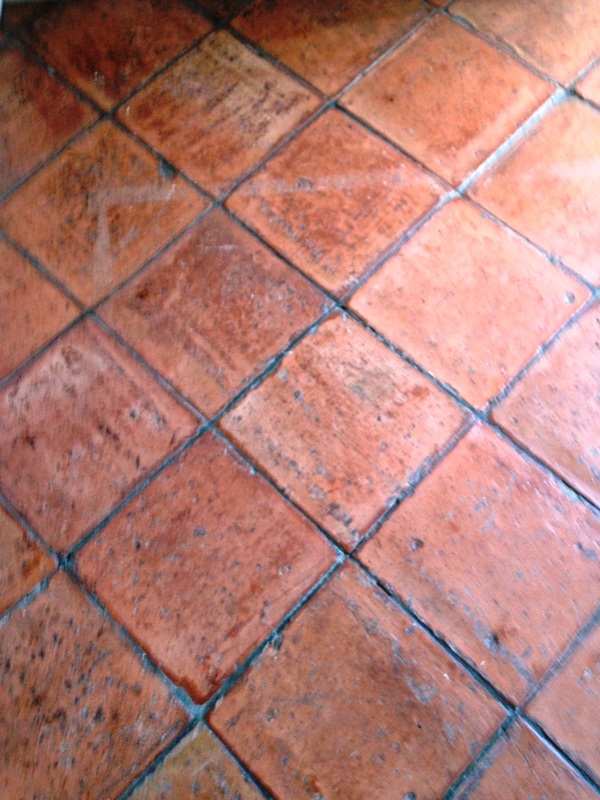 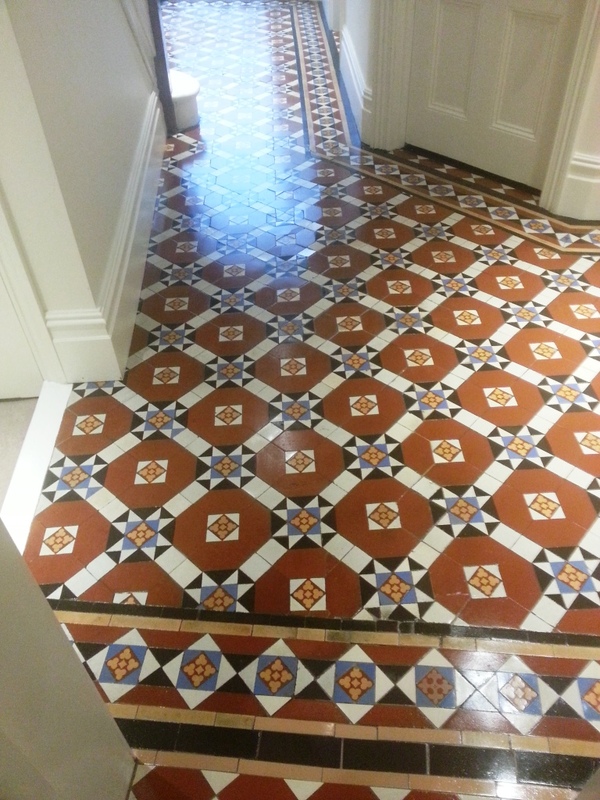 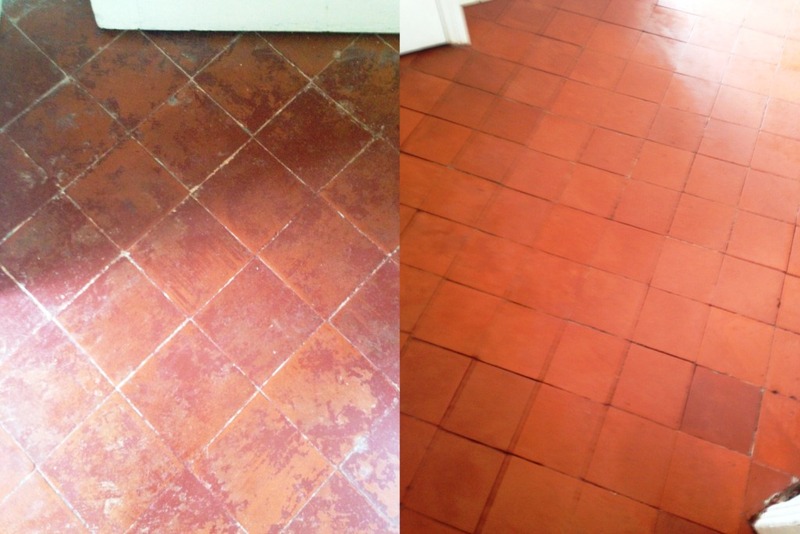 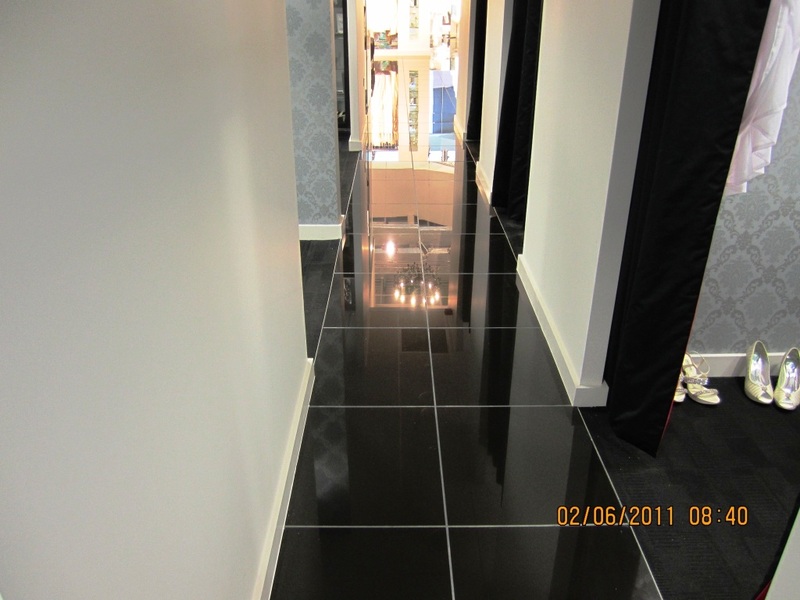 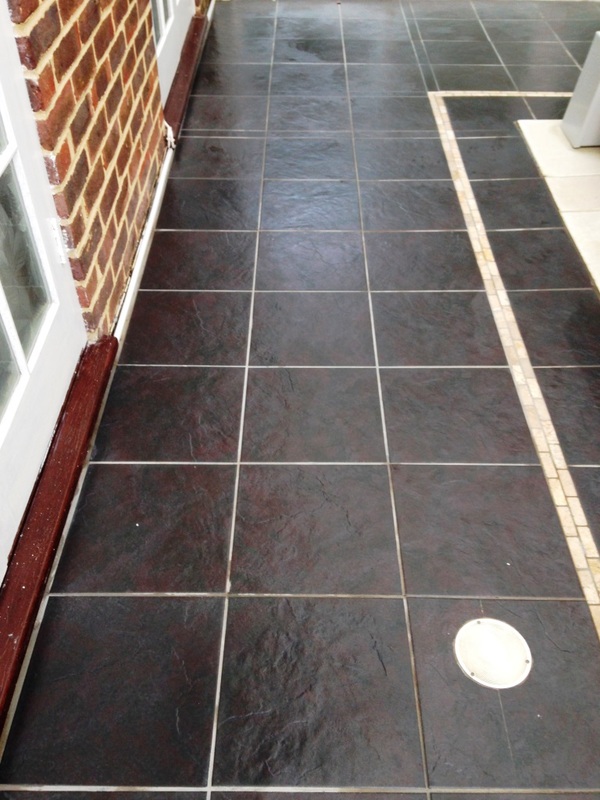 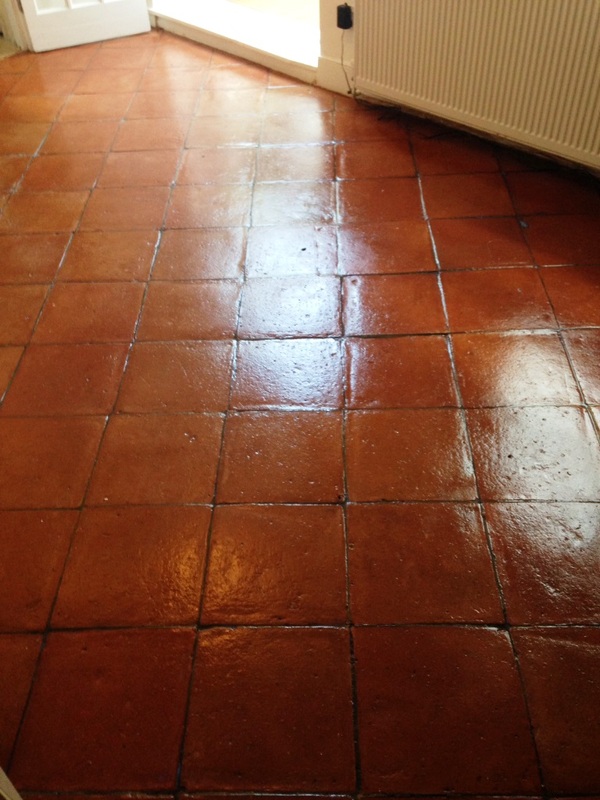 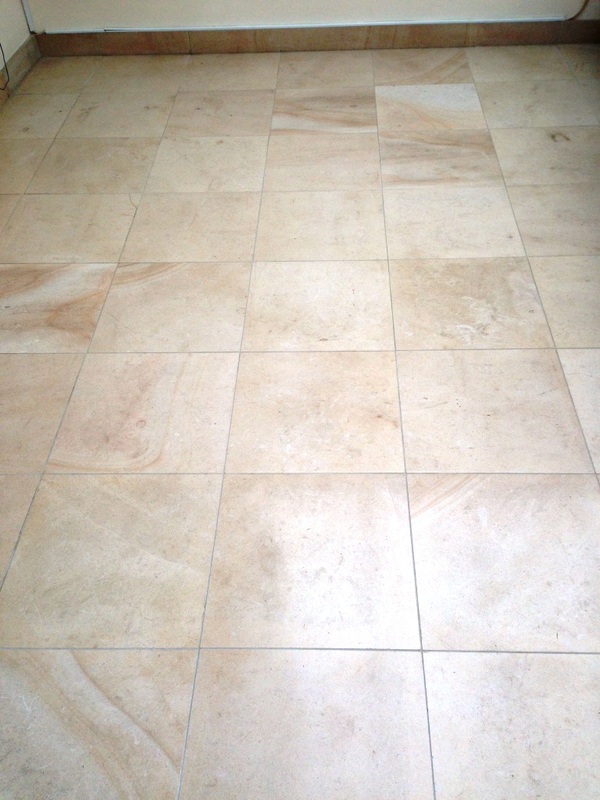 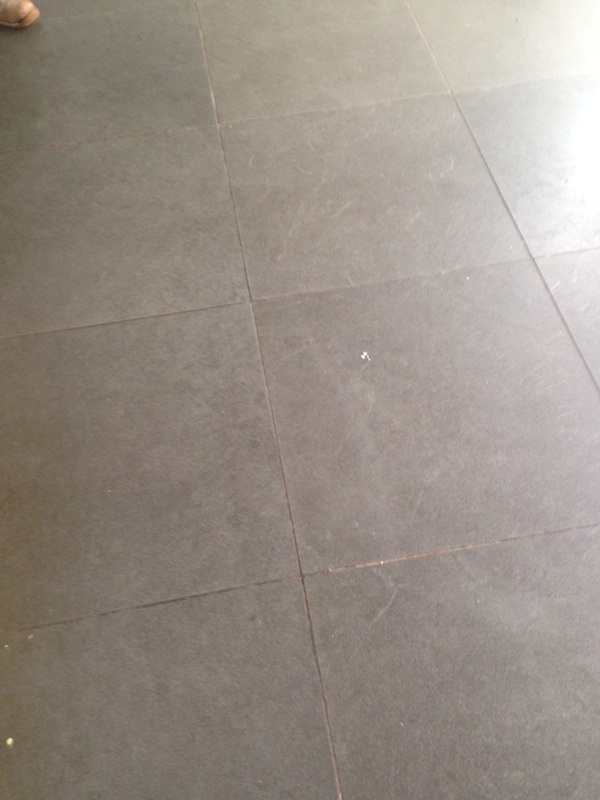 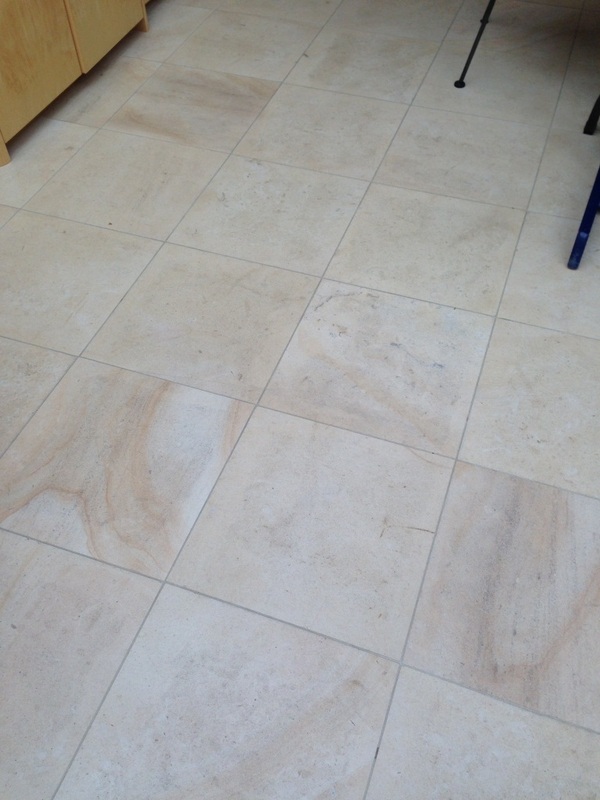 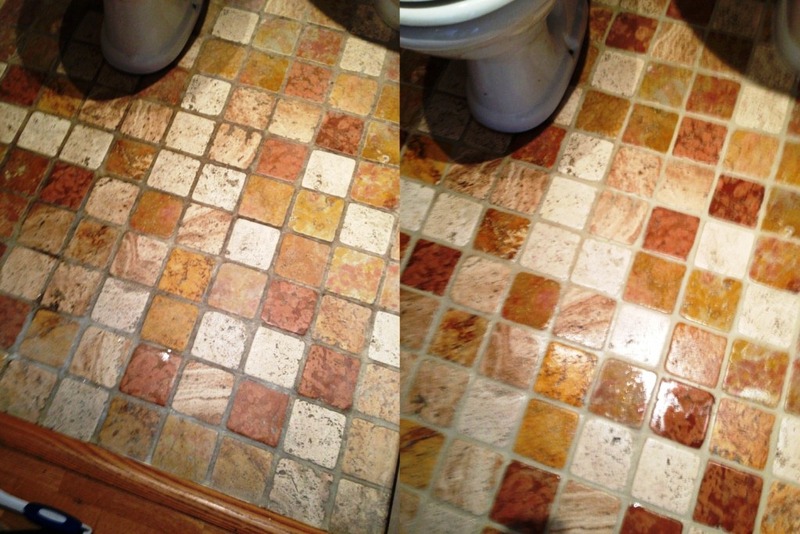 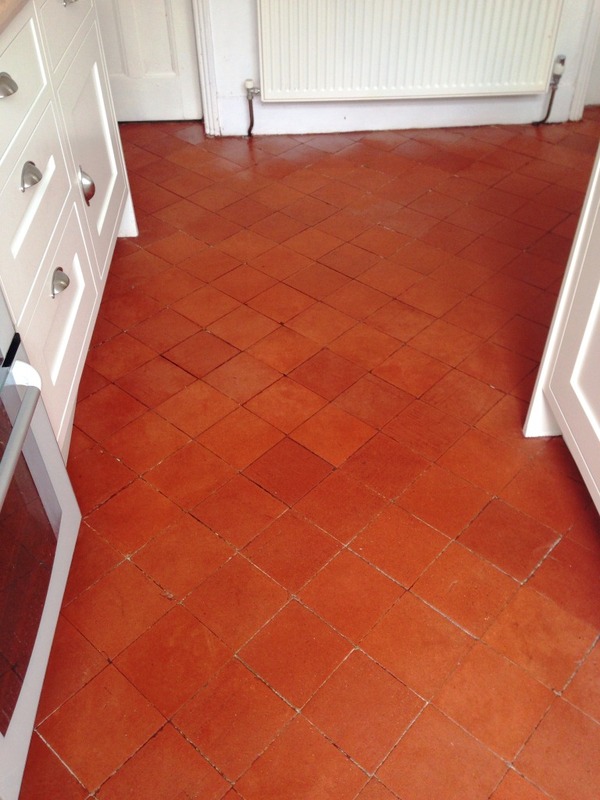 Another great Victorian tiled floor brought back to life, and and satisfied customer!